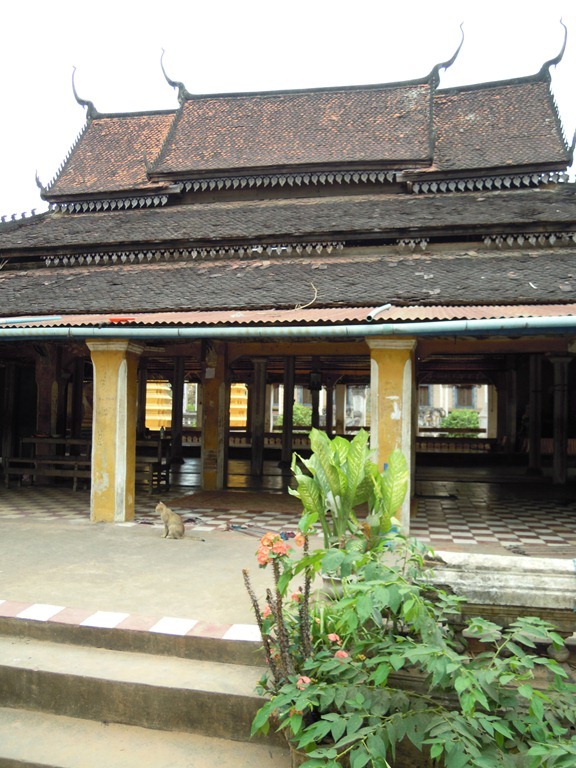 After our tour of Angkor Wat and a few other nearby temples, we were going to spend one more day in Siem Reap viewing some of the other local sites. These were: a dinner and traditional Khmer dancing, visiting local artisans, and seeing in biggest lake in Southeast Asia, Tonlé Sap. 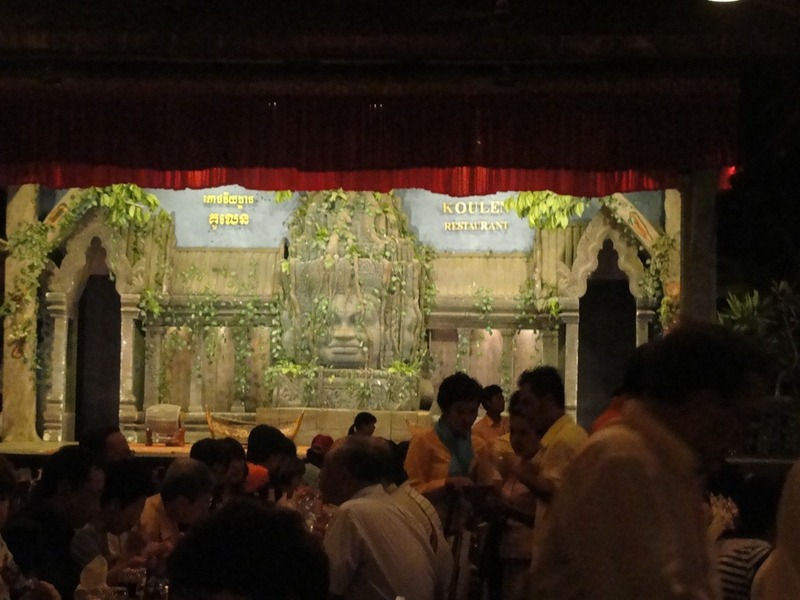 We started with the buffet and dinner show at the Koulen II Buffet & Apsara Dance Show. This is an enjoyable way to spend an evening. The buffet is huge, and priced at $12. There may be other places where the food is better and less expensive, but the buffet is extensive and the show will be good. 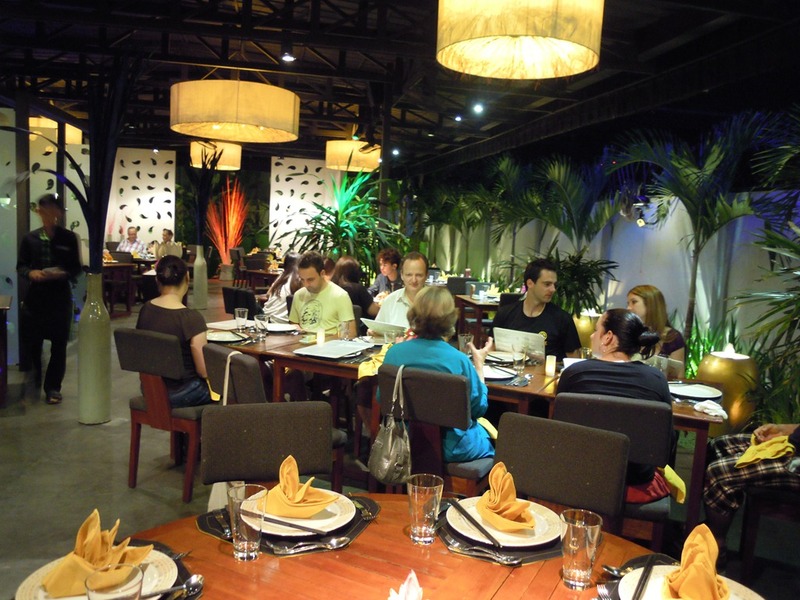 They offer enormous variety of foods: Khmer dishes, Vietnamese, Thai, Chinese and countless desserts including fresh fruits. You could not possibly try all the foods they offer, so we made a few selections and liked them all. 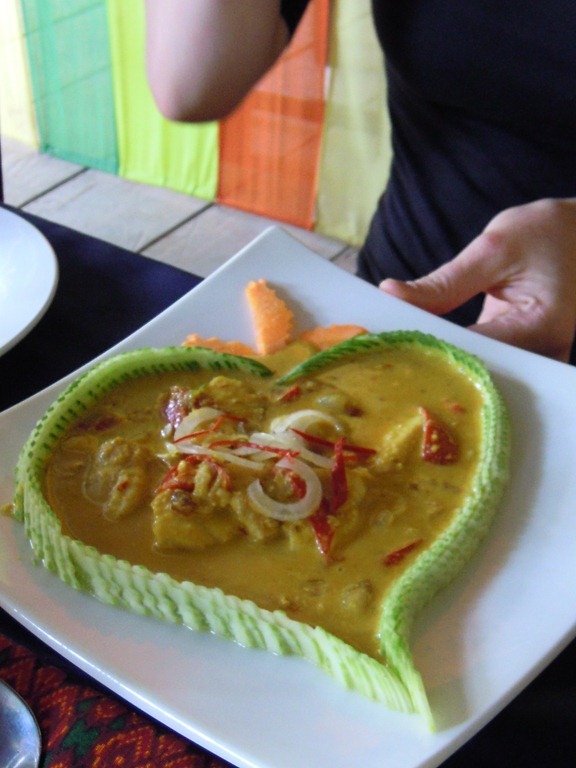 There are maybe 200 different dishes, and several live cookstations making fresh items to eat. Drinks are expensive, though, with a beer priced around $3. The show is from 7:30 to 8:30 PM. Be there at least by 7:00 to enjoy your meal. It can be crowded, and is a place were tour buses bring their guests. 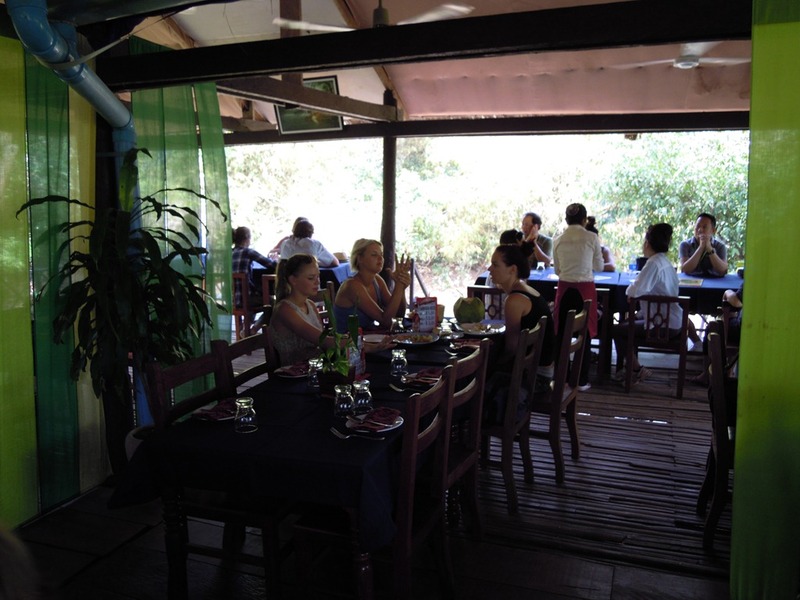 We didn’t have any trouble getting a table, or serving ourselves at the buffet. The line for freshly fried spring rolls was long, though. 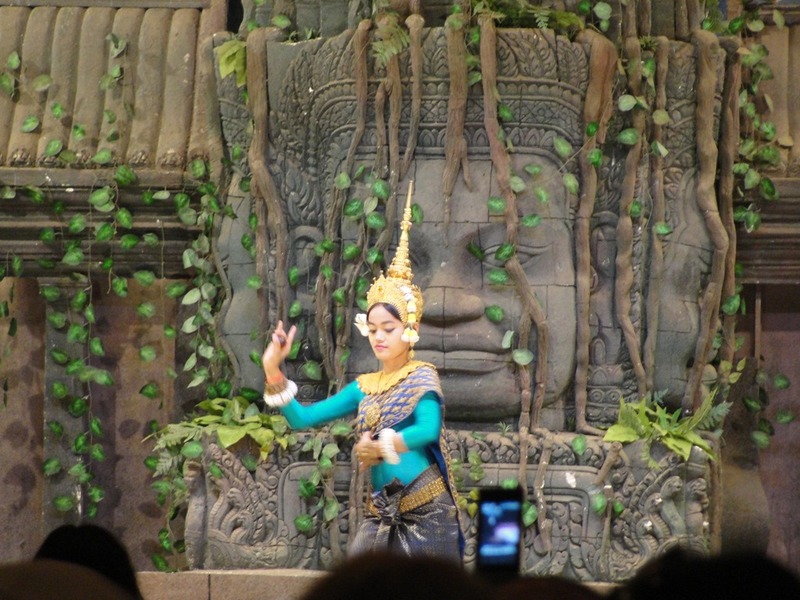 The stage in front of us was set as if from Angkor Wat, with the stone faces from Bayon, and the entranceways with their corbelled arches. 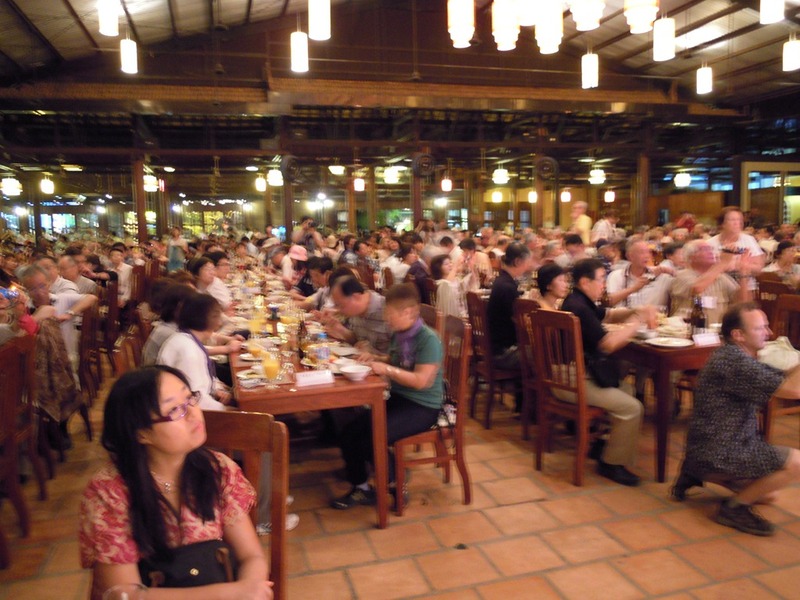 Many people were here, many tables were full. Then the dancing and music started. 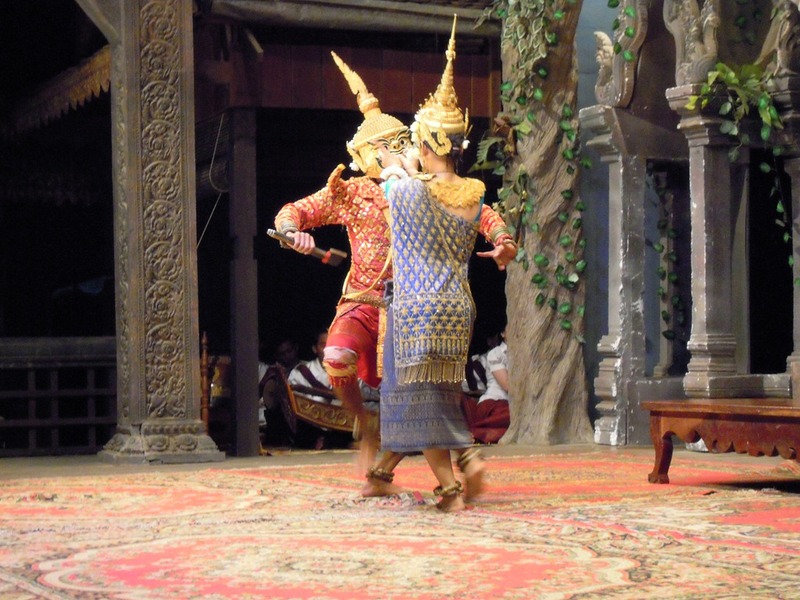 According to Wikipedia, Khmer classical dance is also referred to as “royal ballet” and “court dance,” because during French colonization it was mainly performed by concubines, relatives, and attendants of the palace. 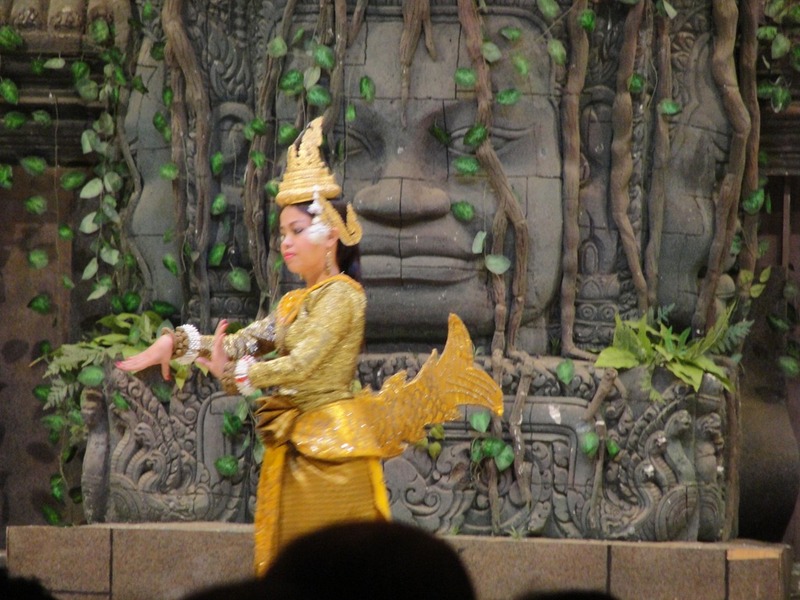 The dancers are called Apsaras, like the sculpted figures at the Ankgor Wat complex. 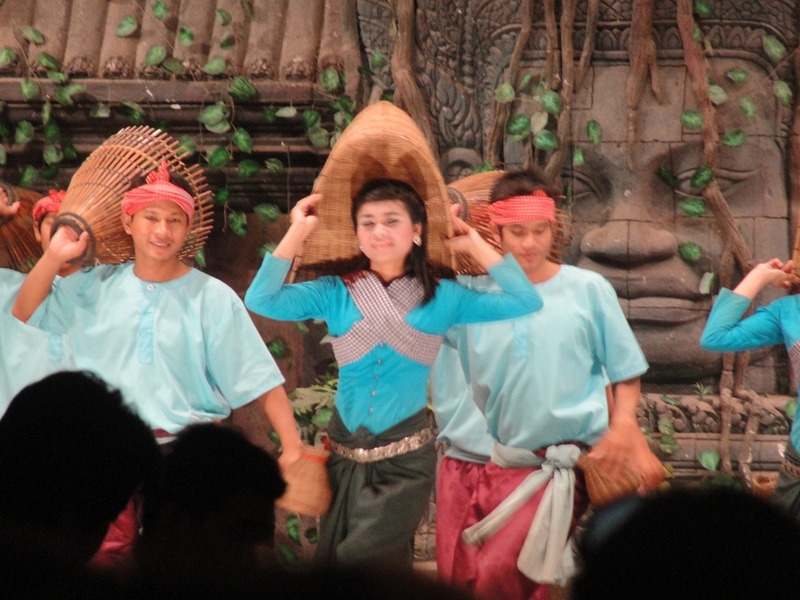 Khmer classical dance goes back as far as the 7th century. 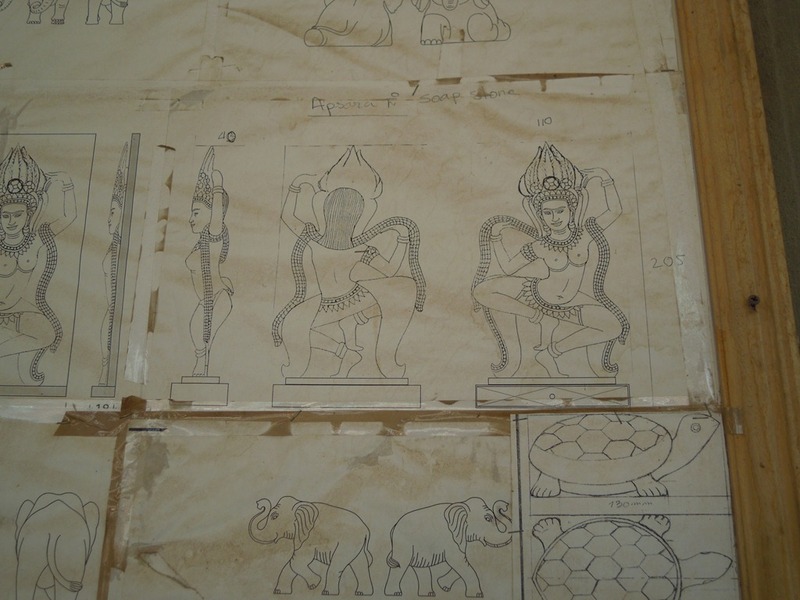 Apsaras can be seen on various Angkor temple walls, as was shown in the previous post on Angkor Wat. 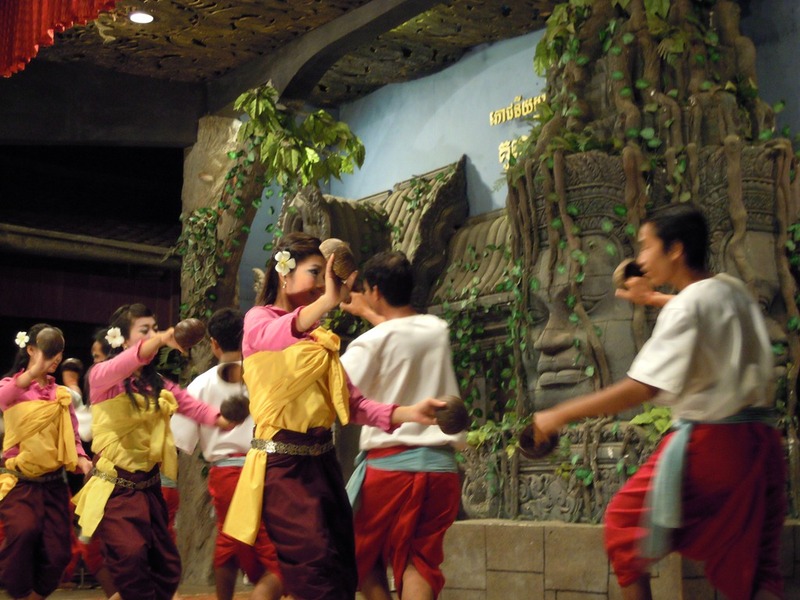 Temple dancers served as entertainers and messengers to the divinities. 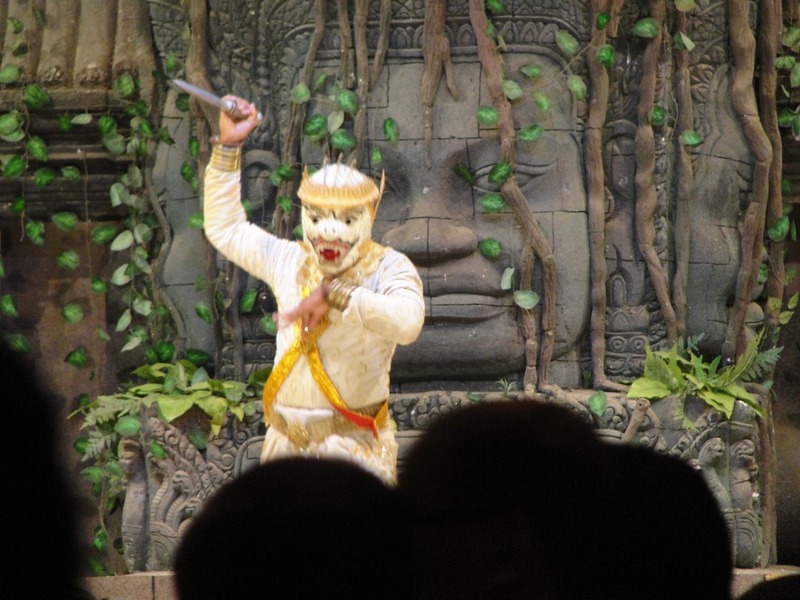 During the 15th century, the dancers, priests, and artisans were taken away when Angkor fell to the Siamese (Thai) kingdom of Ayutthaya. 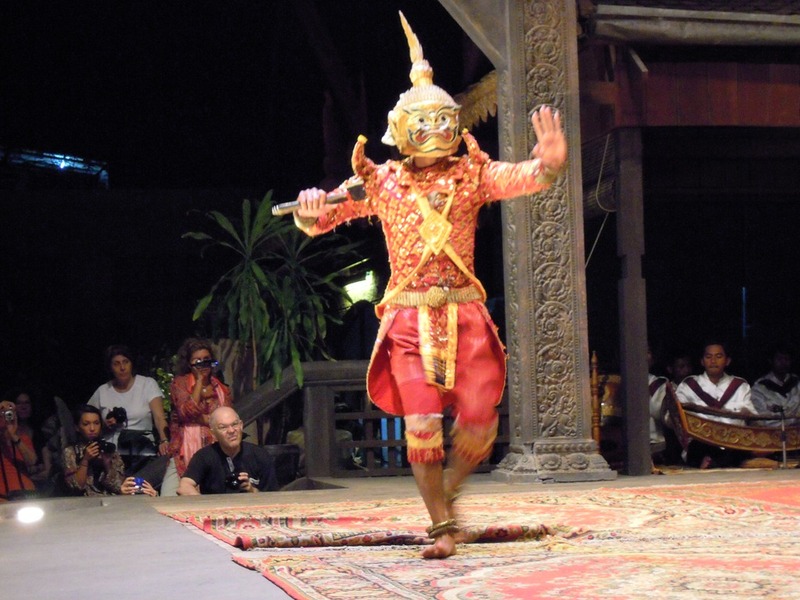 But the worst blow was between 1975 to 1979 when the Khmer Rouge killed 90% of all classical artists because dance was thought of as aristocratic. Survivors somehow managed to find each other to keep alive this ancient tradition. It is they who trained these dancers. 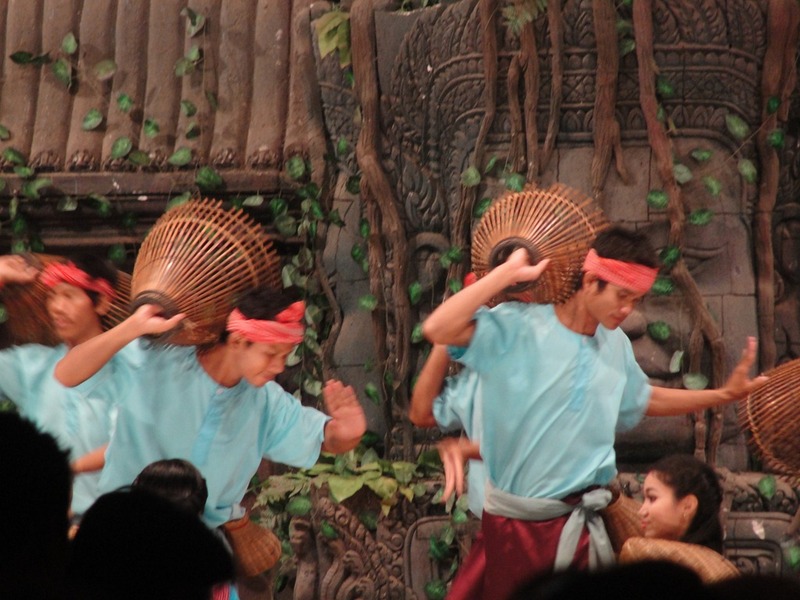 The dance program started with what seemed like a village dance, the boys and girls dancing together, clicking coconut shells and flirting with one another. This shot from near the stage. You can see many people in the audience, most paying attention to the dancers. More of the coconut dance. 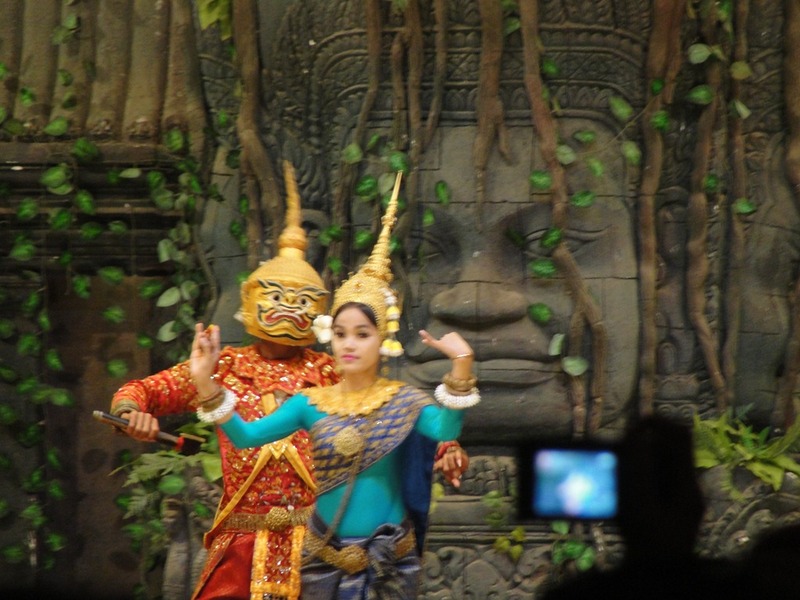 Next was a more traditional Cambodian dance, with the Apsara dancer in traditional dress, with traditional hand positions and movement. Then onstage comes a woodcutter with an axe. They dance, she seems both afraid of him and attracted to him. He wins her love and is happy. Another villager dance, with flirting boys and girls. And a beautiful damsel, this time a fish. Once again they interact. If we understood the language of the hands, we probably could follow the story better. And they leave together. Ahh, true love triumphs. 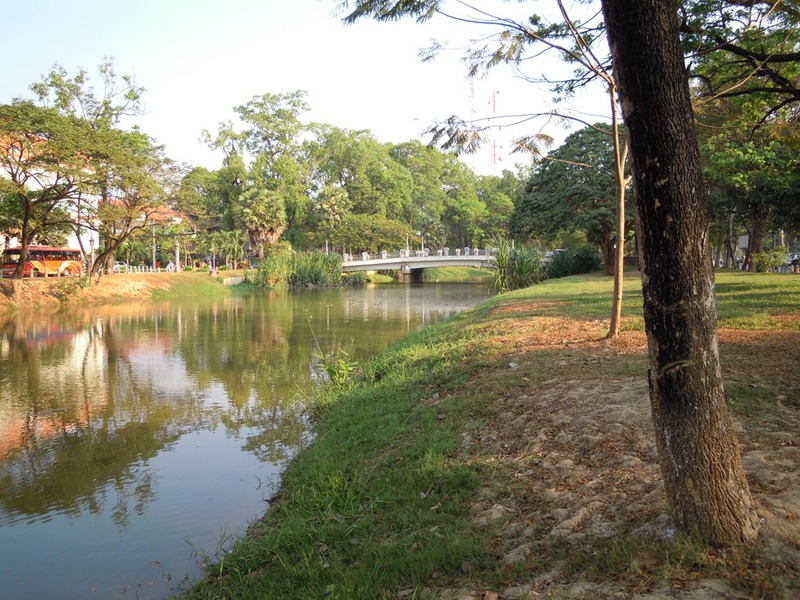 The Siem Reap River runs through the city. 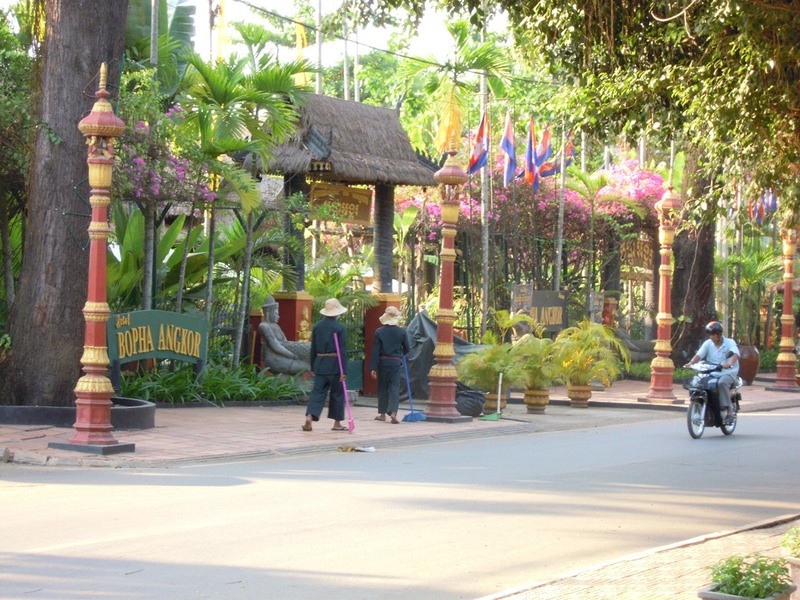 They take good care of it, and use it as part of the attractive environment for tourists. There are a number of good hotels on this river. 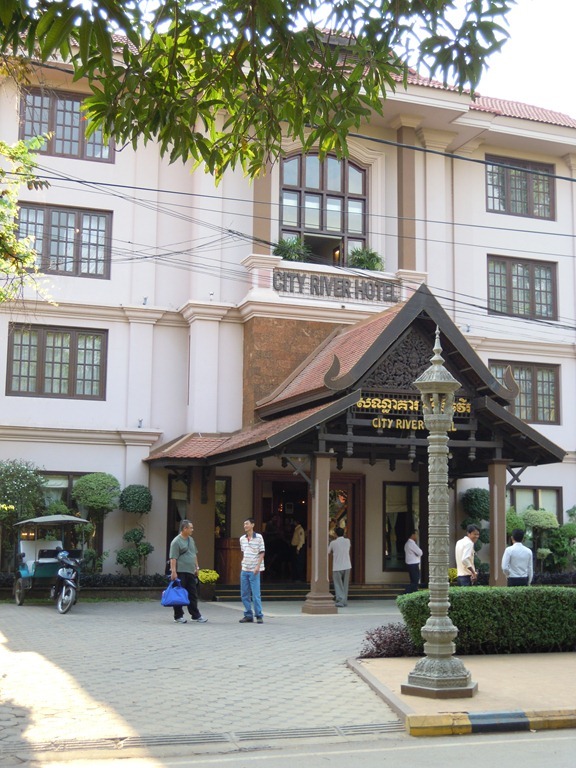 Like the one we stayed at, the City River Hotel. It is a good place. Another nearby hotel front on River Road, colorful, picturesque. 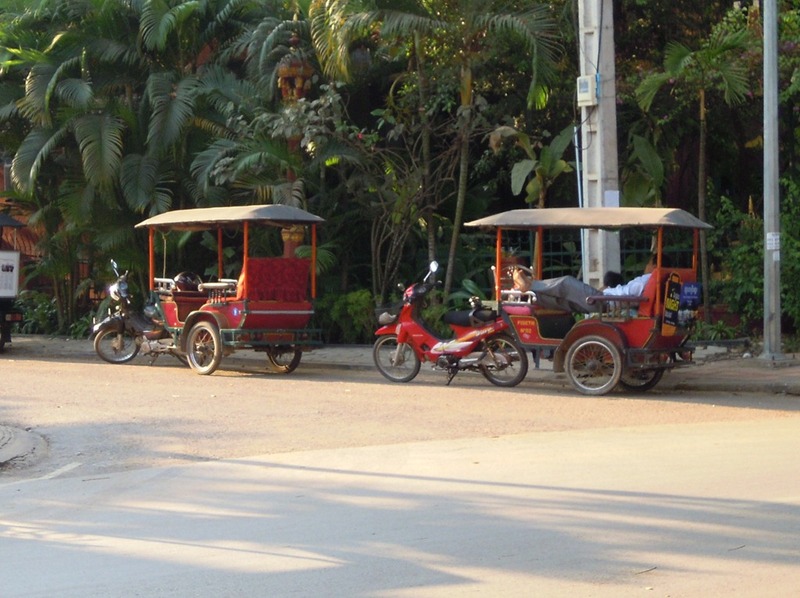 The local taxis in Cambodia are Tuk Tuks. These are motorcycles pulling a cart with seats, with a roof to block the hot sun. 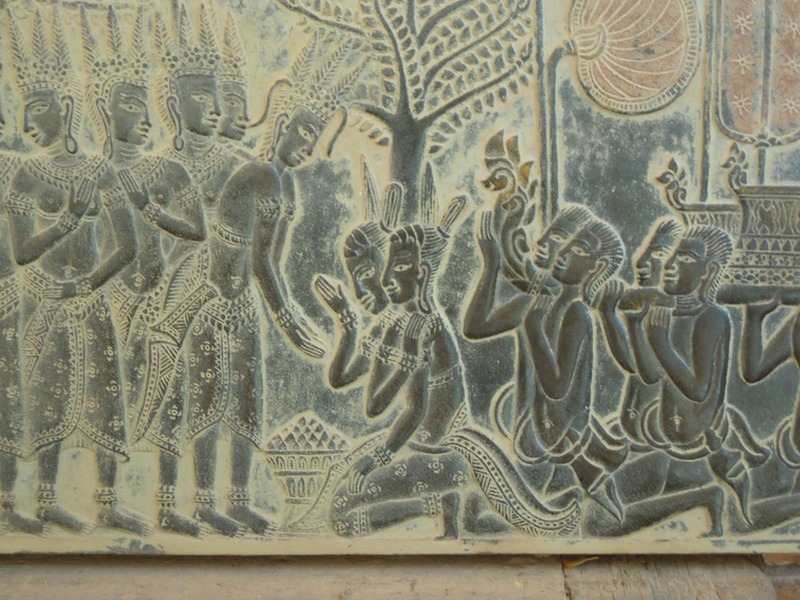 In the hotel (and many other places in Siem Reap, I think) is this wood carved bas-relief, showing a scene from the carvings at Angkor Wat. 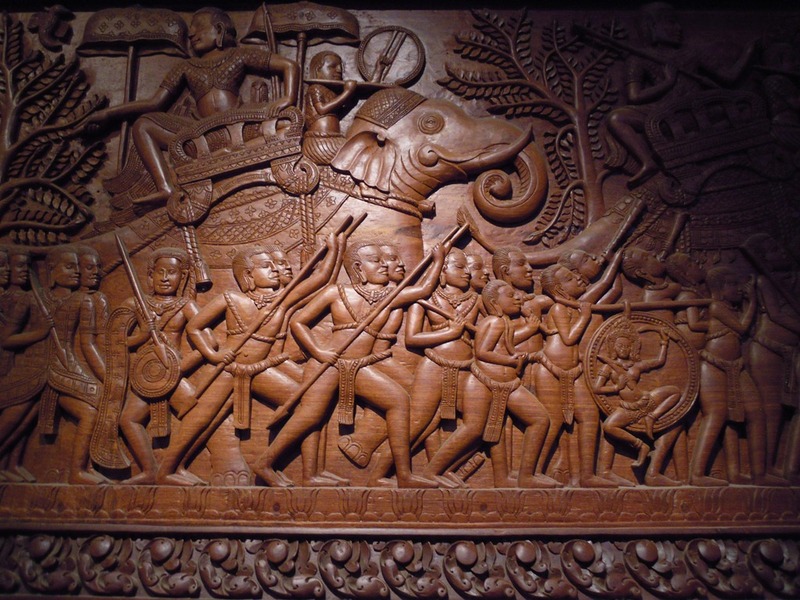 This is the procession of the triumphant King Suryavaman II, the builder of Angkor Wat, after defeating the Champa army. This is the bus we have been using for the last few days. 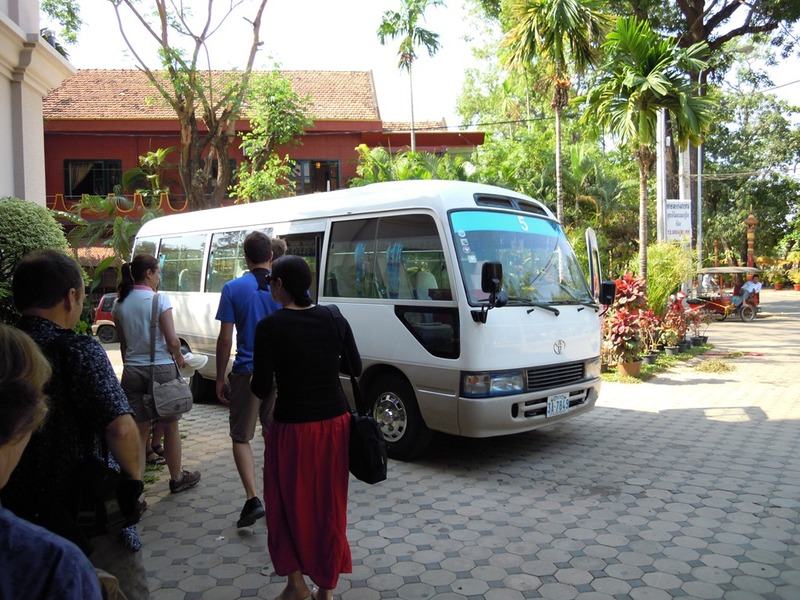 Private bus, clean, air conditioned. As we drive through the city the are many high quality hotels. When the Angkor Empire was at its peak, thousands of craftsmen erected what is now considered one of the wonders of the world–the Angkor temple complex. 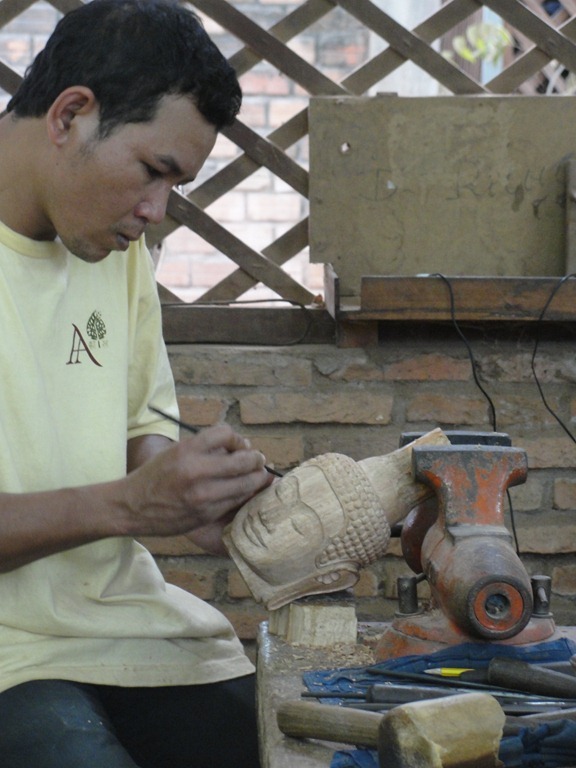 In more recent times, years of war and genocide under the Khmer Rouge decimated this artistic tradition. With it disappeared a vast body of skills and expertise. 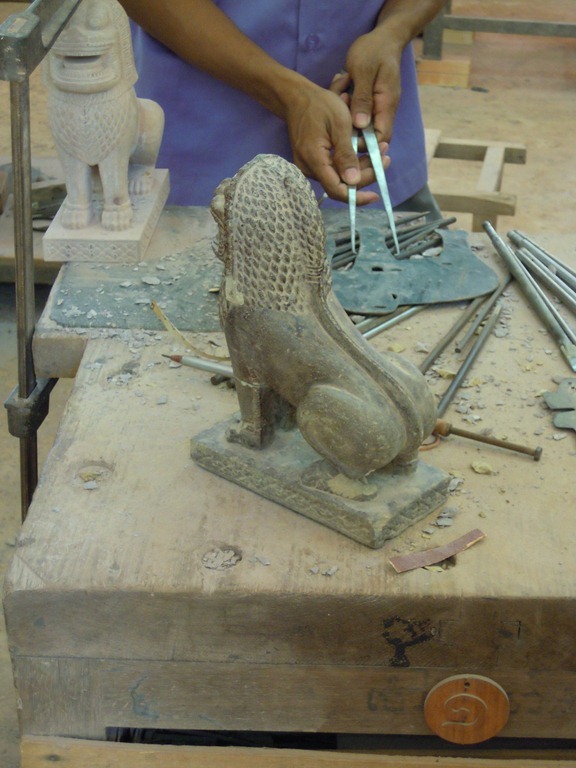 The Chantiers-Écoles de formation professionnelle, a professional training school, was founded to help young Cambodians rediscover traditional handicrafts and give them the opportunity to take part in the rebuilding process their country had undertaken. The CEFP is a public institution which was established in response to an urgent need to train disadvantaged young people with little formal education, living for the most part in rural areas, and offer them a job entry program. 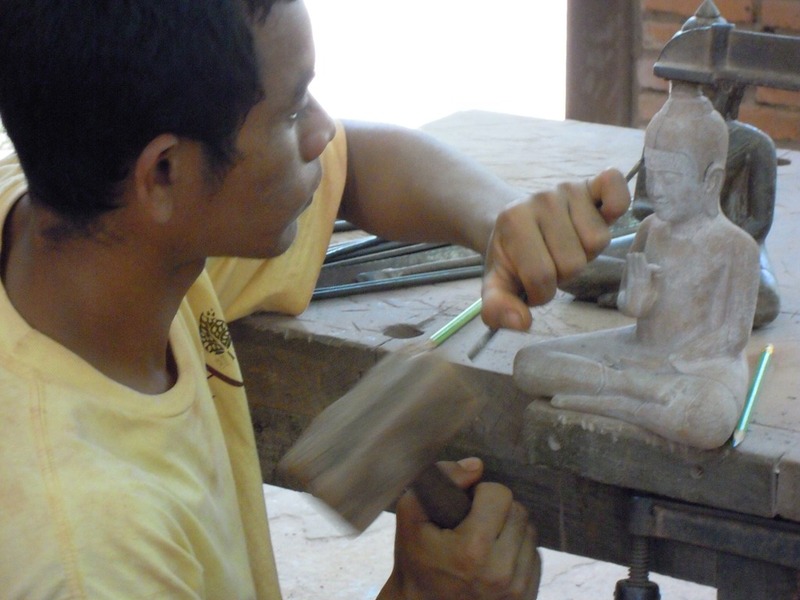 Artisans d’Angkor was established as an offshoot of the Chantiers-Écoles project as a school-to-work transition for the young craftsmen that had been trained. 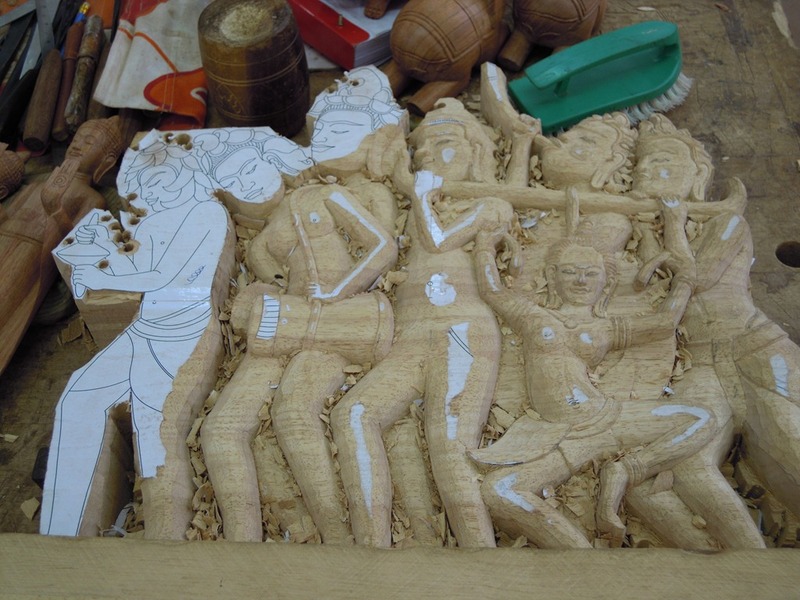 The skilled artisans could thus be organized into a self-sustaining handicraft network. 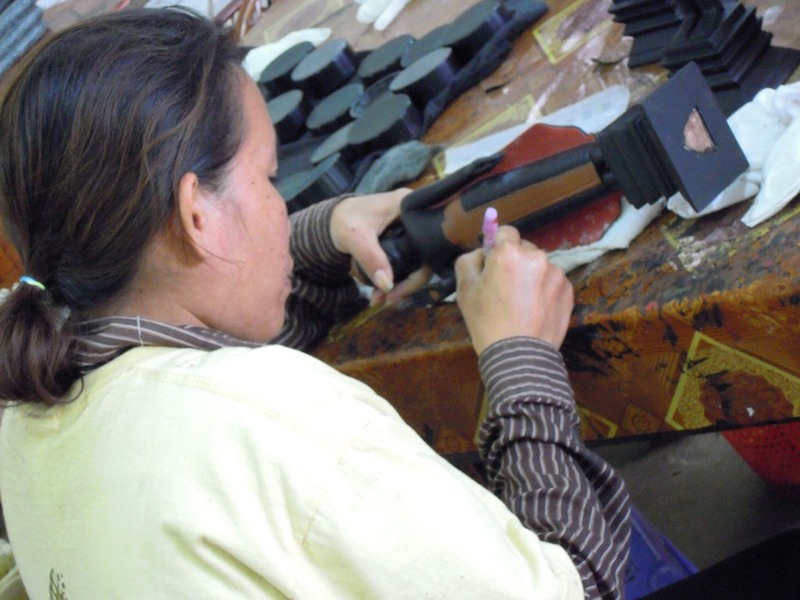 Training and work experience is provided in silk production and weaving, silver and bronze craftsmanship, stone and wood carving, and lacquer painting. The story of silk began more than four thousand years ago in the court of China’s first emperor. it is said that a young concubine named Lei Tsu, by way of experiment, has discovered the ‘finest natural textile thread known to man’. The art of weaving silk, first restricted to members of the imperial court, spread to lower levels of Chinese society and achieved widespread fame. Gradually a trade route to the West emerged. A tortuous passage known as ‘silk road’ wandered through hostile lands and ended thousands of miles away at market places in the Middle East. 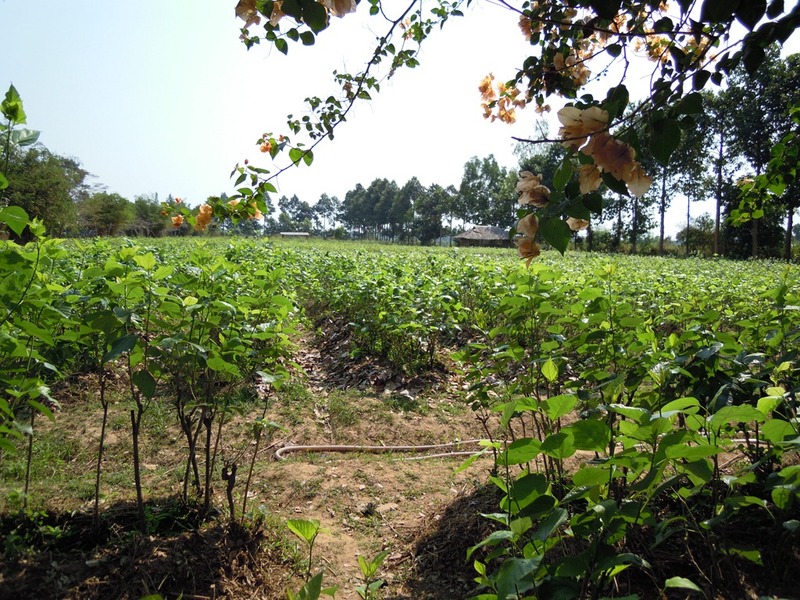 For centuries only the Chinese knew the secrets of silk production and the exportation of silkworms was strictly forbidden. Around 140 BC silkworm eggs and and mulberry cuttings reached Khotan, in present-day Afghanistan, allegedly smuggled by a Chinese princess who went to marry the king and found the prospect of a silkless life unbearable. 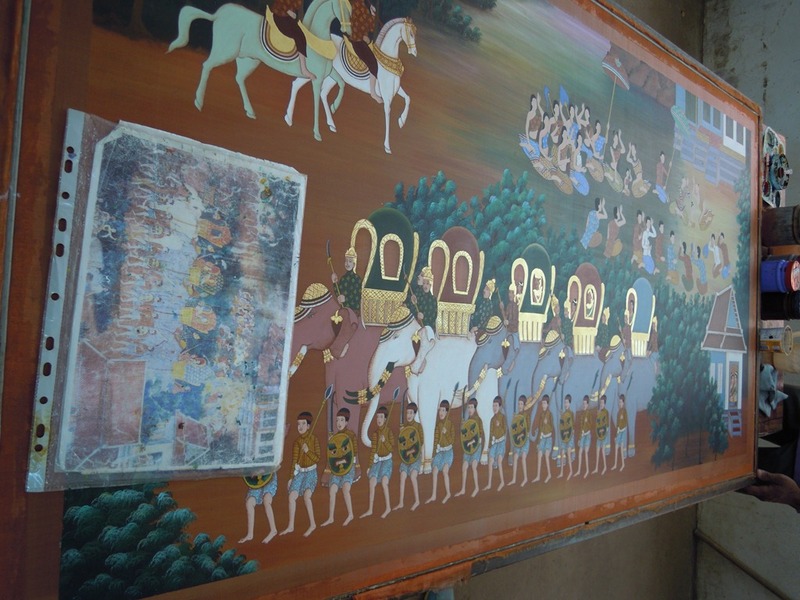 From then it went to India and a century later to Korea and Japan; around the same time the art was moving south with Chinese minority groups into present-day Indochina and Thailand. 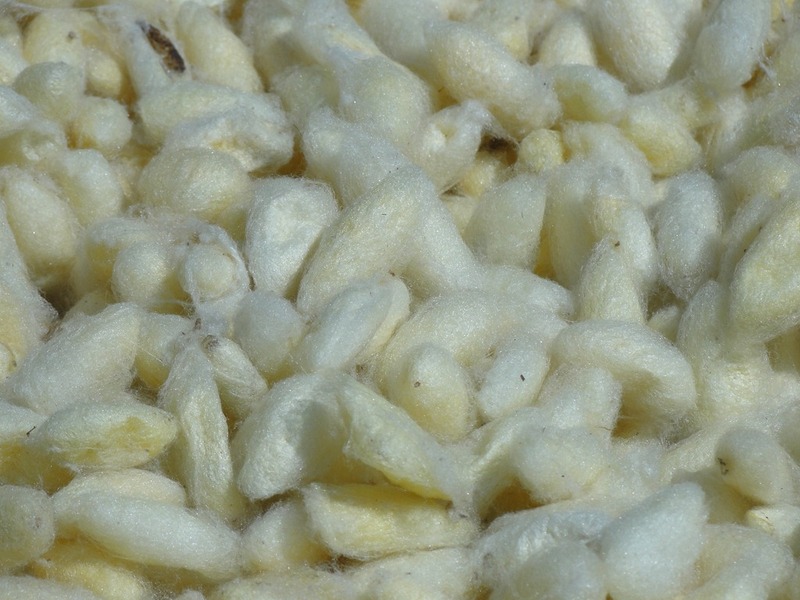 The process of making silk has not changed much in the thousands of years since the silkworm’s thread was first used in ancient China. 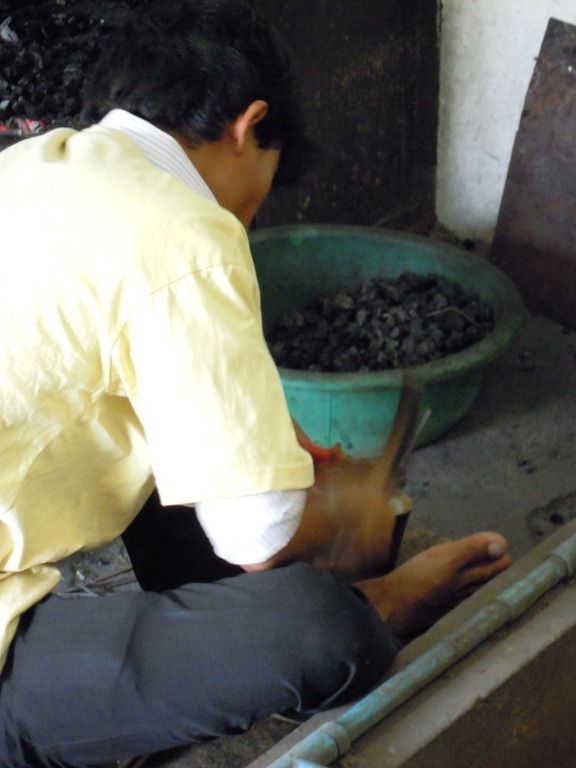 The practice began in China in about 2600 BC. 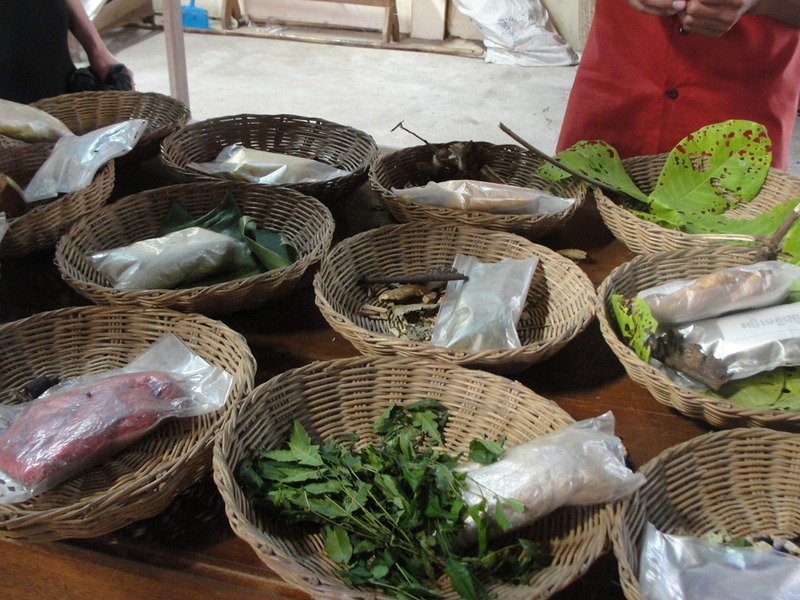 It starts with silkworms eating and growing on mulberry leaves, then forming cocoons, made of silk thread. 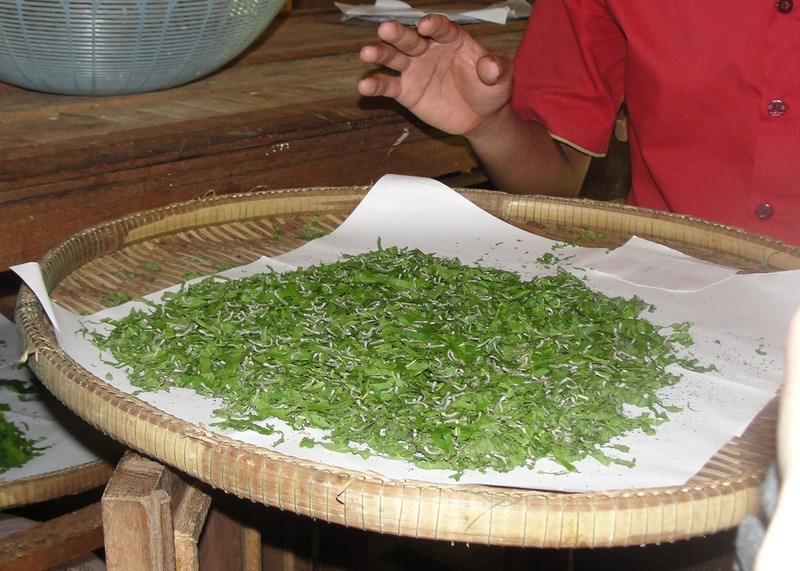 The practice of raising silkworms is called sericulture. 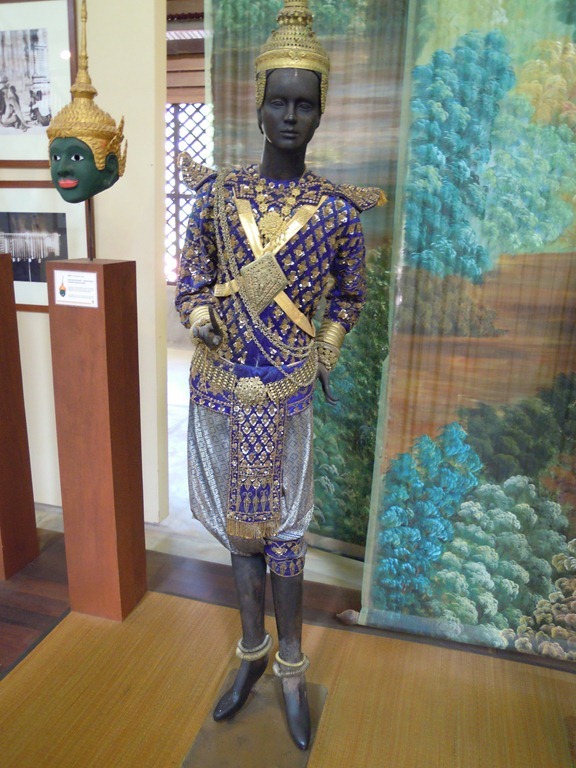 Cambodian silk comes in a rich variety of textures, motifs and complexions: phamung (silk fabric in plain color), chorebap (silk brocade), hôl (silk with colorful patterns) and hôl lboeuk (hôl combined with a brocade fabric). 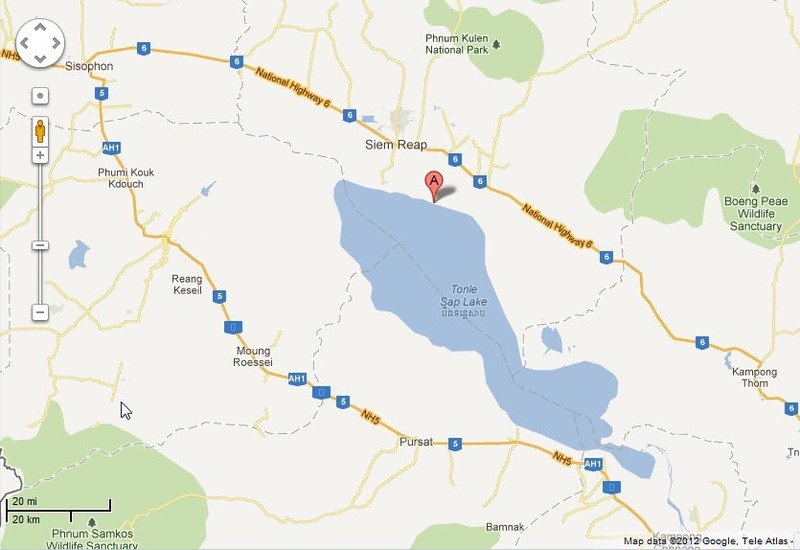 The silk facility is about 15 km out of town, a short drive. The grounds were beautiful, to be attractive to Western visitors (with money to spend). 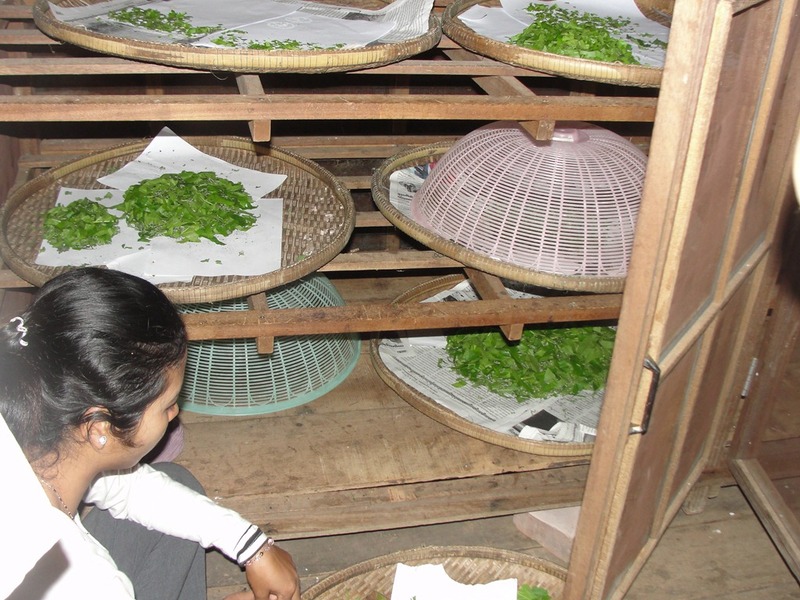 A big part of the process is growing mulberry leaves, the only food that the silkworms will accept. The flat trays are covered and placed into a cabinet. They are fed chopped mulberry leaves for about a month. During the final few days before the worms spin their cocoons, the worms may need to eat ten times a day. 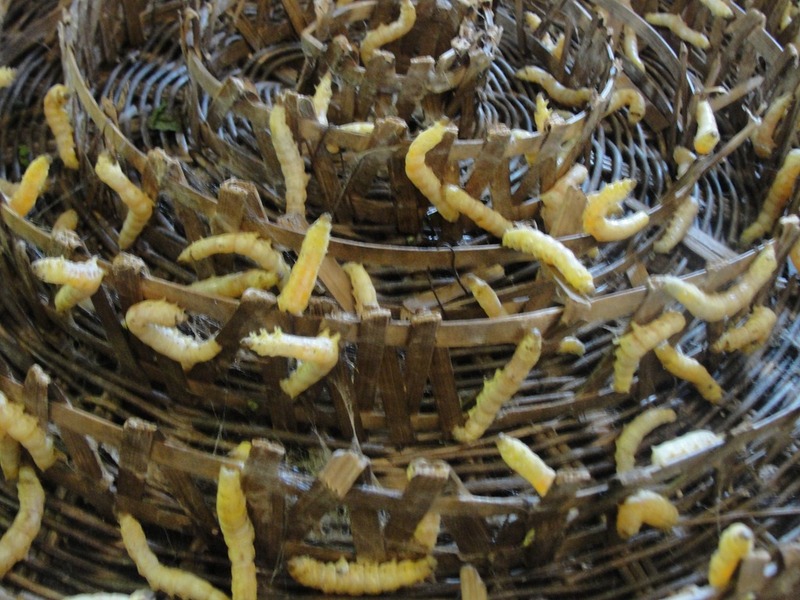 The silkworms grow to full size and will make cocoons – in this specially constructed basket. Within 2–3 days, the caterpillar spins about 1 mile of filament and is completely encased in a cocoon. 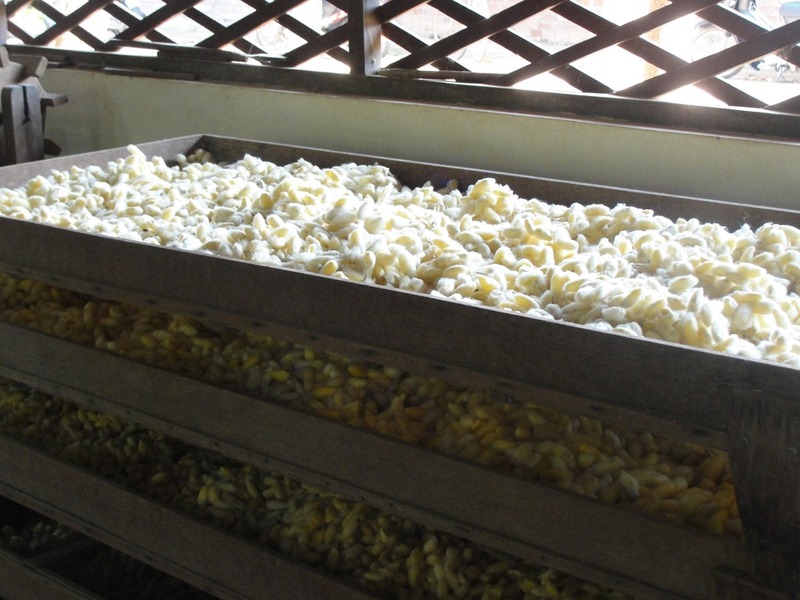 It takes about 25,000 cocoons to make half a kilogram of raw silk. They let some cocoons go ahead and develop. If you look closely here you will see small holes through which the moth emerged. 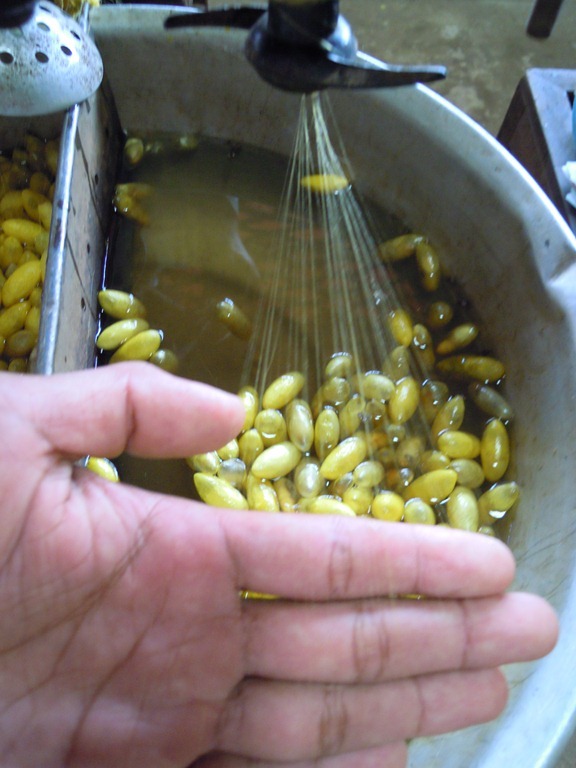 I think these kind of cocoons have little value, since they do not have the long continuous silk thread. They need to do this, so they will have some mature moths. The moths lay tiny eggs, shown below. 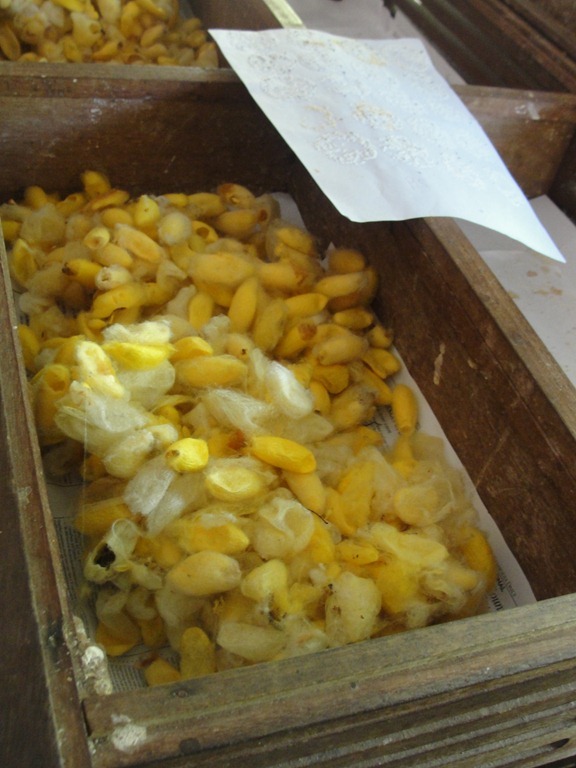 These hibernate for three months, then they are hatched for more silkworms. 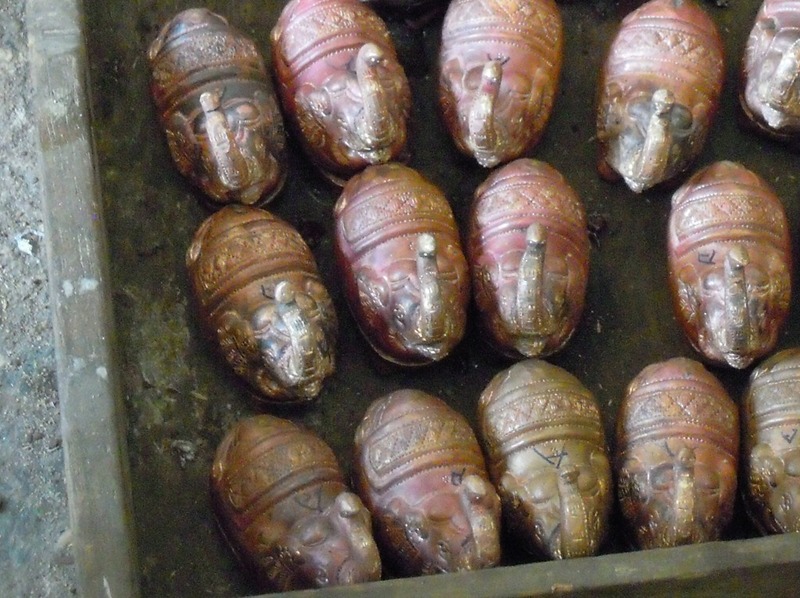 Here are cocoons, fully developed. 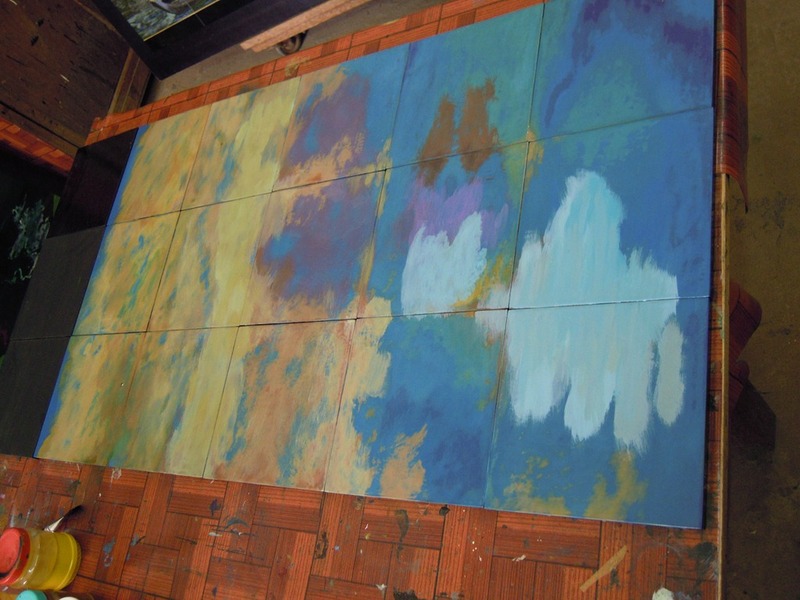 These are being put in sunlight before the next step. I think the hot sun kills the caterpillar inside them. 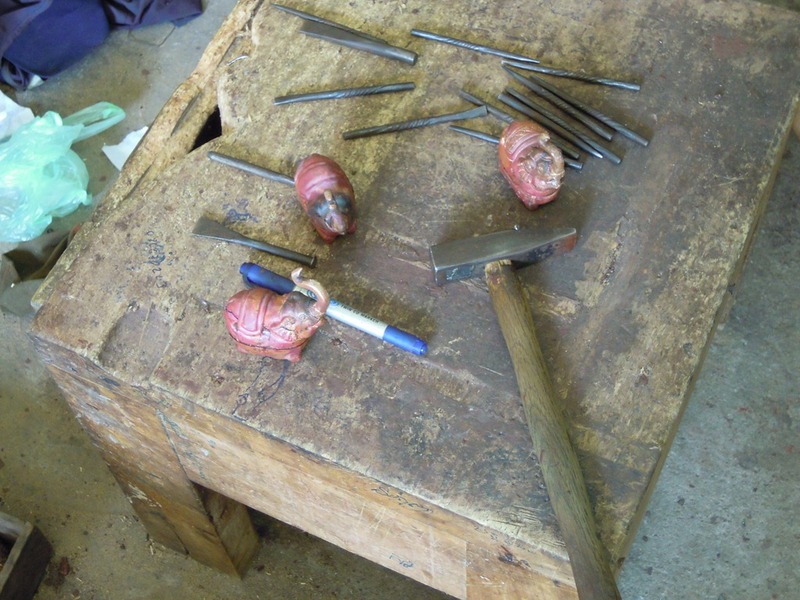 You can see that these cocoons are intact, the worm has not emerged. 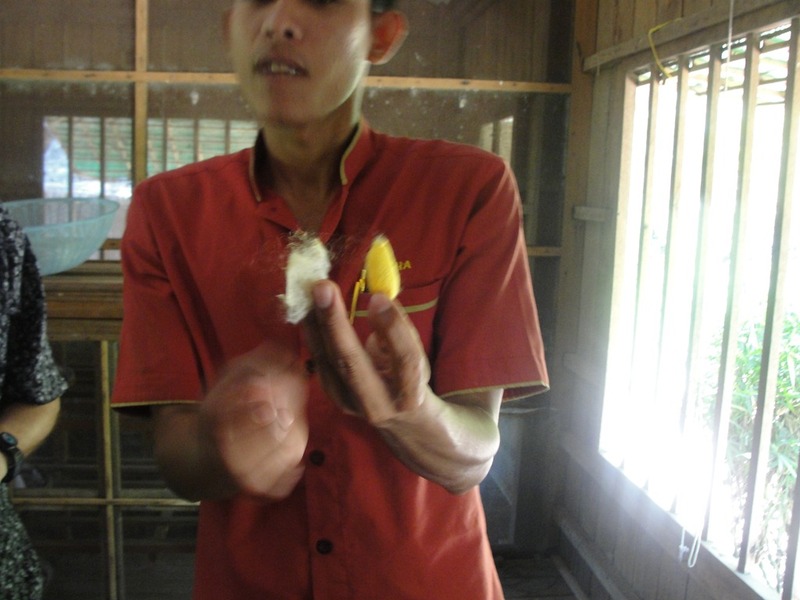 The cocoons are held together by a gooey substance called sericin (also known as silk gum). 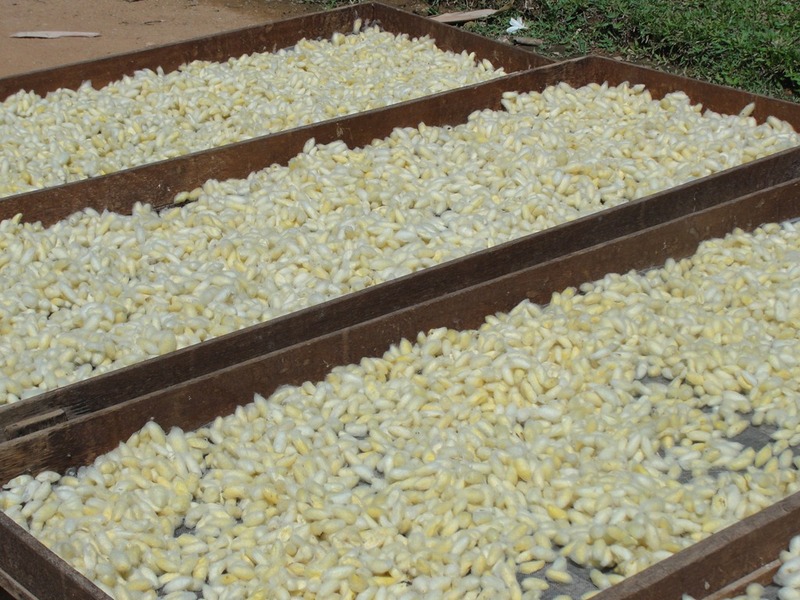 To separate the silk fibers, the cocoons are soaked in both hot and cold water to soften the sericin. 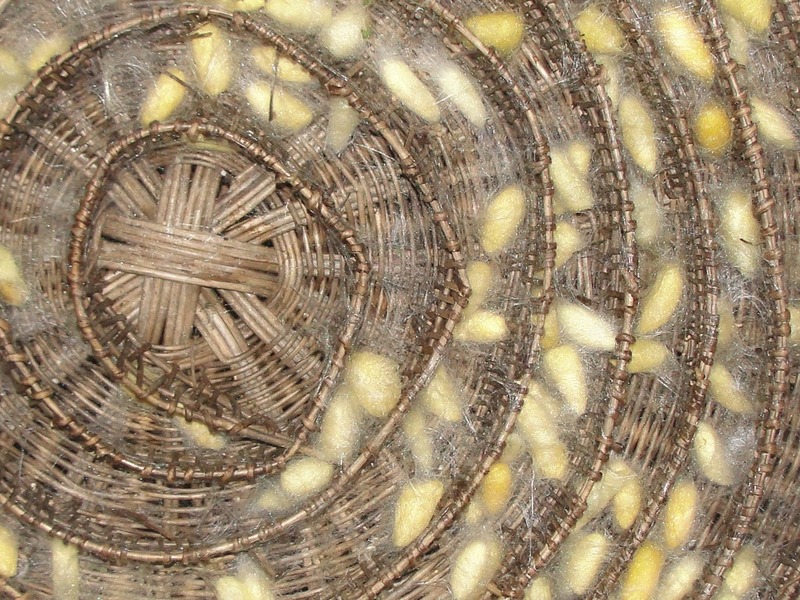 Once the sericin has been softened, the silk fibers are unwound to produce a continuous thread. Because an individual thread is not strong enough, at this point several are wound together as they are ‘Reeled’.’ A special tool catches the end of the thread on the cocoon so the thread can be unwound. Below, two cocoons are shown. On the right is the complete cocoon, yellowish in color. This thread is woven into “raw” silk thread. 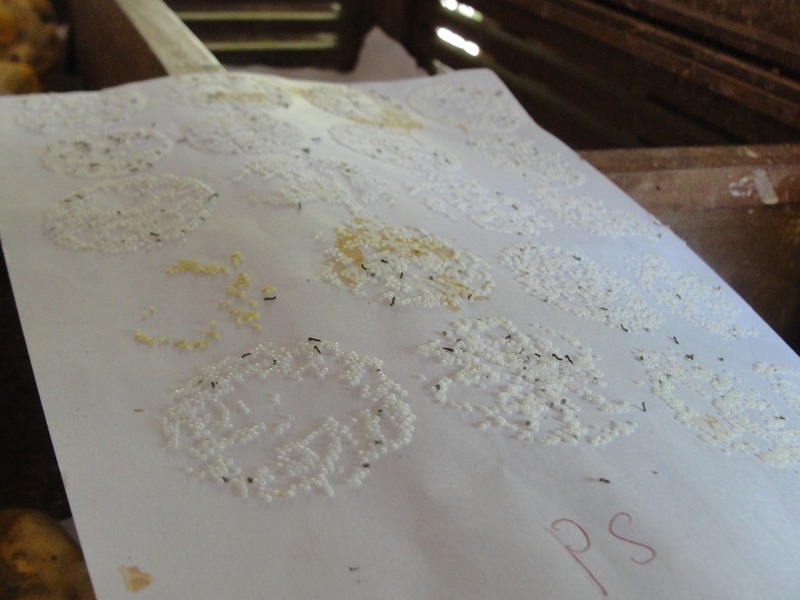 It is yellow because of the sericin that remains on the fibers. Raw silk creates a slightly nubby fabric with random flecks in a natural, off-white color. It has a somewhat rough texture and a gentle drape. It is thicker than the other silks and dyes very nicely. 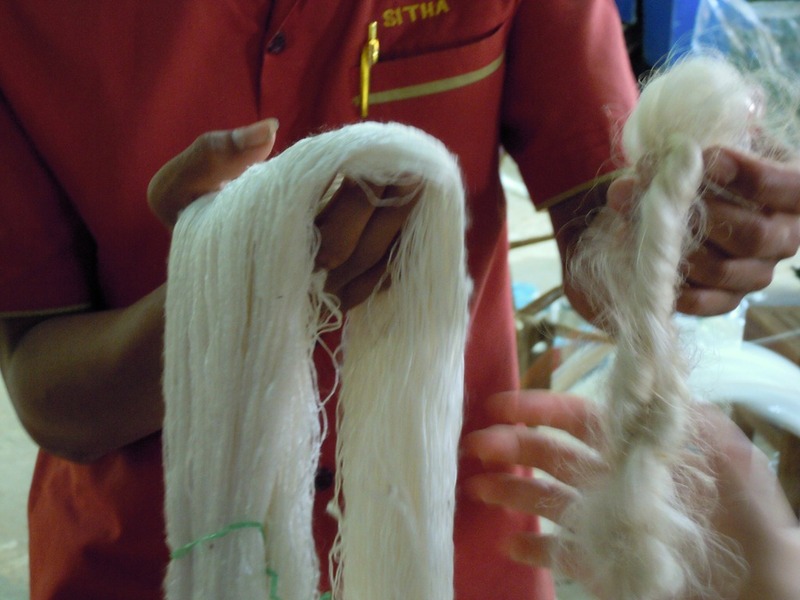 On the left, white in color, is “fine” silk, the fiber that remains after the coarser raw silk thread is removed. 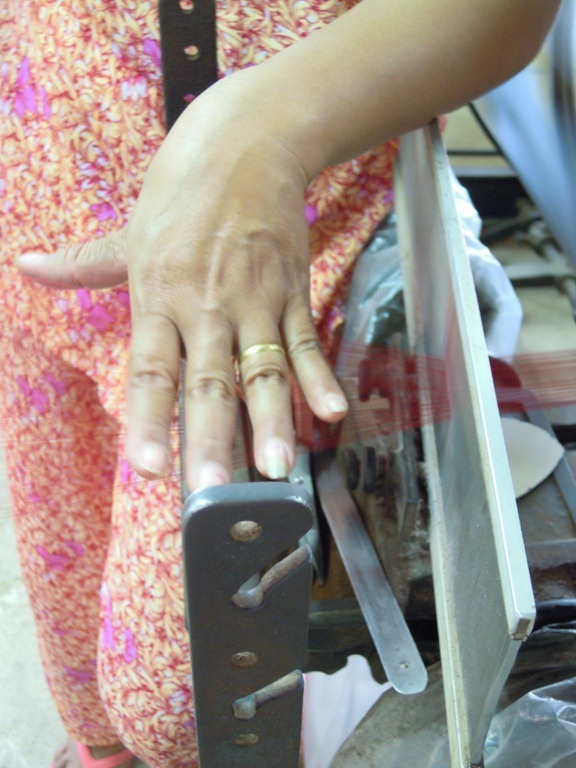 There are two “fine” grades of silk that are ideal for lightweight fabrics. This is reeled and will make fine cloth; soft, light, and lustrous, with a nice drape. Raw silk yarn. Multiple threads have been wound together. 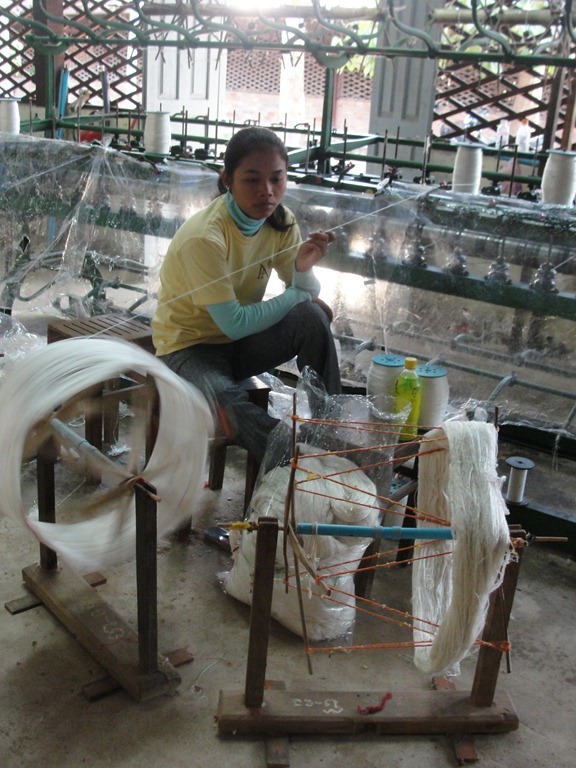 This process of creating the silk yarn is called “throwing,” and prevents the thread from splitting into its constituent fibers. Now the silk is being wound onto spindles. The girl keeps a constant tension on the yarn. Next is the dyeing process. 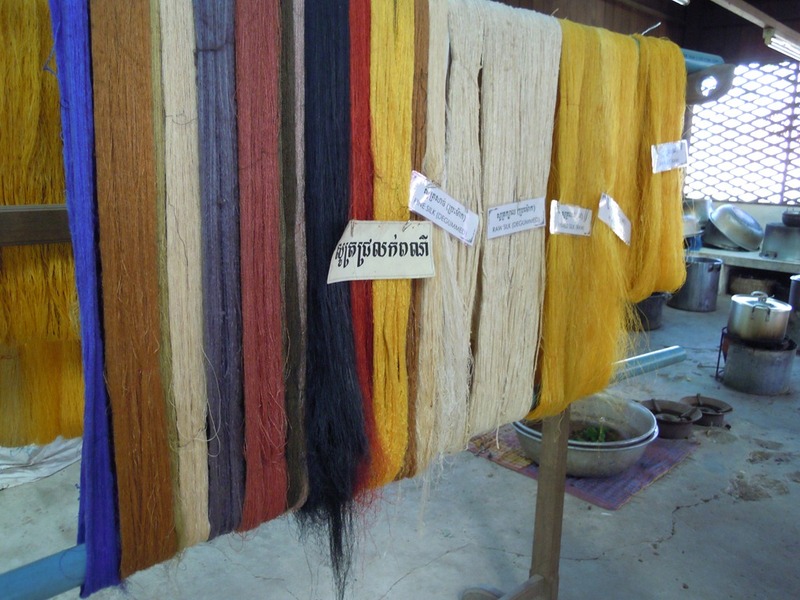 Many dyes are still made from natural materials. 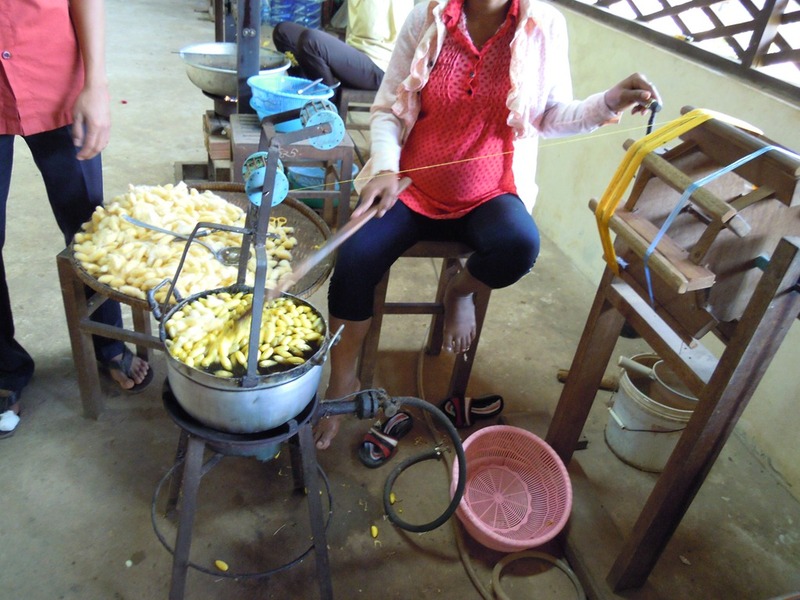 Man-made synthetic dyes may also be used to produce colors unavailable otherwise. 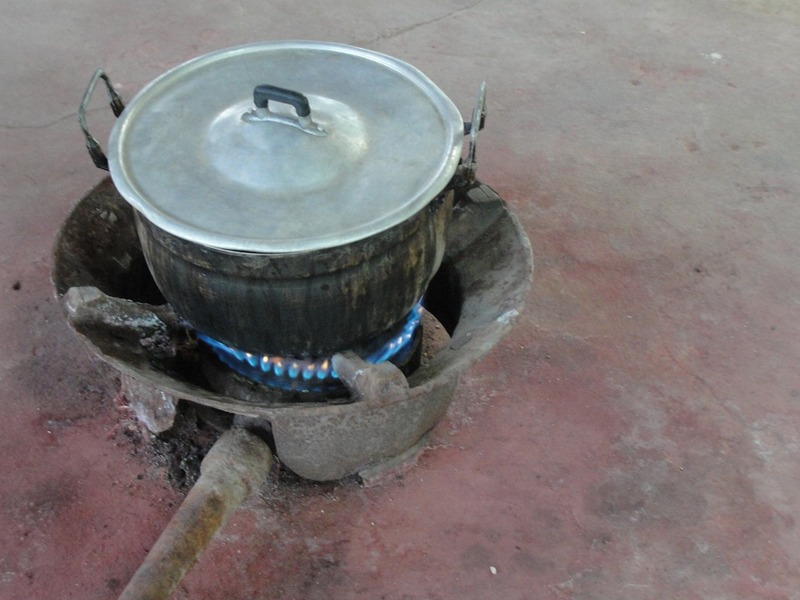 The dyes are made, boiling materials in a pot. 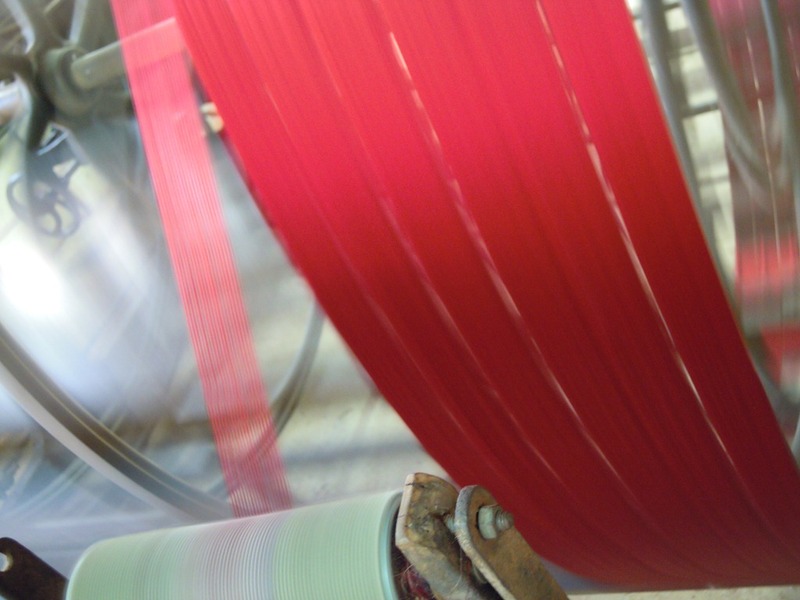 The thread is then dyed by dipping it into the dye. This is all done by hand, producing a wide range of colors. Next is a process that I do not understand. 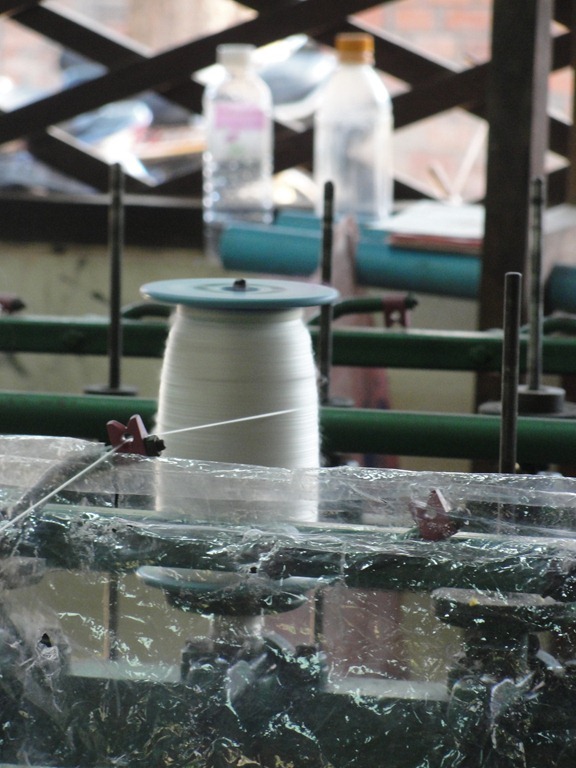 It produces reels of fine silk yarn, after the dying process. Many spools feed into the reeling machine. A woman keeps the tension right. And these threads are put side by side, on this device. Maybe this is in preparation for the next step we saw. 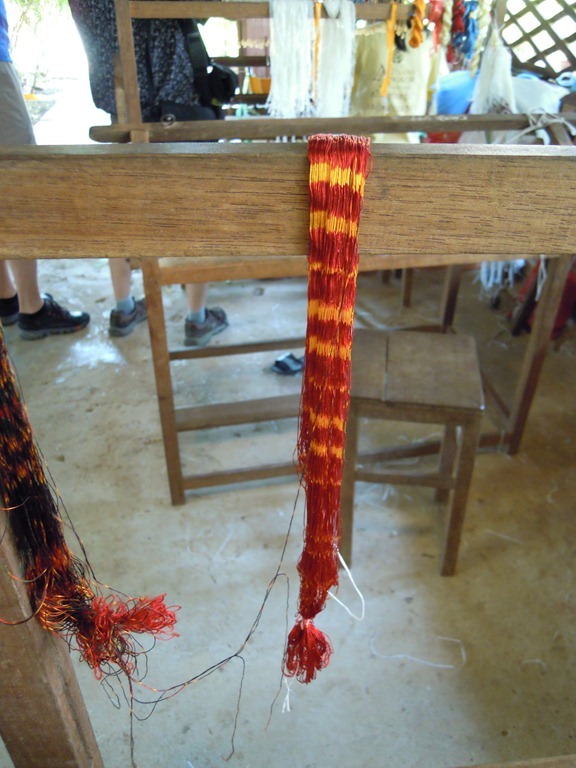 Ikat is a dyeing technique used to pattern textiles that employs a resist dyeing process similar to tie-dye on either the warp or weft fibers. Globally, Ikat is believed to one of the oldest types of woven textile. As far as historians can tell, Ikat developed in several parts of the world at the same time. While the exact origins are unknown, Ikat is present in Central America, South America, Asia, and Africa. 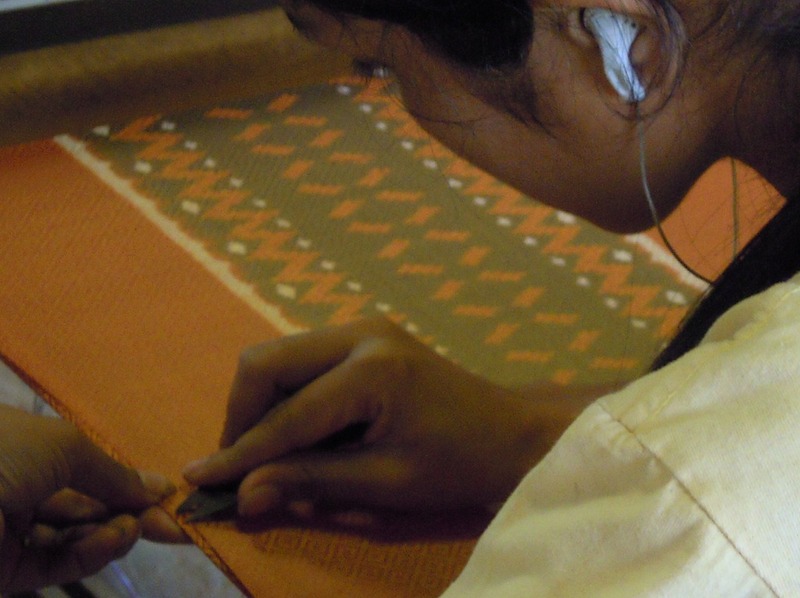 In Cambodia, Ikat has been woven for hundreds of years. 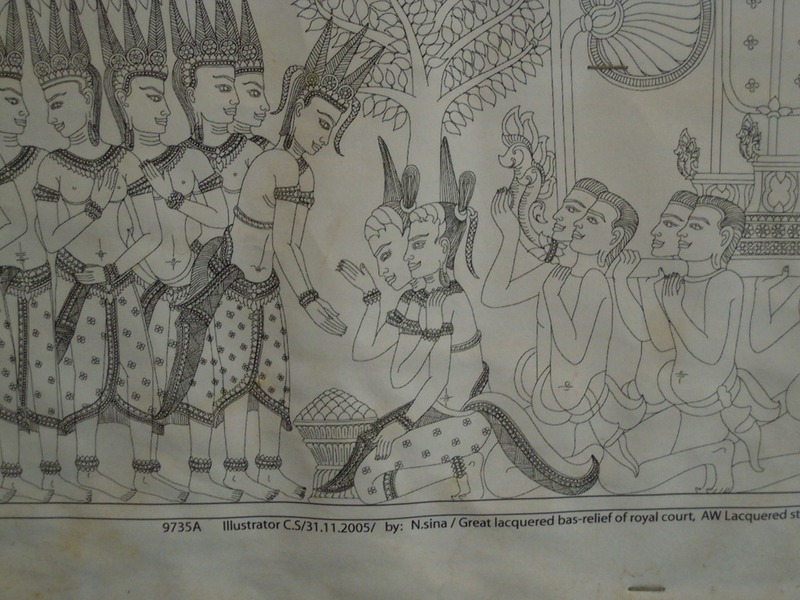 In fact, many of the Apsara Dancers carved into the bas-reliefs of Angkor Wat are wearing a sampot-Hol, a traditional skirt made of silk Ikat. 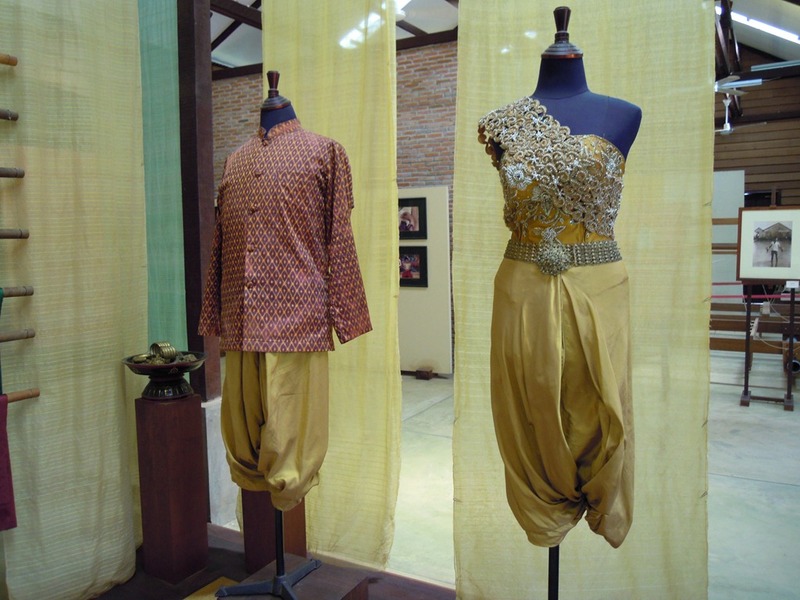 Hol are still worn today by women at weddings and other important ceremonies. 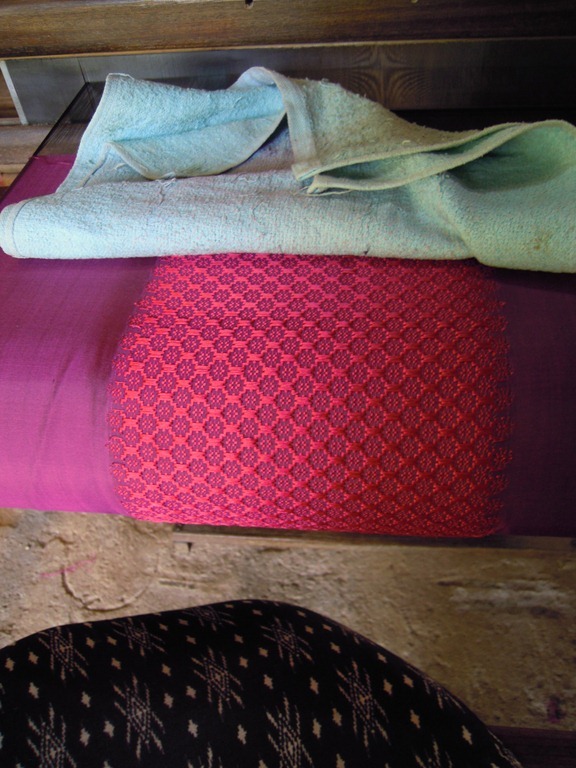 One of the most sophisticated types of silk cloth is hôl, obtained using the Ikat technique. This method requires the meticulous preparation of the pattern by dyeing the weft thread, (the thread placed in the width of the fabric). The method used is a successive tying-in and dying process with different colors in clay pots, which will then yield geometric or floral motifs. The silk threads are then hand-woven according to a complex intertwining of the warp thread (the thread that runs lengthwise through the fabric) and the weft thread, resulting in a fabric with beautiful shades and shimmering nuances. 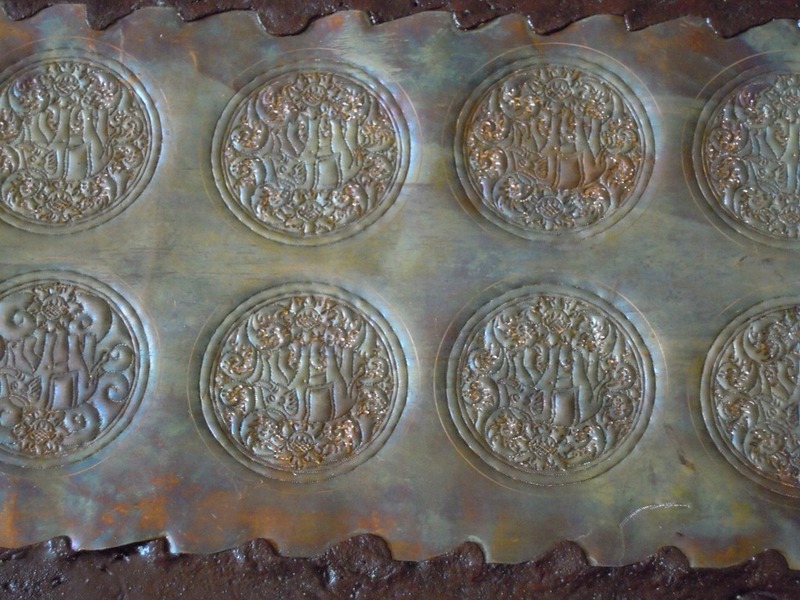 Bindings, which resist dye penetration, are applied to the threads in the desired patterns and the threads are dyed. Alteration of the bindings and the dyeing of more than one color produce elaborate, multicolored patterns. 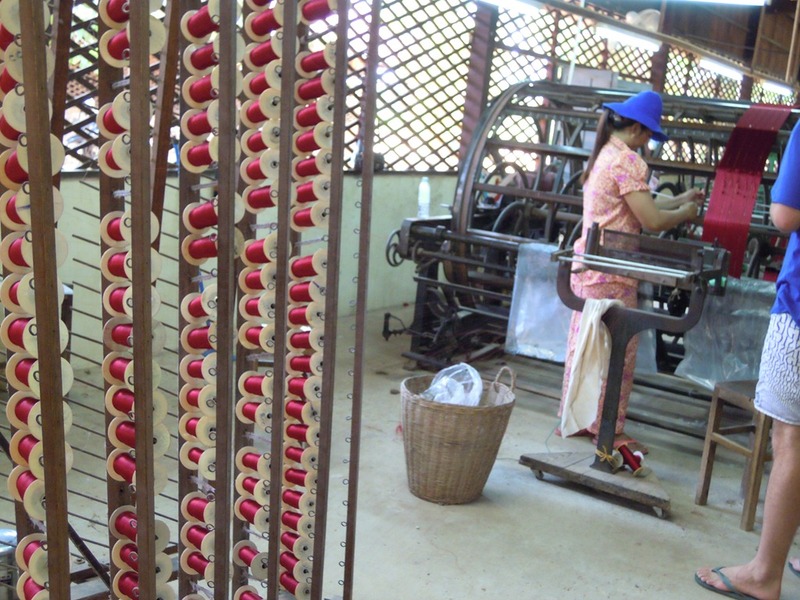 When all of the dyeing is finished the bindings are removed and the threads are ready to be woven into cloth. They are very carefully handled so that throughout the process, the threads stay in the correct order; otherwise the pattern will not work when woven. The defining characteristic of Ikat is the dyeing of patterns, by means of bindings, into the threads before cloth construction, the weaving of the fabric. 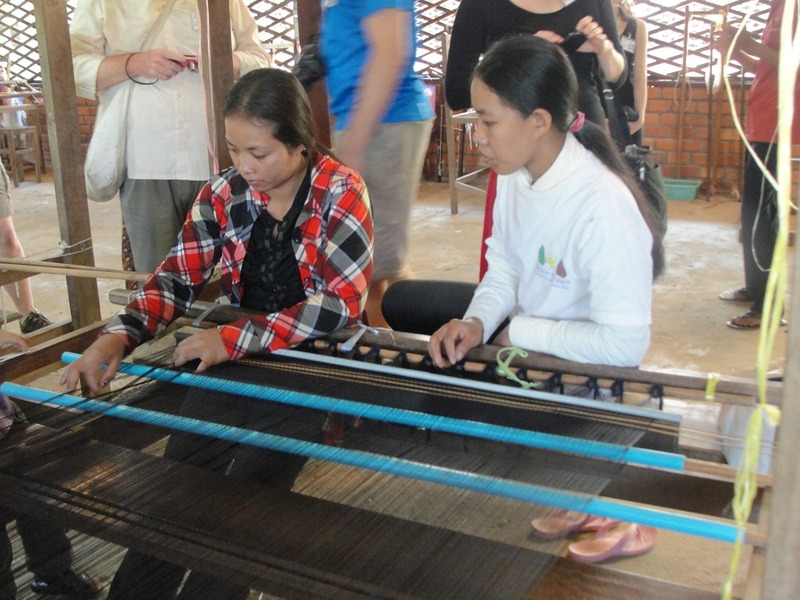 They are making warp Ikat, where the pattern will be in the warp threads when woven. A number of threads are being prepared for this Maybe the process above was making warp threads for this process? 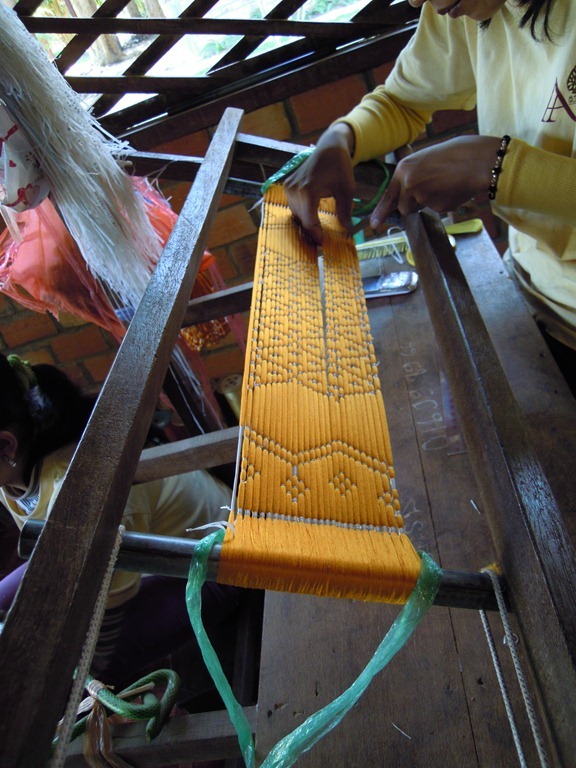 A woman ties the pattern into the warp threads. Another pattern tied into the threads. Here are some Ikat threads after dyeing. 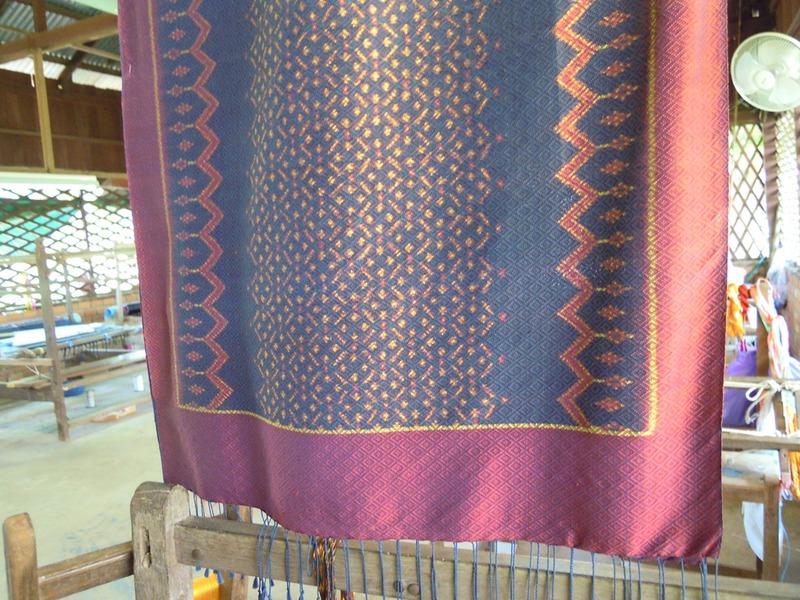 This is an example of Ikat silk. Now we have some idea show this pattern was made into the silk. I never knew! It is amazing what they can do! Now to the looms. 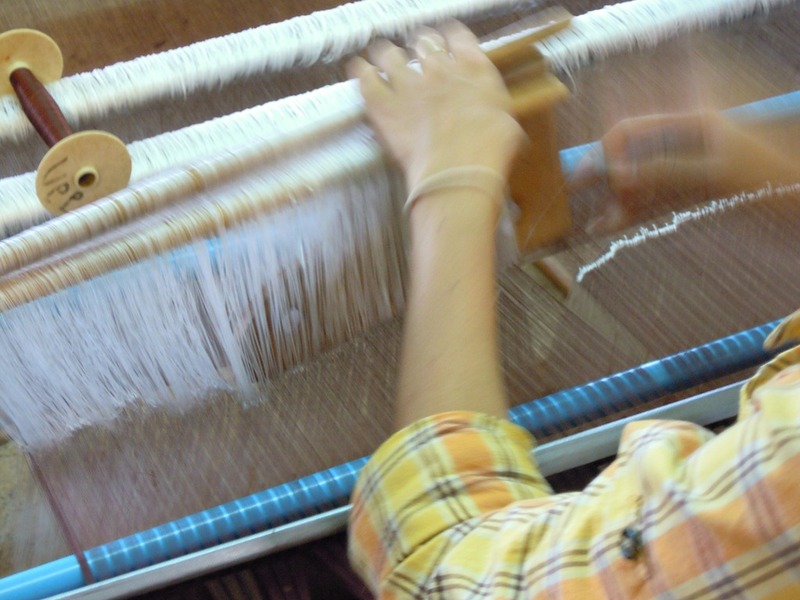 The weft threads are being tied into a loom. Heddles – each heddle has an eye in the center where the warp is threaded through, so that the weaver can form a shed (the vertical space between the raised and unraised warp yarns), through which the filling yarn, carried by the shuttle, can be inserted. There is one heddle for each weft thread. 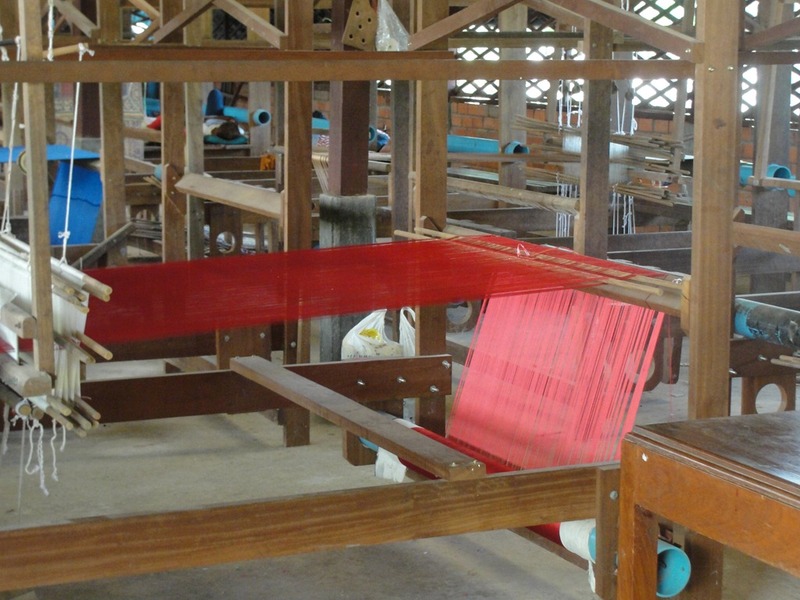 Here is a loom ready to go, with the weft strung with red silk. 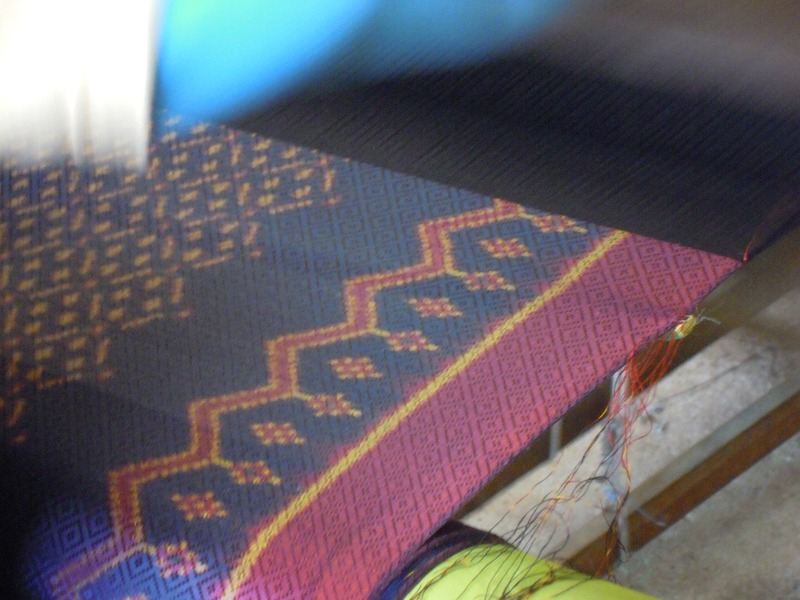 An Ikat pattern being woven. Here are the warp threads. 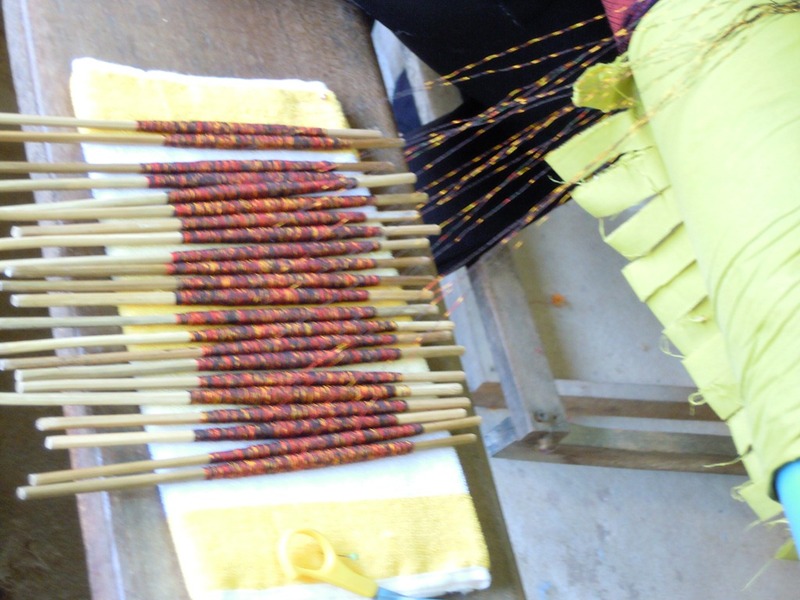 Note that each thread is tied onto a stick and that they are laid out in a particular order. This is the same order as when they were tied before dyeing. 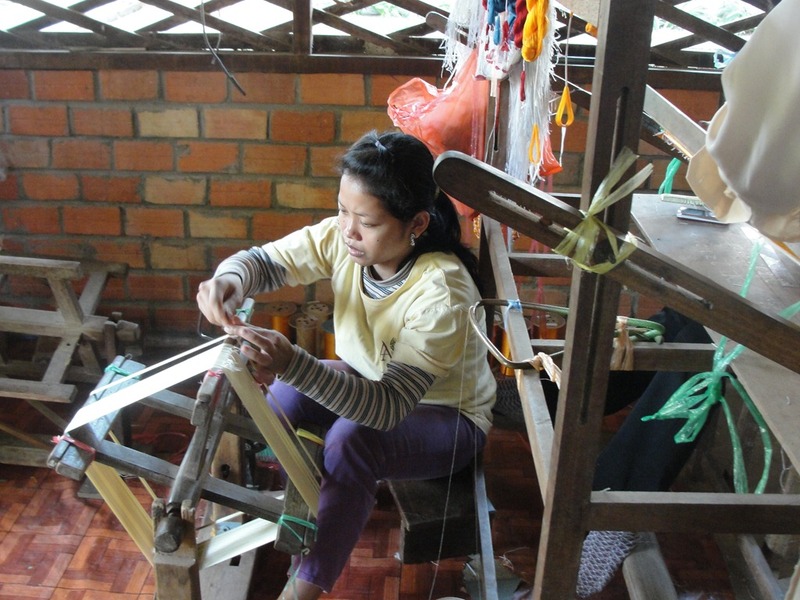 The loom is a traditional foot powered one. The girl is carefully dealing with some issue on the side of the cloth. Note the earphone in her ear. I guess she is listening to music on her MP3 player. 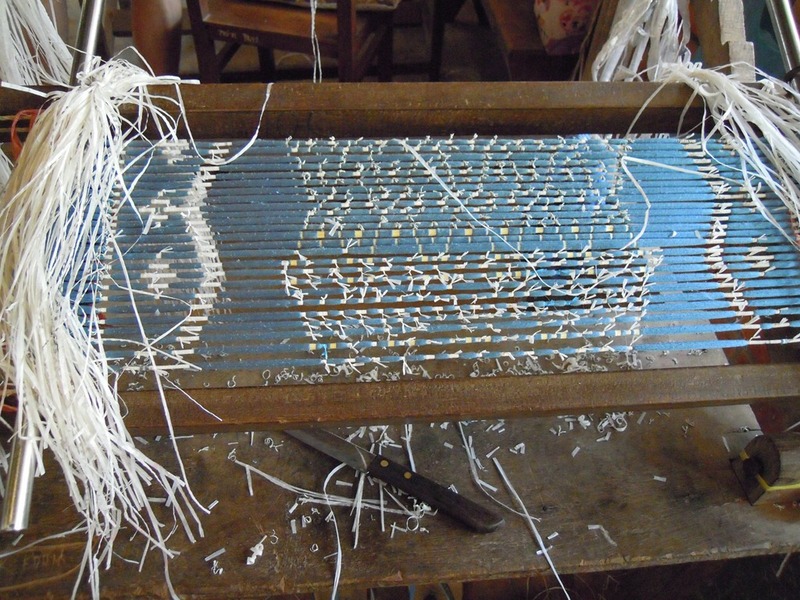 Here is some beautiful cloth coming off the loom. We next were taken into an exhibit hall, where some finished items were shown. 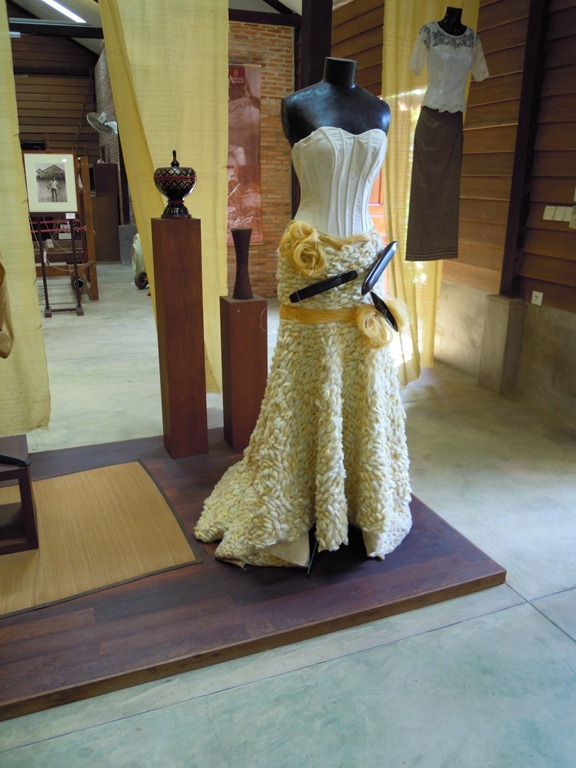 A woman’s dress, all out of raw silk. 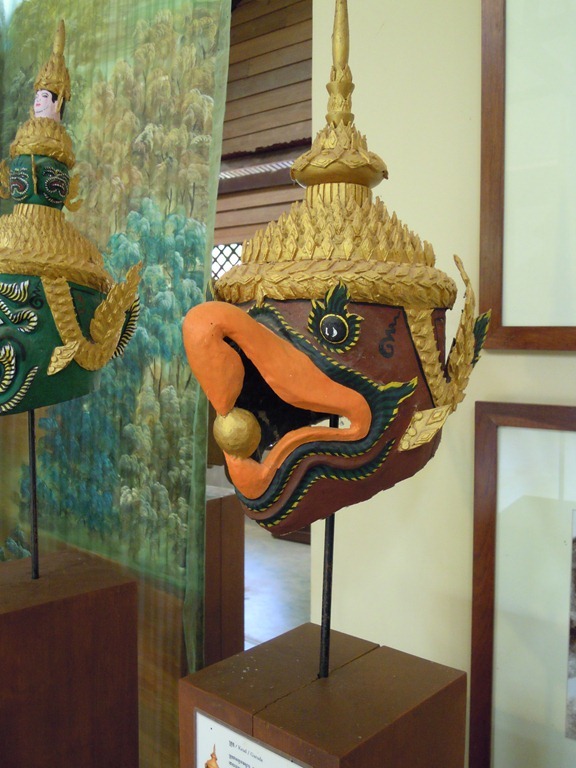 They also had some great masks, like those worn by the dancers last night. They would not let us take photos in the showroom, otherwise there would have been photos of finished silks. 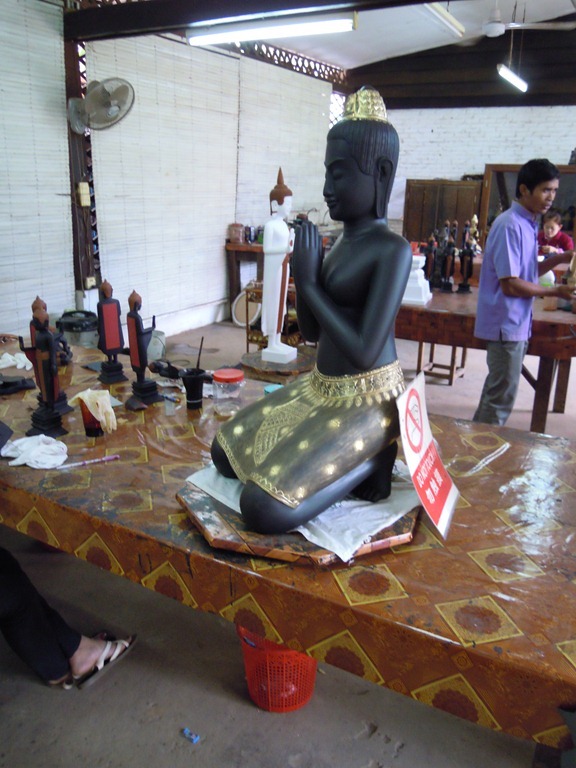 Next we went back into Siem Reap where the other Artisans Angkor facility was, for lacquer painting, stone and wood carving, and silver and bronze craftsmanship. We were given an introduction, then walked through the facility. 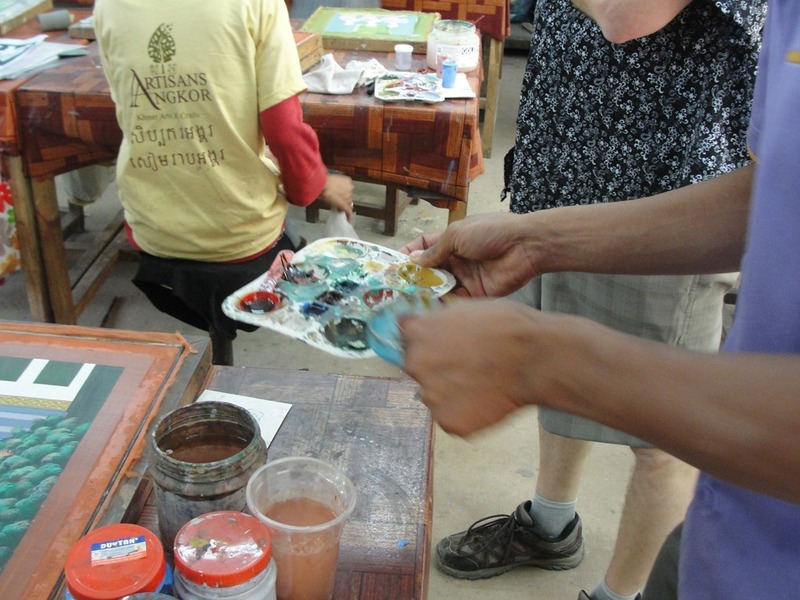 First we viewed the lacquer works. Below you can see a finished work, with a picture that was the model. Lacquer paint to be applied. 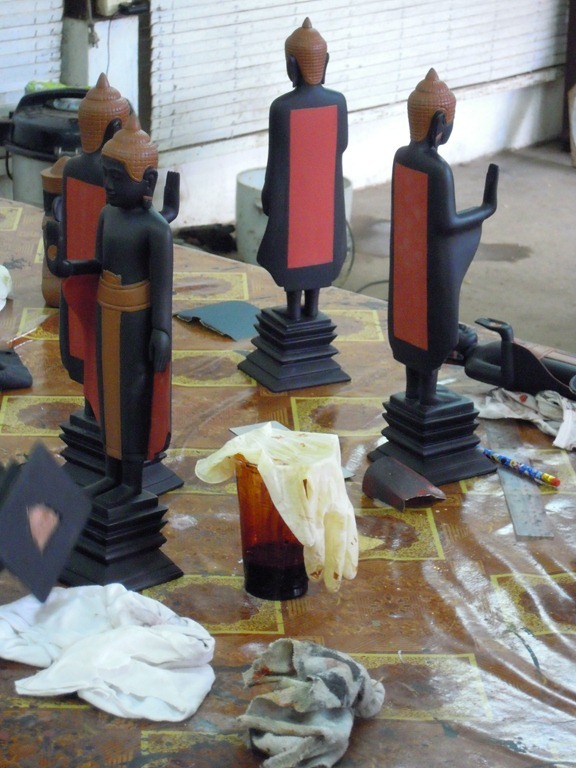 In the lacquer painting area, there were also various statues being painted and decorated, large and small. 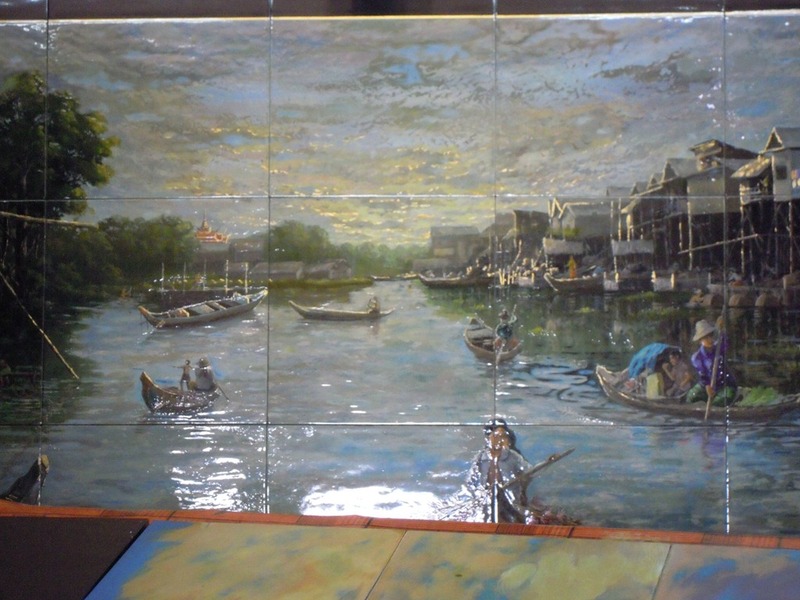 A finished lacquer painting, on tiles. I think this girl is polishing a stone which will be painted. 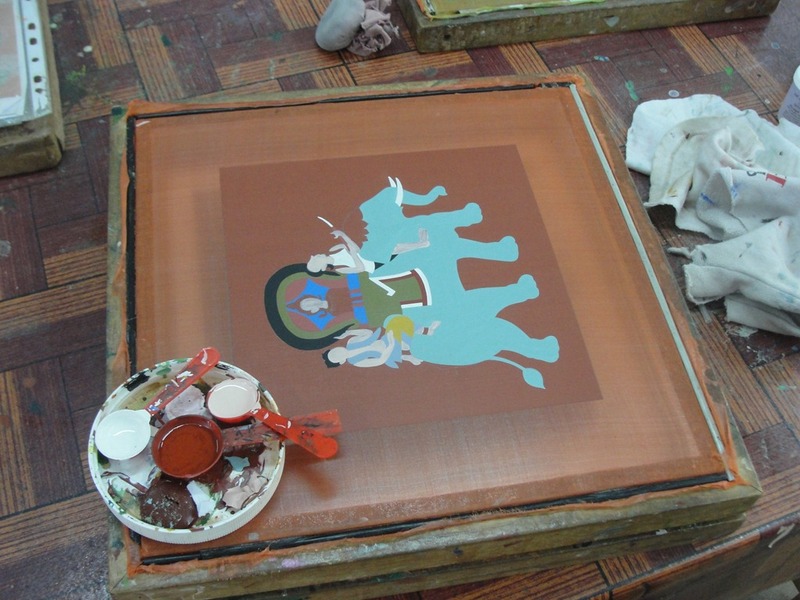 Two men, putting the final coat onto lacquer paintings. In the metal shop, this man is working on a piece. It looks like he is forming a small box made of copper. 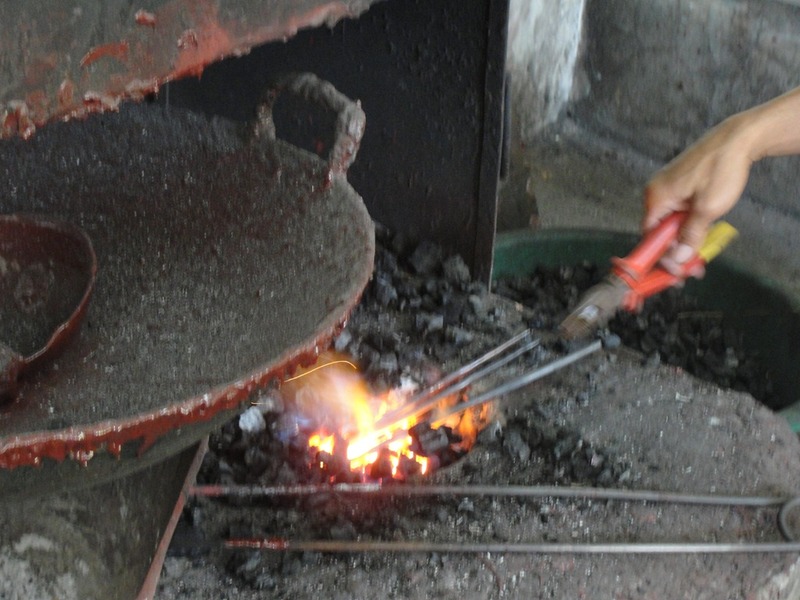 The metal shop had a hot fire going, for more forming of the pieces, and welding seams. 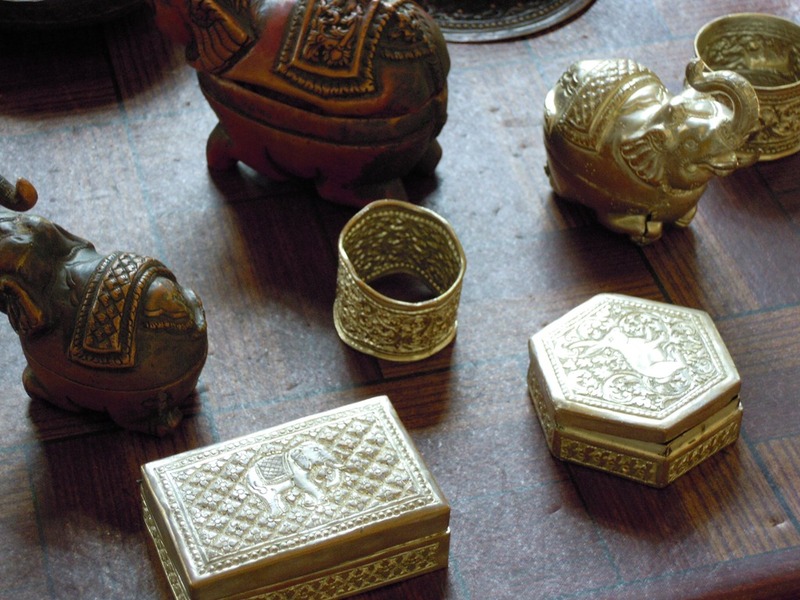 A craftsman is working on elephants, pounding in decorations with various chisels and punches. Finished pieces, some plated in silver, some painted. 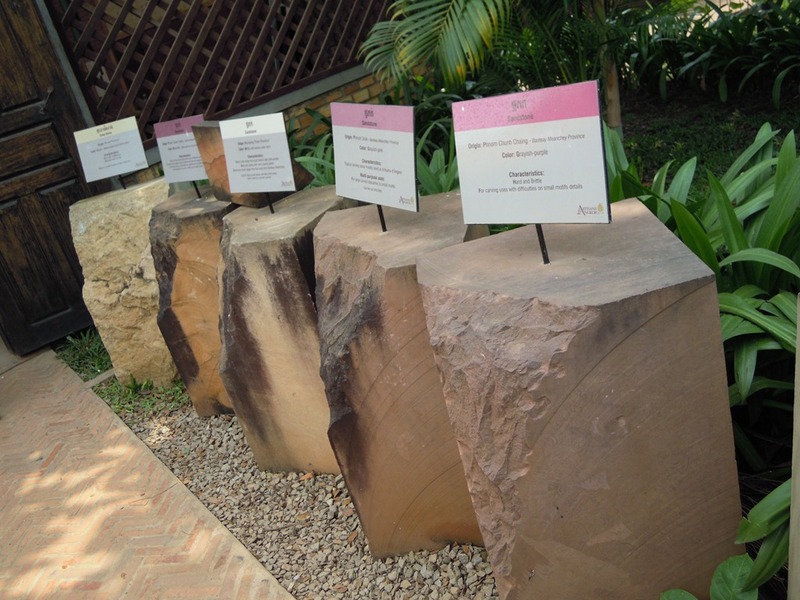 Outside the stone carving shop, there were samples of different kinds of stone. 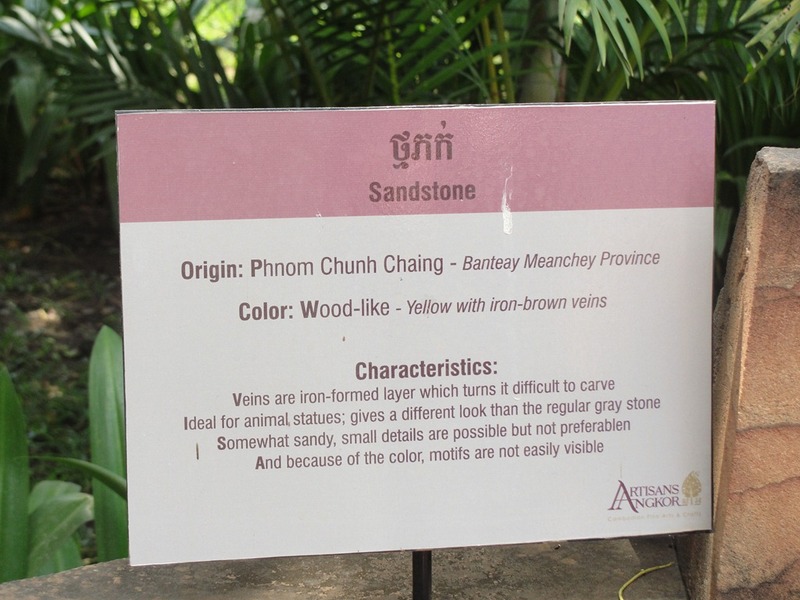 Each was marked with a sign, giving its characteristics for carving. 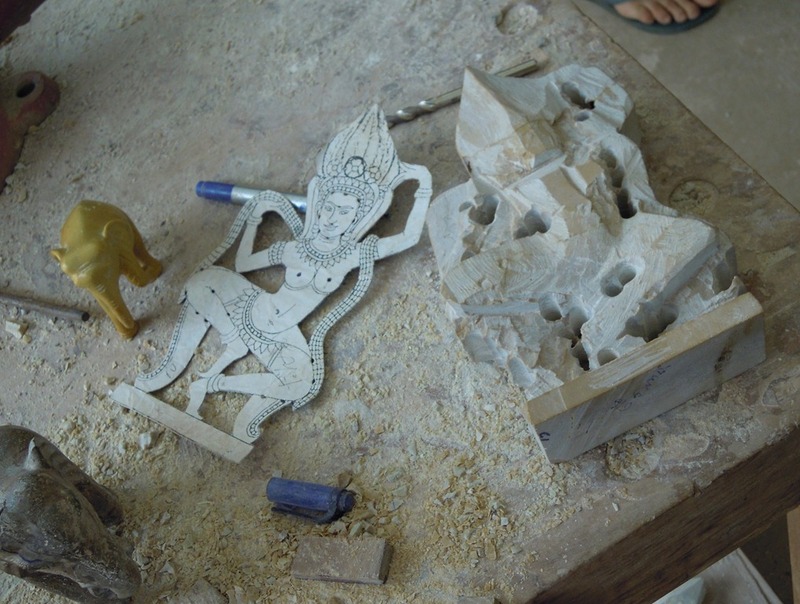 The carving starts with drawing the pattern of the figure onto the stone, and doing rough shaping and drilling out. 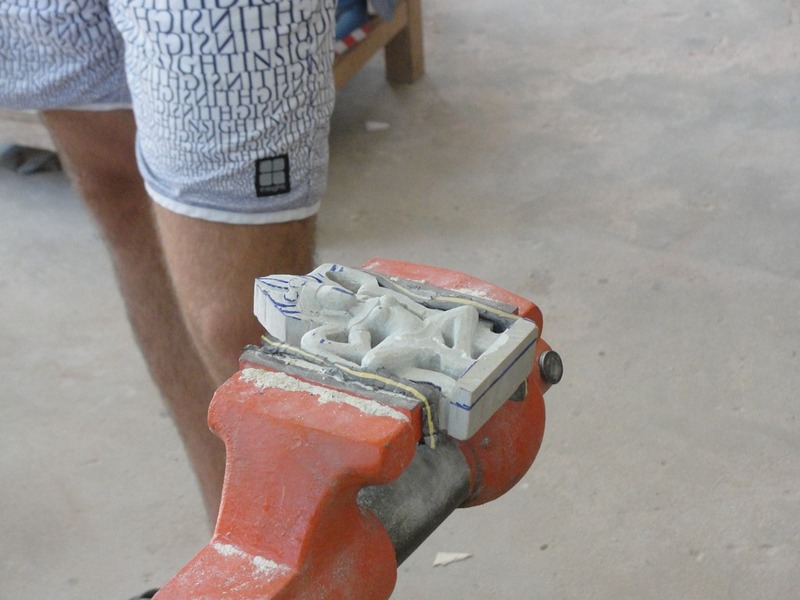 For fine finishing work, the stone is place in a vise. 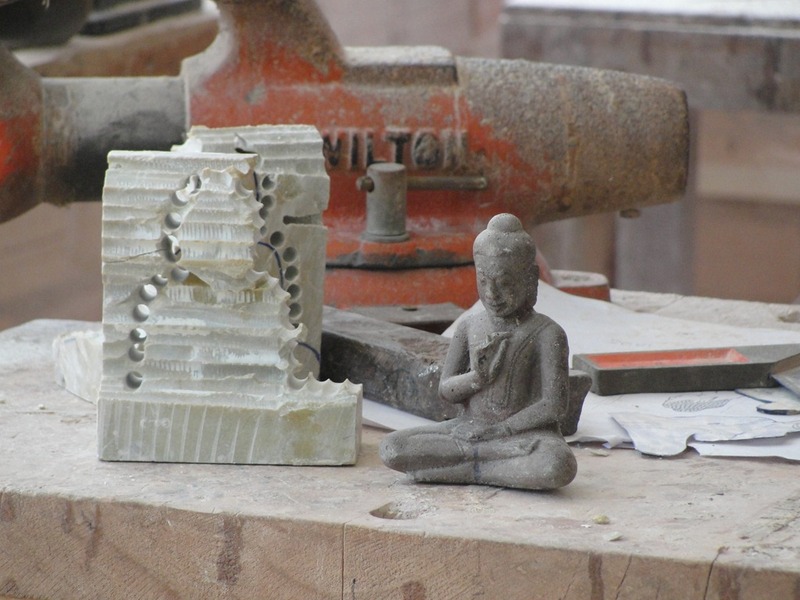 A finished Buddha as an example, and another being roughed out. The work is painstaking. 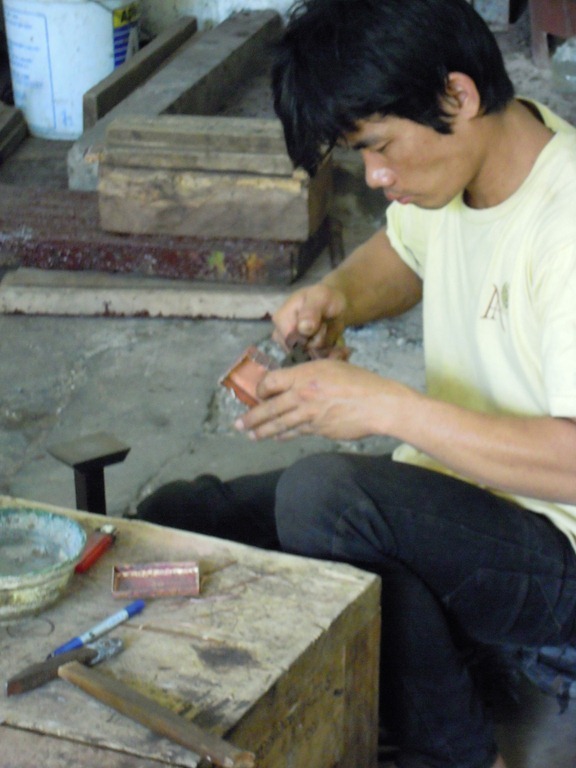 Here the artisan has measured the example and is checking his work. 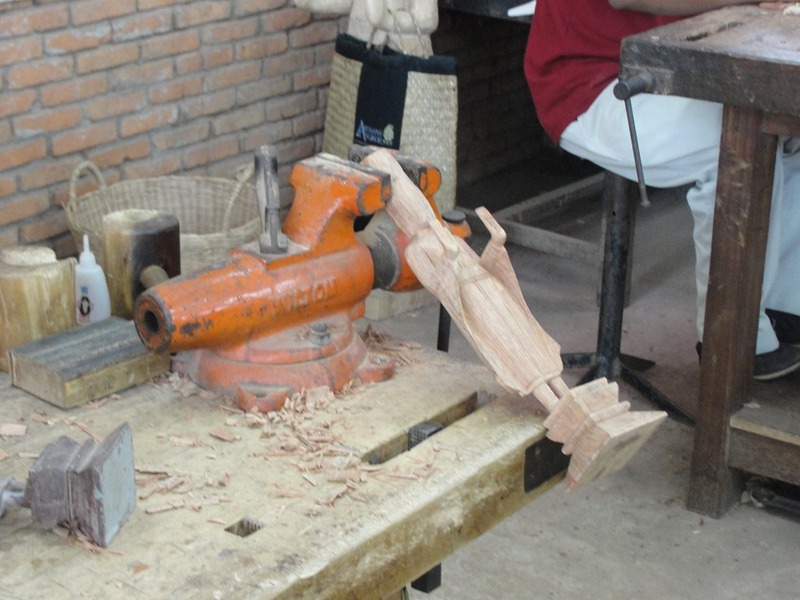 Final carving of a Buddha. A finished piece. This is high quality. It ss another scene from Angkor Wat, in the South Gallery, the “Judgment by Yama and the tortures of Hell.” This is an Apsara Queen, greeting her subjects. 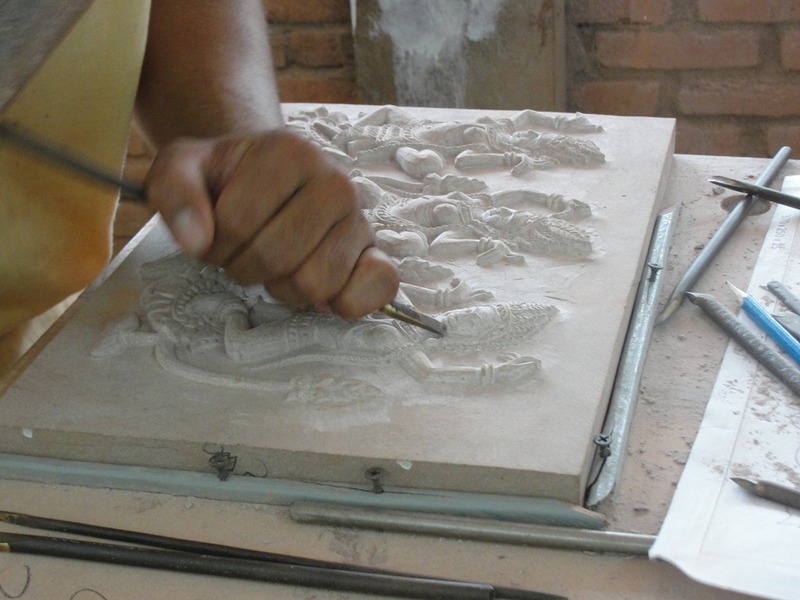 Another bas-relief being carved. 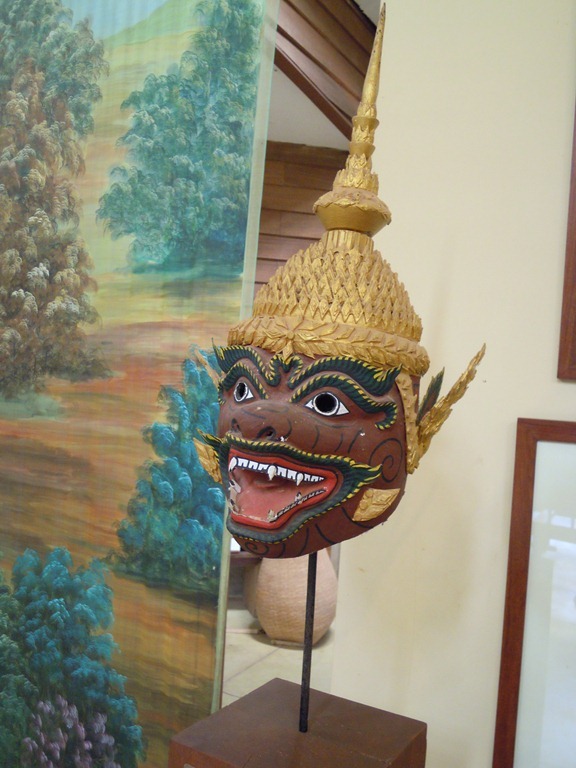 I am not sure, but I bet you could find the original at Angkor Wat somewhere. 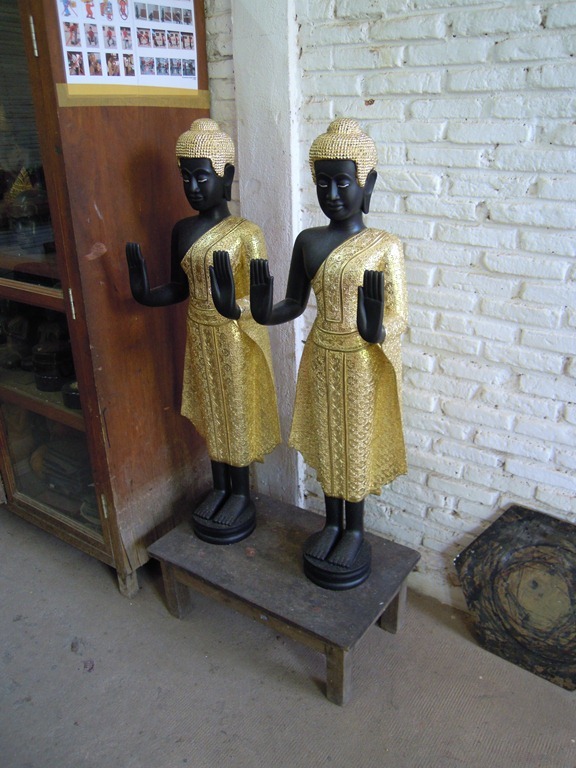 We saw these standing Buddha figures being painted in the lacquer shop. First they must be carved. 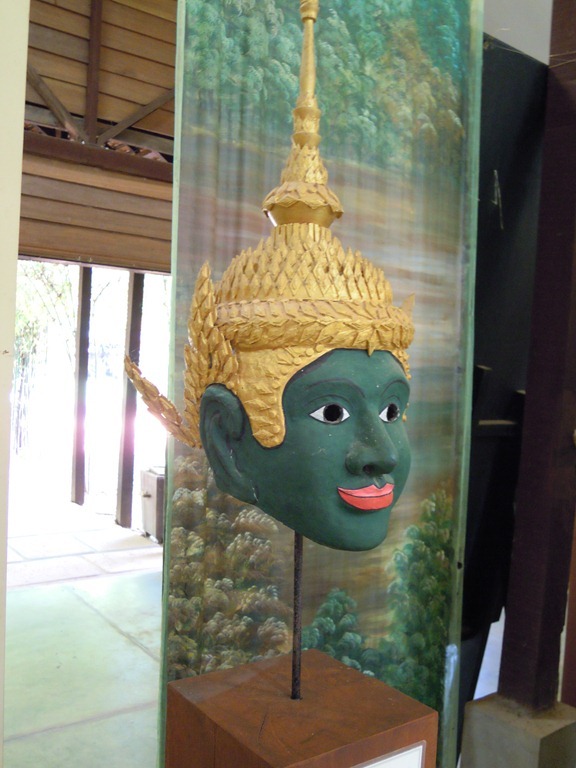 Working on a serene Buddha head. 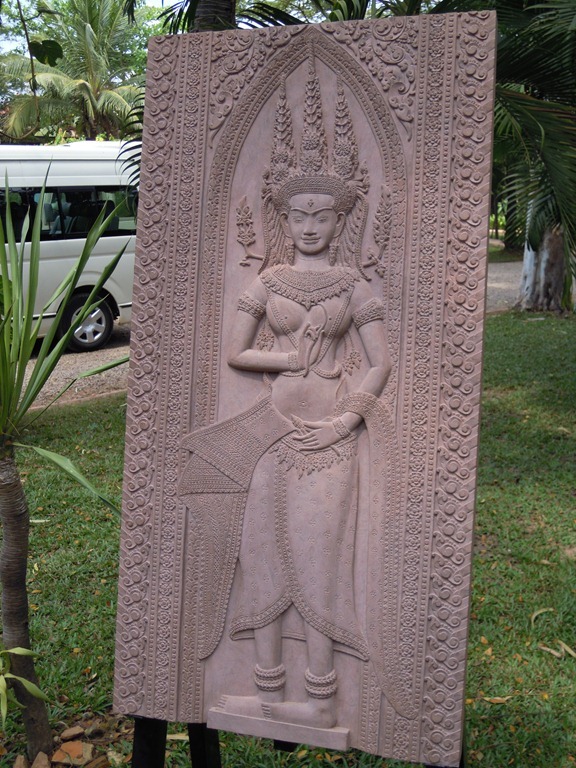 A finished Apsara, in stone. 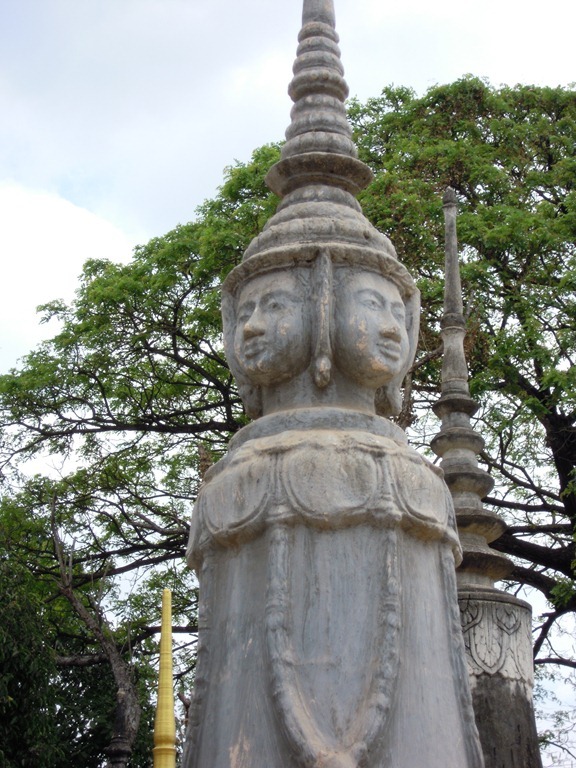 Four faces on a stone pillar. 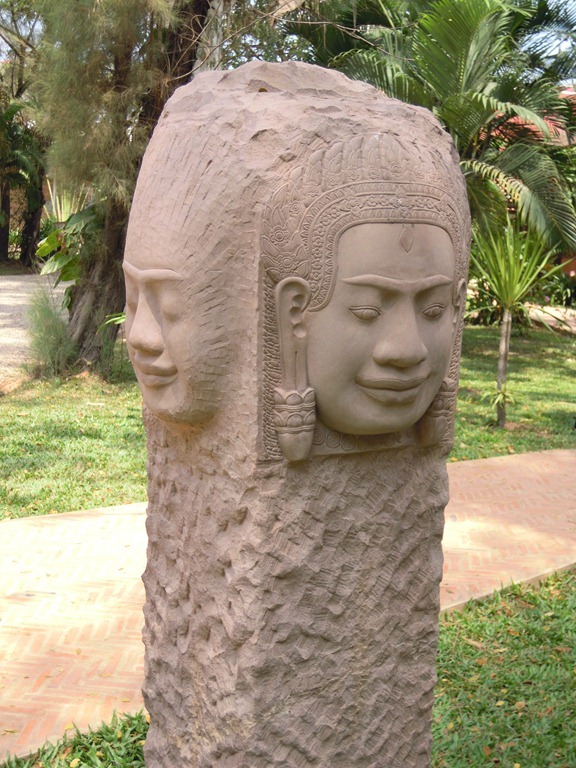 The face reminds me of the faces at Bayon. 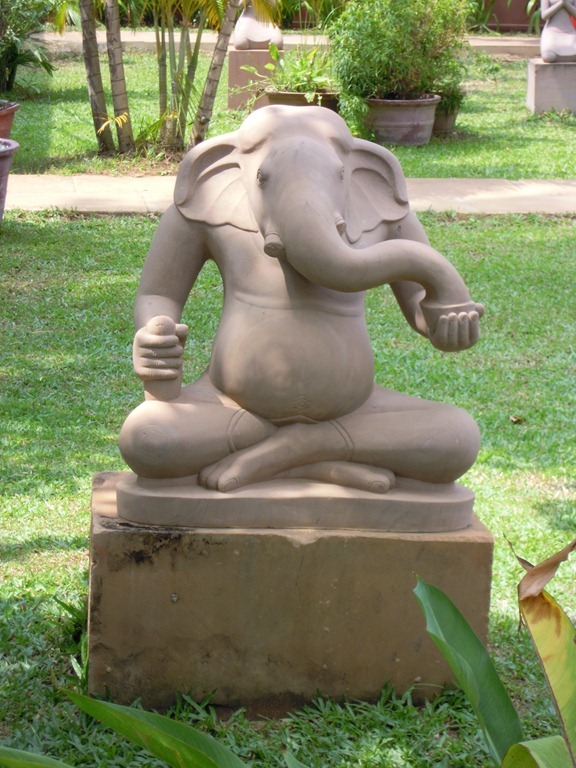 This is a Ganesh. You can see that one tusk is broken off, where Ganesh broke it to have a stylus to write the Veda-s.
We went next to a Buddhist Temple. I do not know its name. 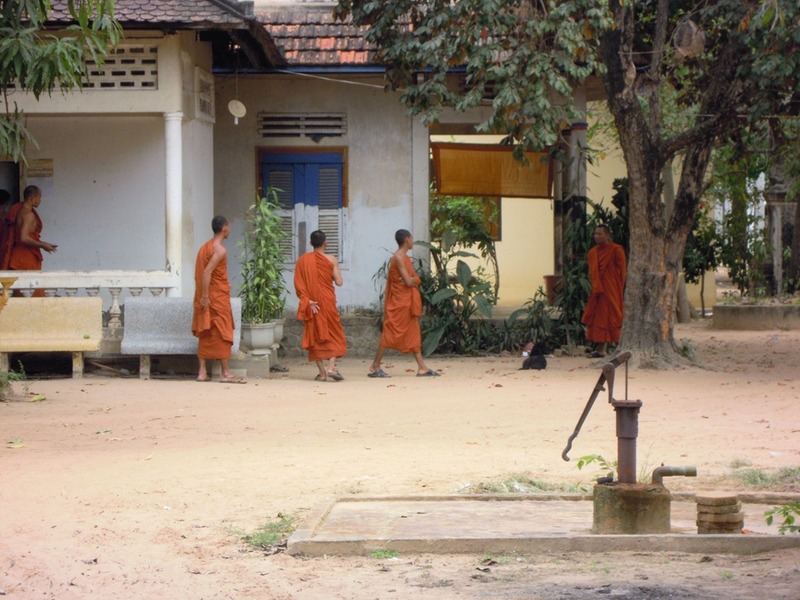 Young monks walk together in the grounds. One one side of the temple there were many stupas. Each contains the ashes of one person. 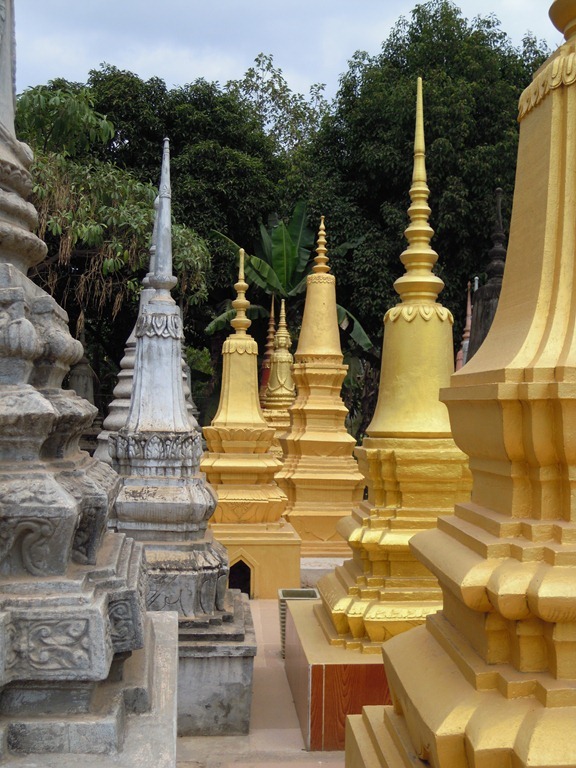 To build one of these stupas, the family has to be pretty well off. If you are not so rich, you will have the ashes at home. 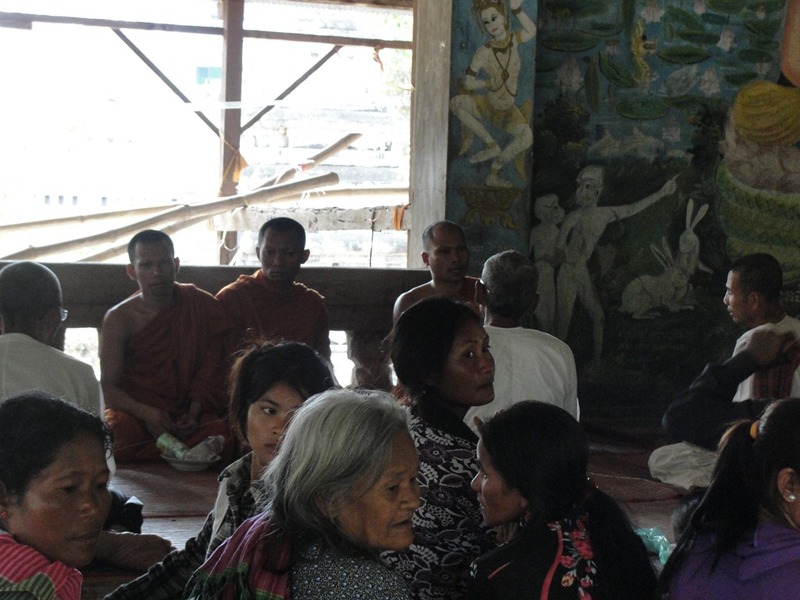 Because most Cambodians are Buddhist, they do not view death as the end of a person’s entire life, just the conclusion of this life cycle. 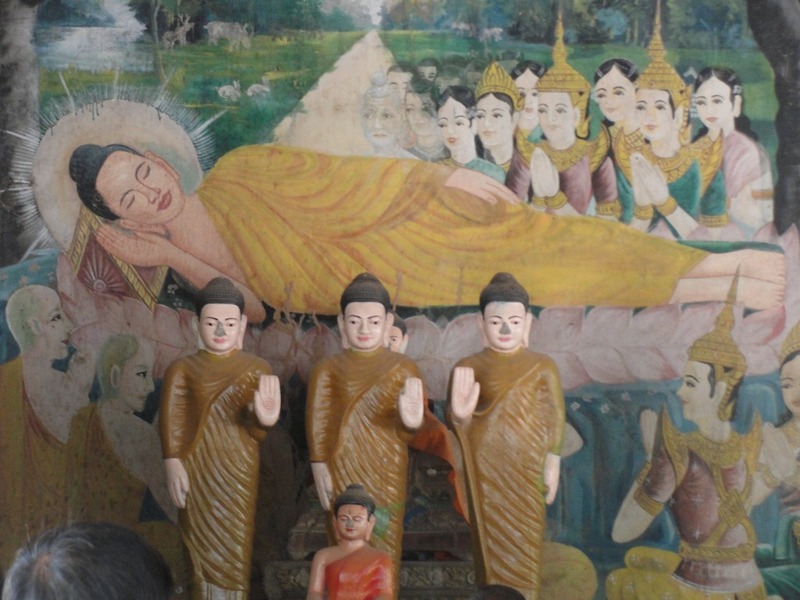 Buddhists believe that life, or being, changes in a consecutive cycle of birth, sickness, old age, death, and rebirth or reincarnation. 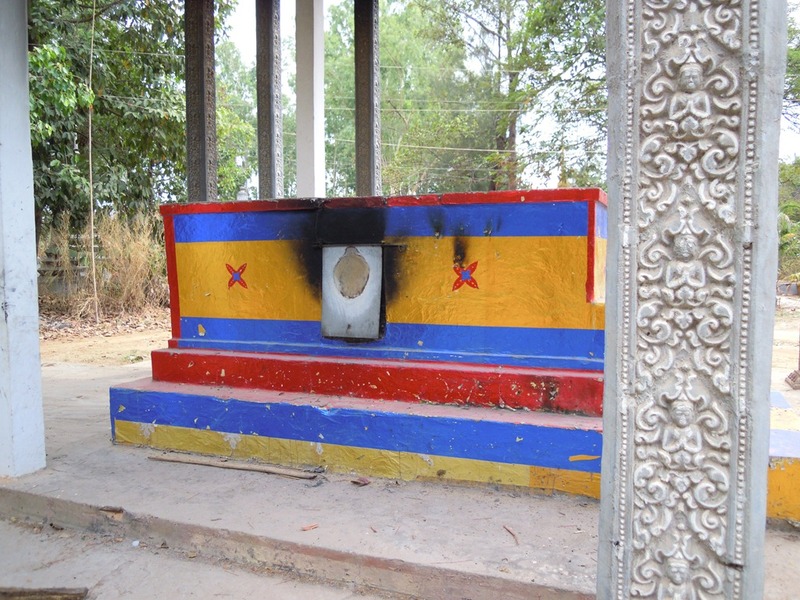 Having the ashes in a stupa at the temple, where they are close to Buddha and monks, is good. It is believed that they will be reincarnated sooner. 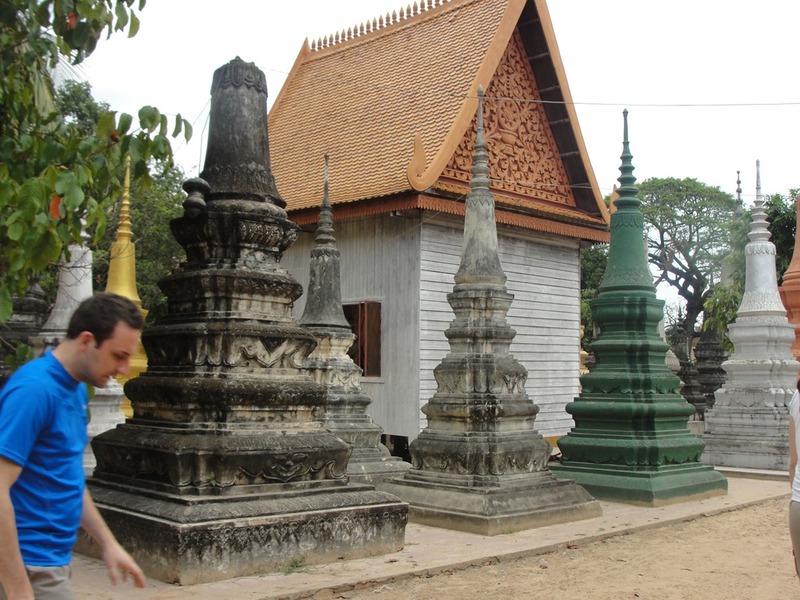 Many stupas. Some grand, so not so grand. 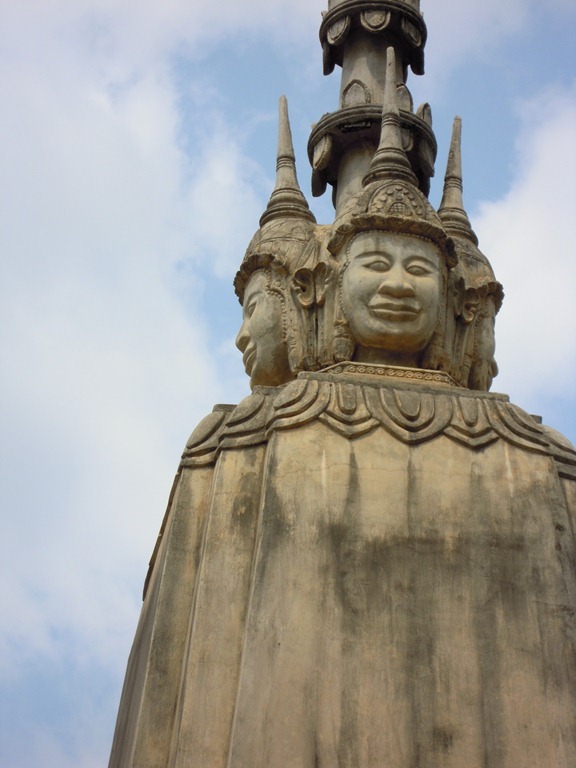 Four faces of the Cambodian Buddha atop the stupa. 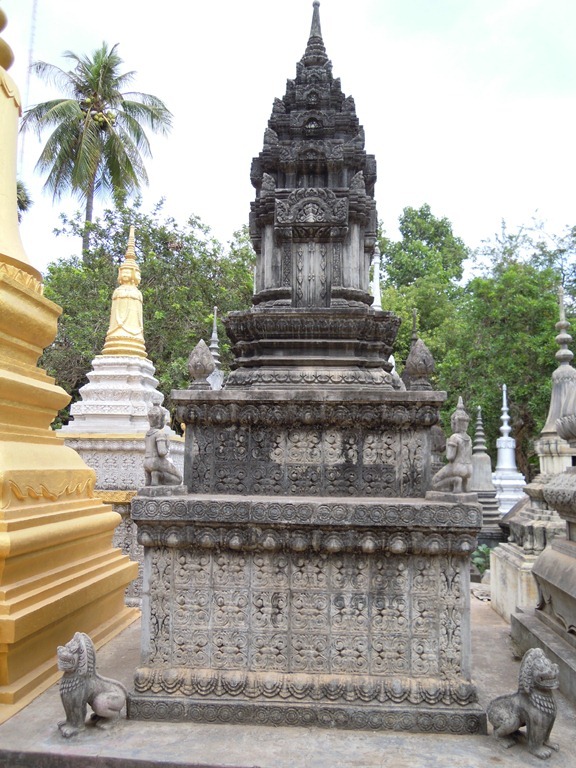 More stupas. I guess it is propitious to paint them golden. 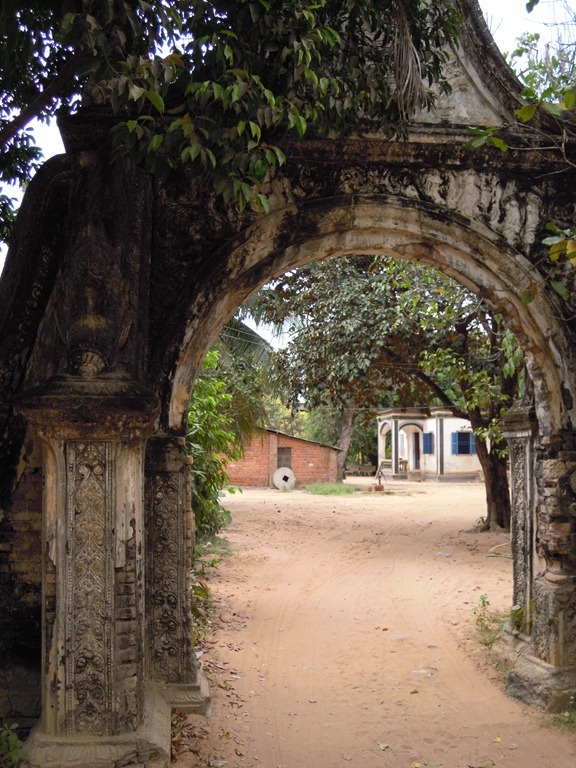 We went through an arched gateway into another part of the grounds. 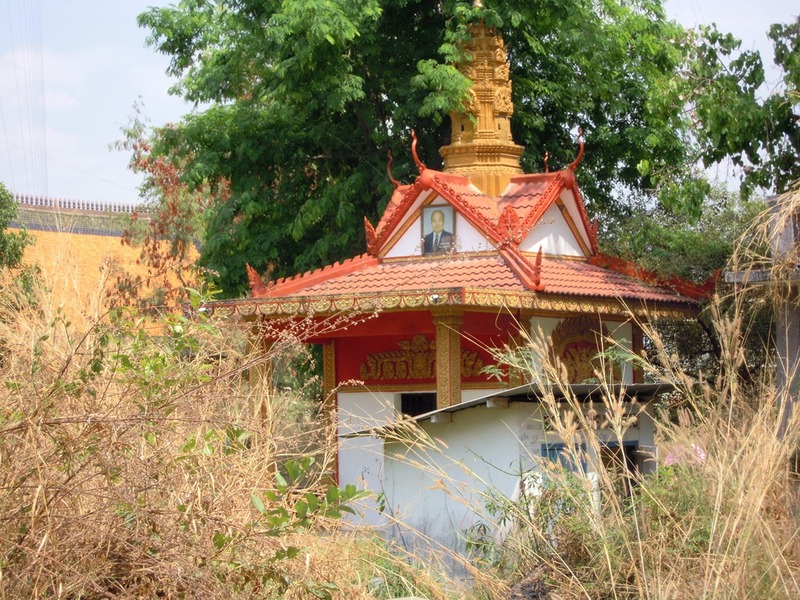 A small shrine, housing a Buddha. There is a funeral ceremony going on nearby. A man who is poor has died. He died in a traffic accident. 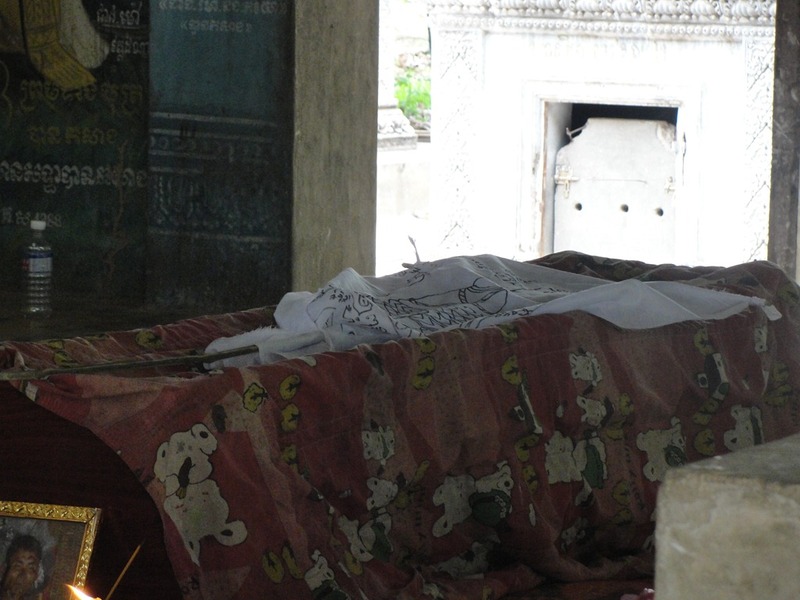 He has no family and no money for cremation. 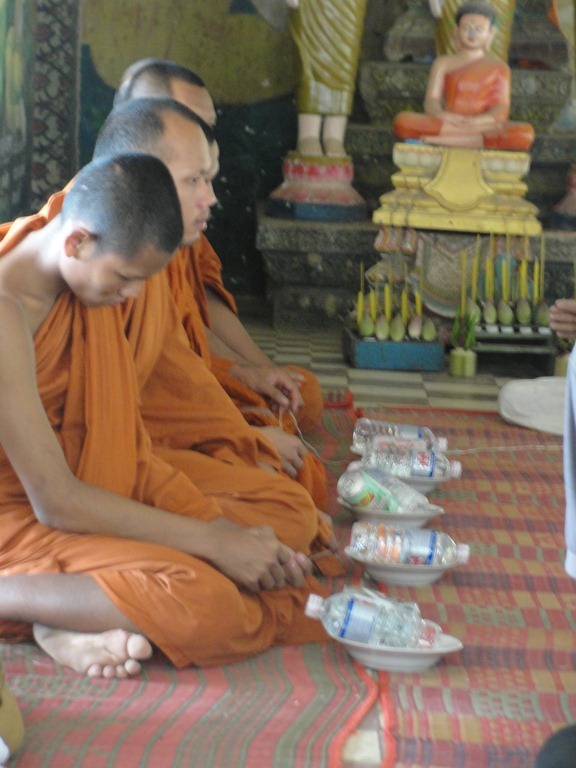 As a service to mankind, these monks are giving him a good funeral ceremony and cremation. The young man is covered with a cloth. Soon they will put the body into the crematorium. It is pretty efficient. This is much less fuel that an Indian open-air cremation requires. 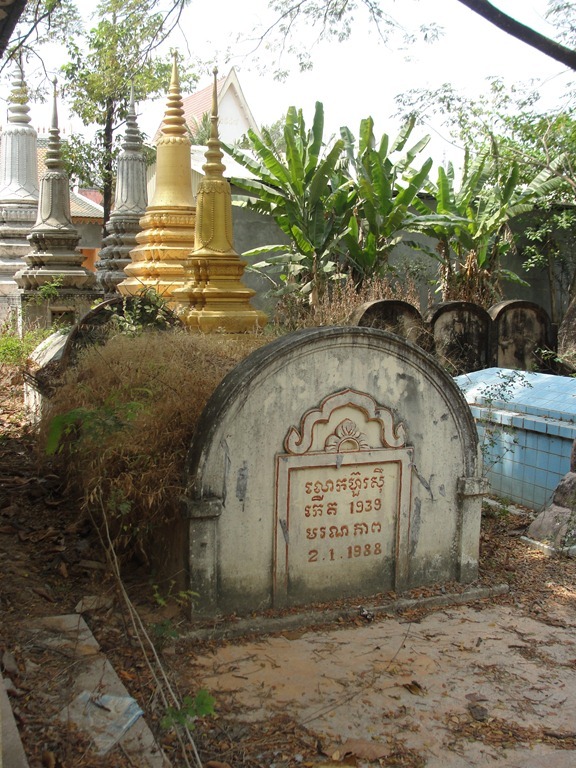 In this part of the grounds there were more stupas, and even graves. This area is not well kept up. A final view of the main temple, then we are off again on our adventure. We are driving out of town again. We stop for lunch. Sometimes the food presentation is beautiful. In a room next to the dining area is a quiet dark space filled with hammocks. 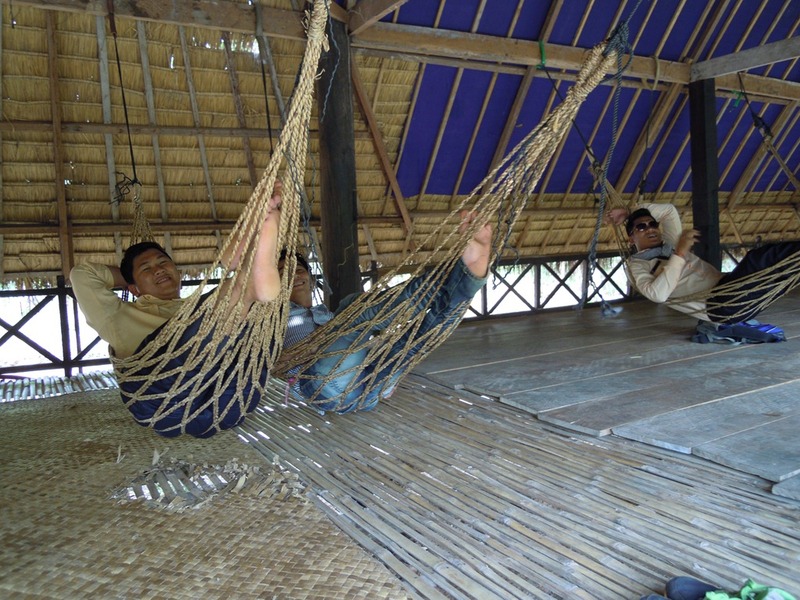 If you are Cambodian, after lunch, you will probably take a nice nap. 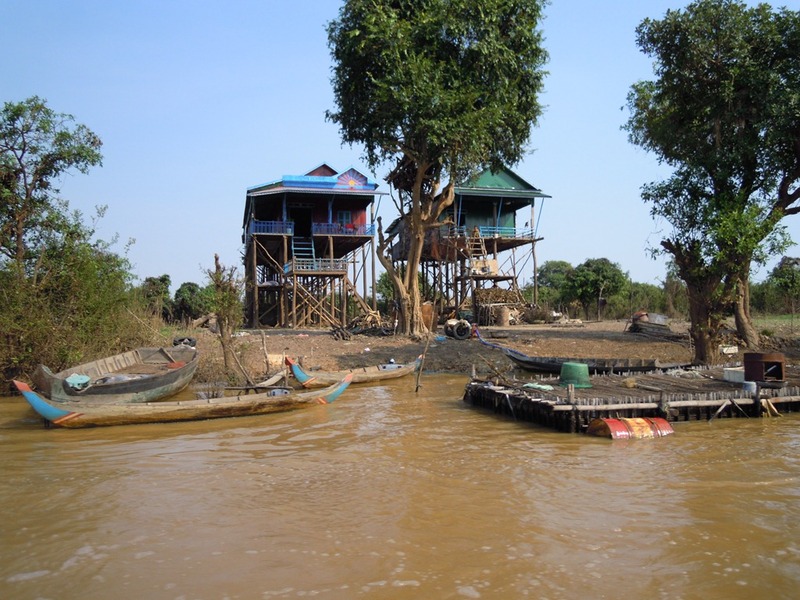 Our next destination is something I had never heard of, the Tonlé Sap lake, and a village of houses on stilts. 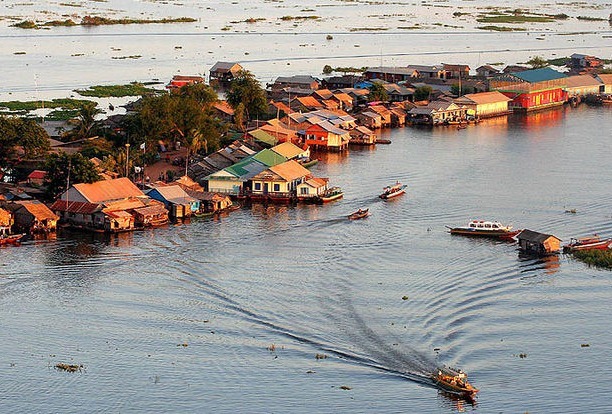 The Tonlé Sap is the largest freshwater lake in South East Asia and is an ecological hot spot that was designated as a UNESCO Biosphere Reserve in 1997. 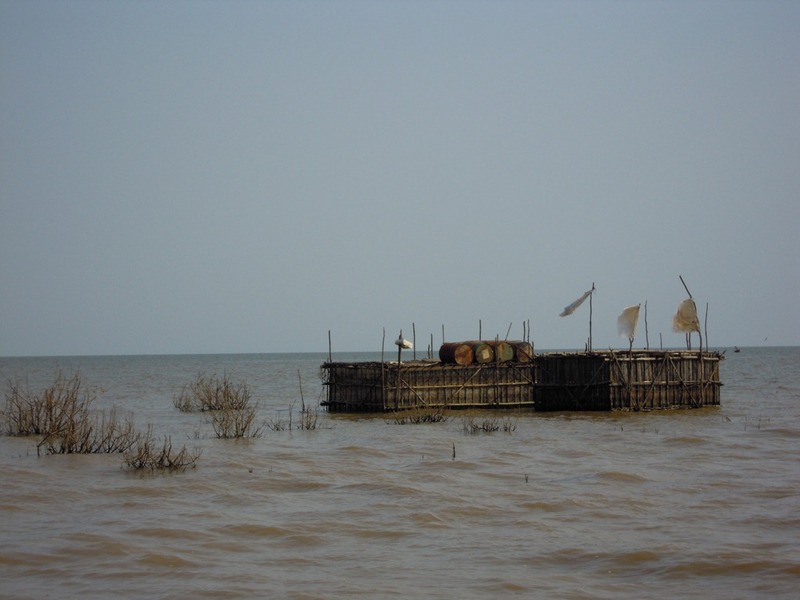 Tonlé Sap provides 75% of Cambodia’s national inland fish production. 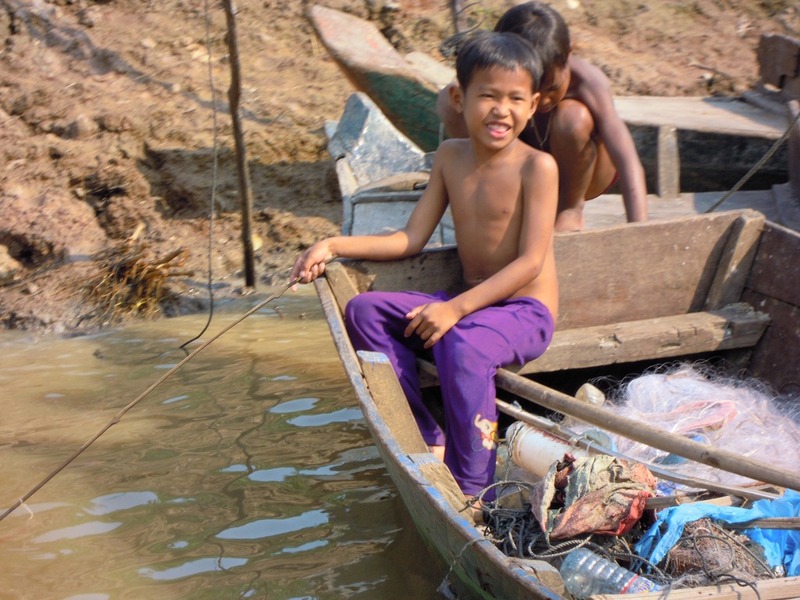 Fishing and agricultural activities around the lake support 1.6 million Cambodians. 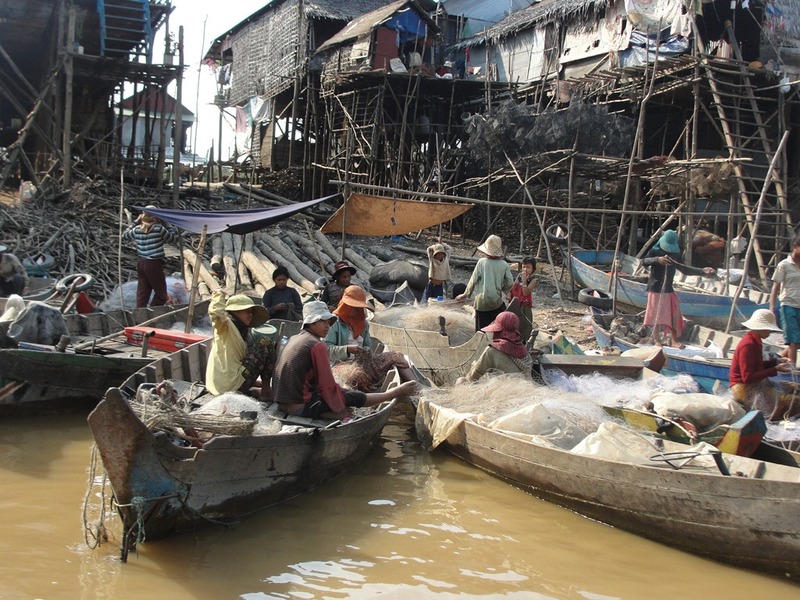 Fish from Tonlé Sap are thought to be the single main source of protein for the Cambodian people. Approximately 3 million people live around the lake. 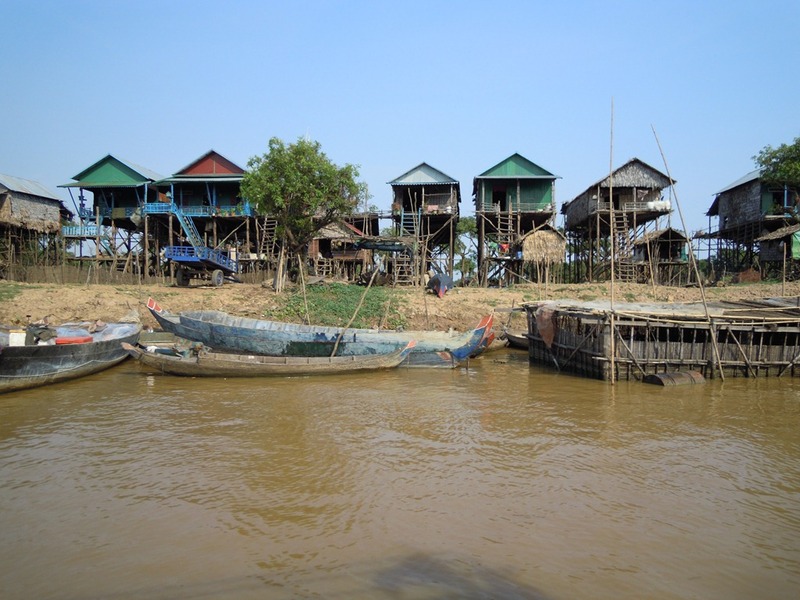 Kampong Phluk is a cluster of three villages of stilted houses built within the floodplain of the Tonlé Sap about 16 km southeast of Siem Reap. 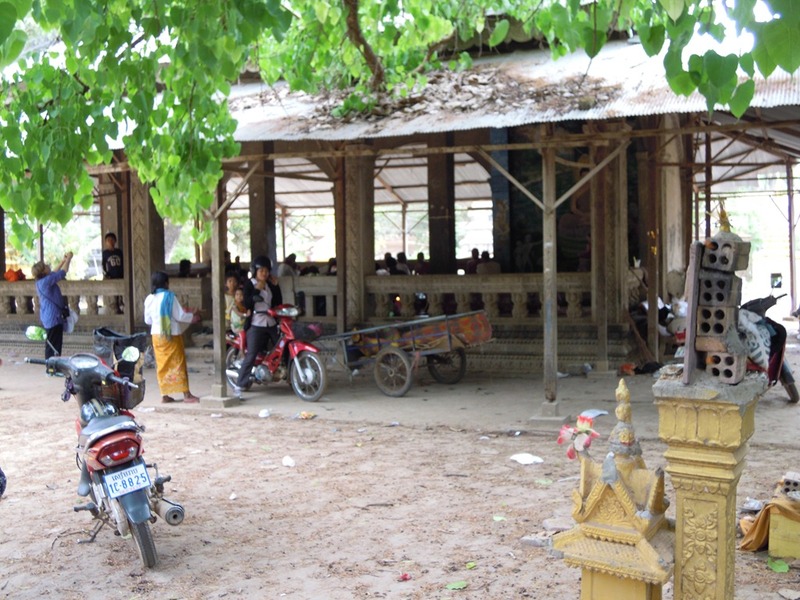 The villages are primarily Khmer and have about 3000 inhabitants among them. Here is a map. 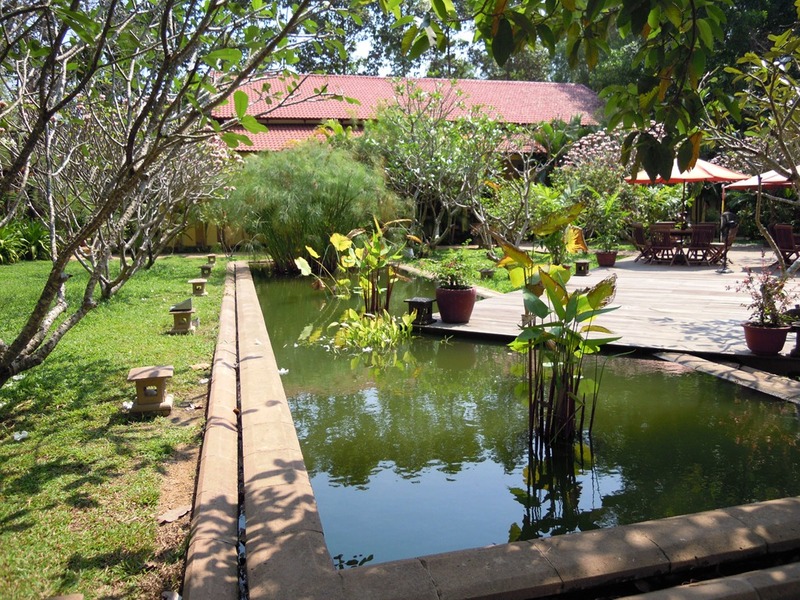 Siep Reap is north of the lake. 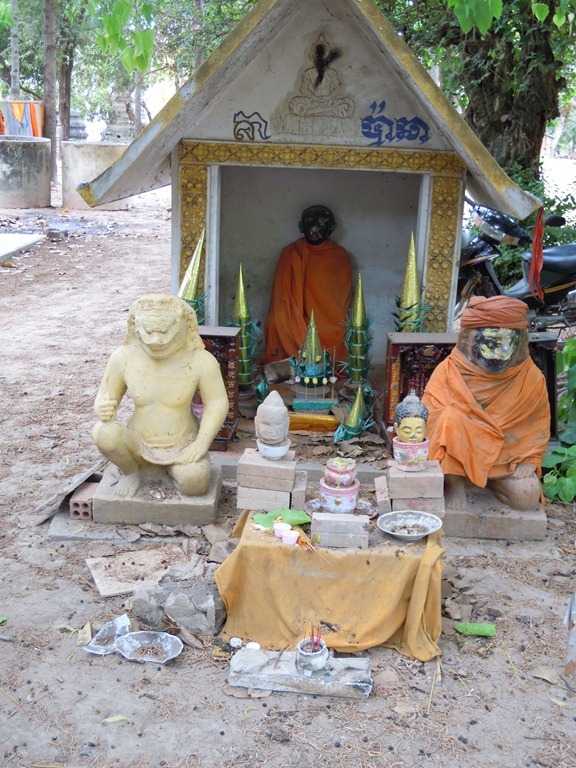 We went southeast out of Siem Reap, maybe 15 KM on the main road. 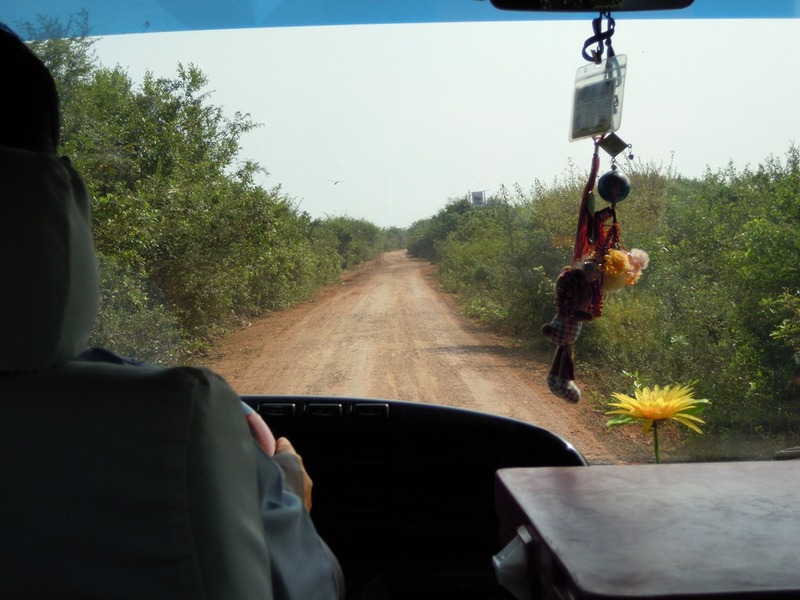 Then we followed a dirt track through some small villages, and into what looked like the wild. 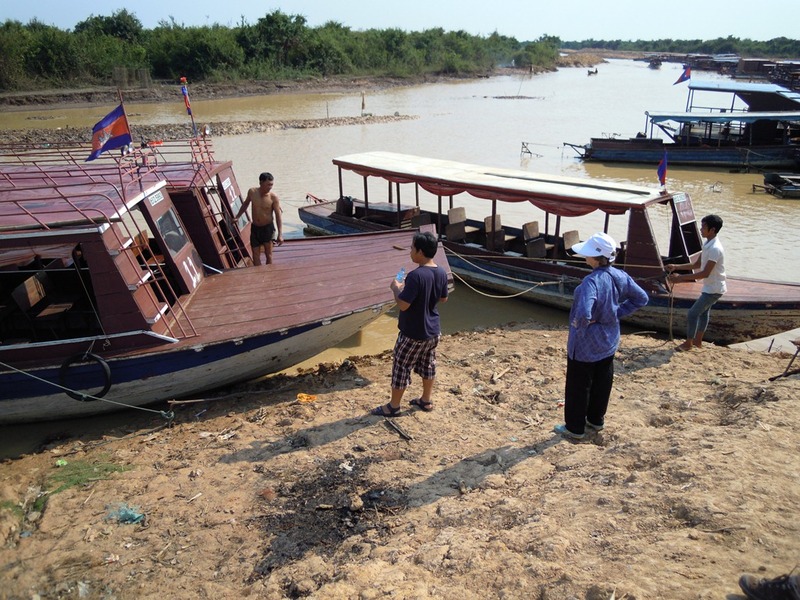 After a while we came upon many boats, waiting for tourists like us. We started out down river. 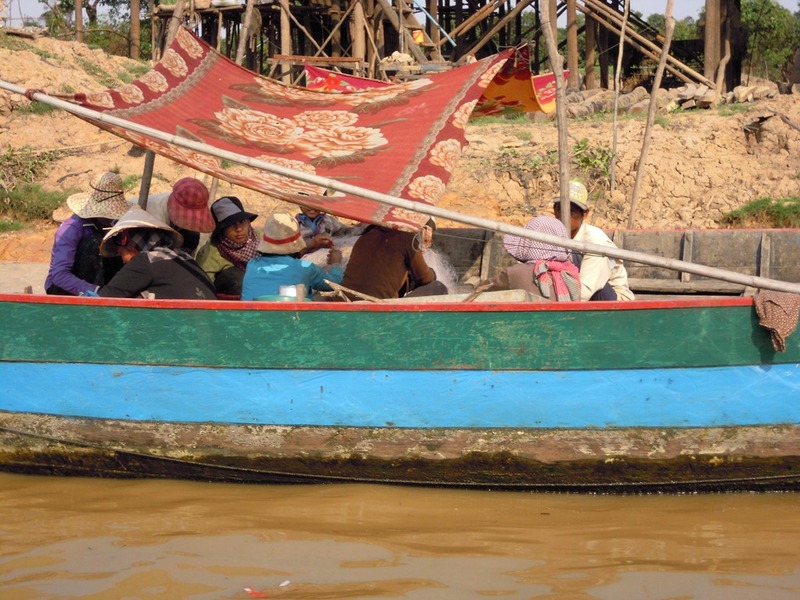 We passed by many boats, hand-powered by locals. Many were tending nets that they had set out on the side of the channel. 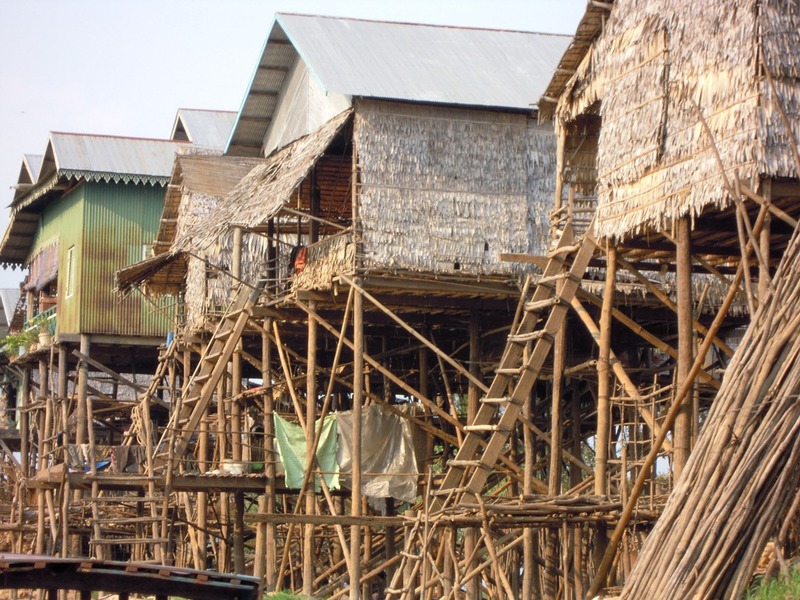 Then we started seeing something the likes of which I had never seen before; houses twenty feet in the air, built upon wooden stilts. 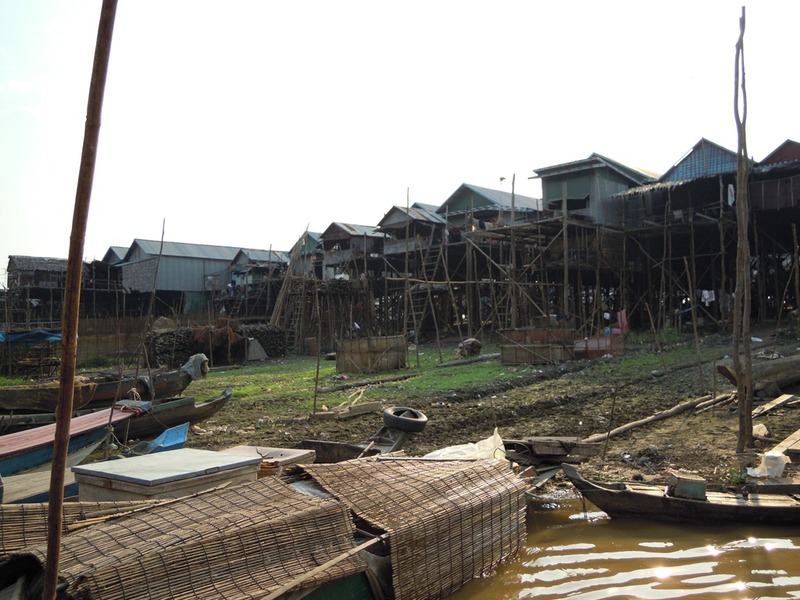 This is a permanent fishing village, and during the wet season the lake expands dramatically as it fills. Later these will look like houses on top of the water. 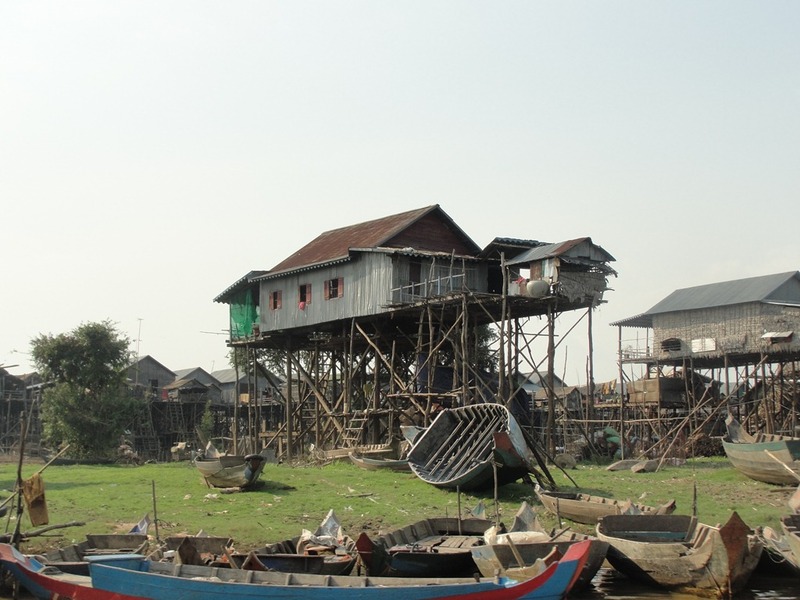 Some structures just float, not on stilts. 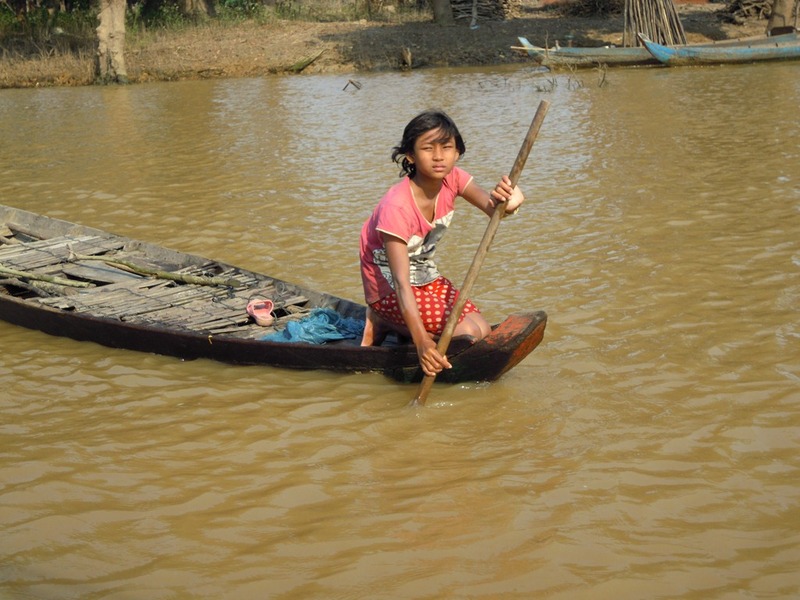 There is another village close to Siem Reap where all the houses (and school and church) all float. Kids at their regular activities. 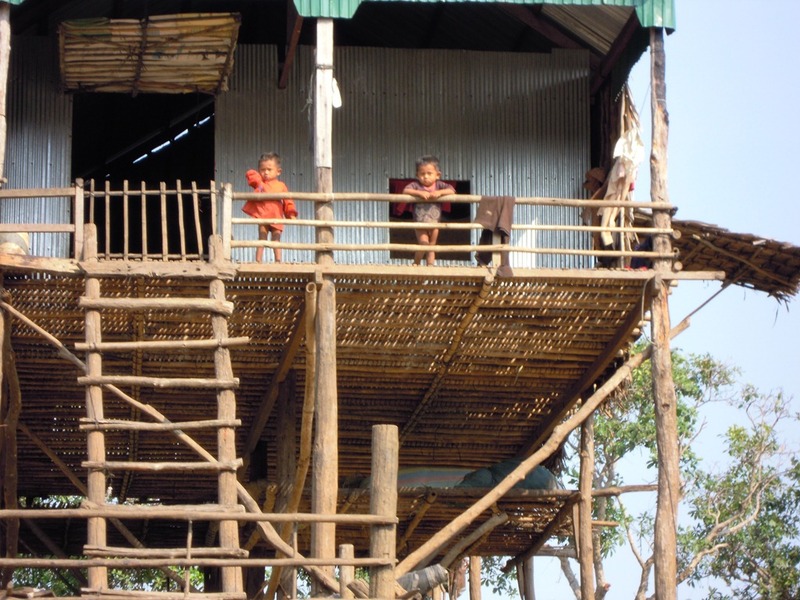 Little kids watching the action from their house. Notice the gate on the porch. We had gates like that when my kids were small. Not as big a fall out of the gate, though. Boys by the water. Be careful in the water. Both Siamese crocodiles and Saltwater Crocodiles are seen in the lake. Besides the kids, the adults were also active. 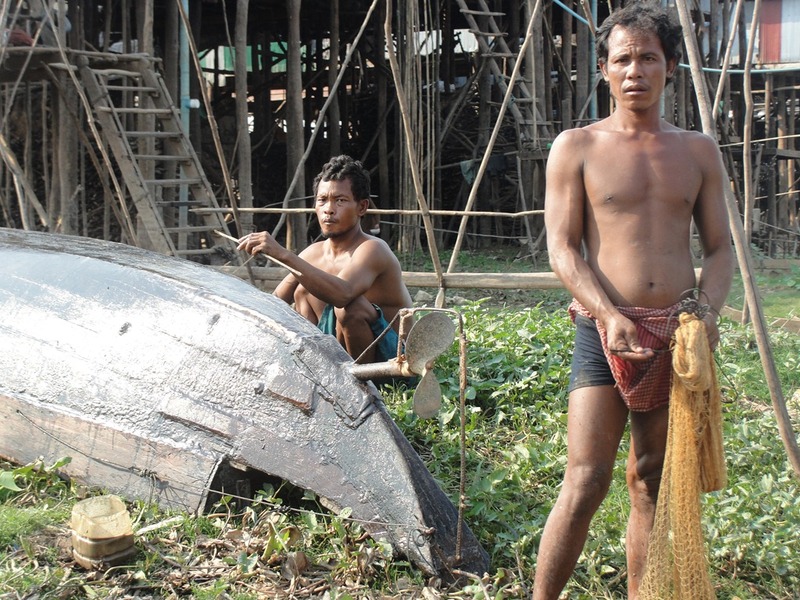 These men are putting away nets and working on the hull of a boat. A group on a boat. I think these are locals. 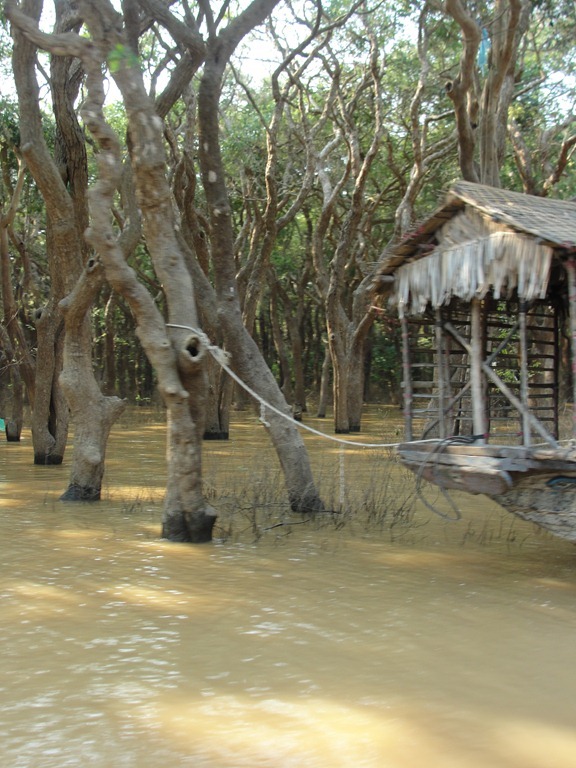 This is what they are like when the water is up (photo from Wikimedia Commons). What a place to live! It looks like several parties got in from fishing. I love how some people decorate their house. They cannot have a garden, so this house has many flowers and plants outside. 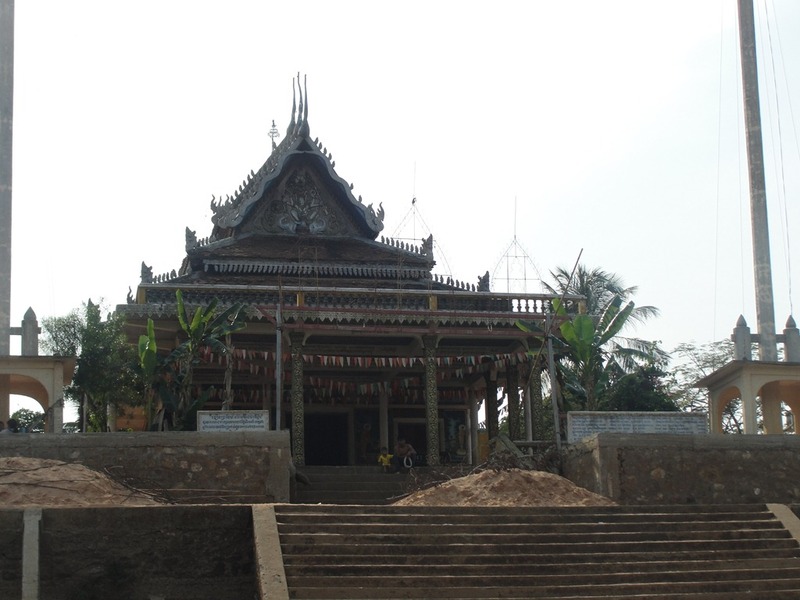 The local Buddhist temple, built on high ground. I wonder if people mounded the dirt to build this up above the water level? 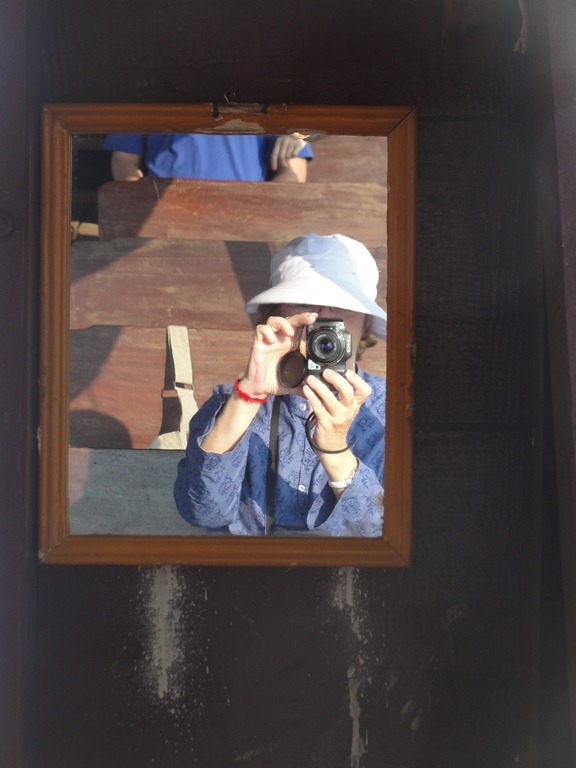 Here is Carol making use of a mirror. 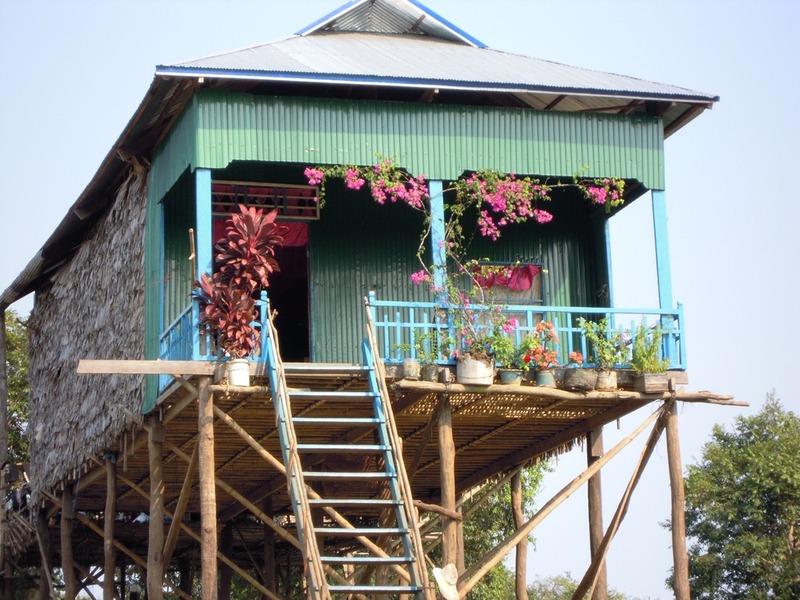 This is a Guest House, so you can come here and stay. I hope you like fish to eat. Flooded area around the village, with a submerged forest. When the water is high, just the tops of the trees are out of the water. What kind of tree are these, to survive in this condition? Here is a fish trap (or maybe a fish pen to keep the catch fresh? 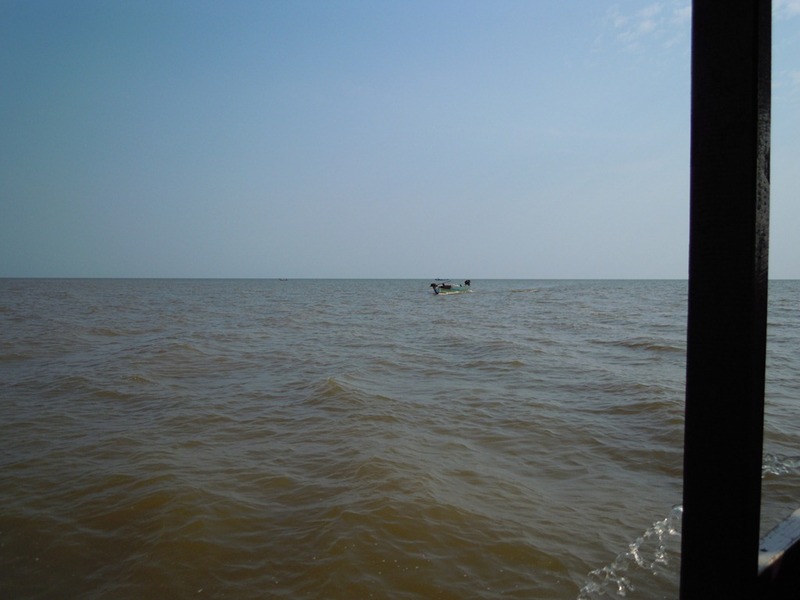 The Tonlé Sap Lake, and its feeder, the Tonlé Sap River, exist as an ecological anomaly. 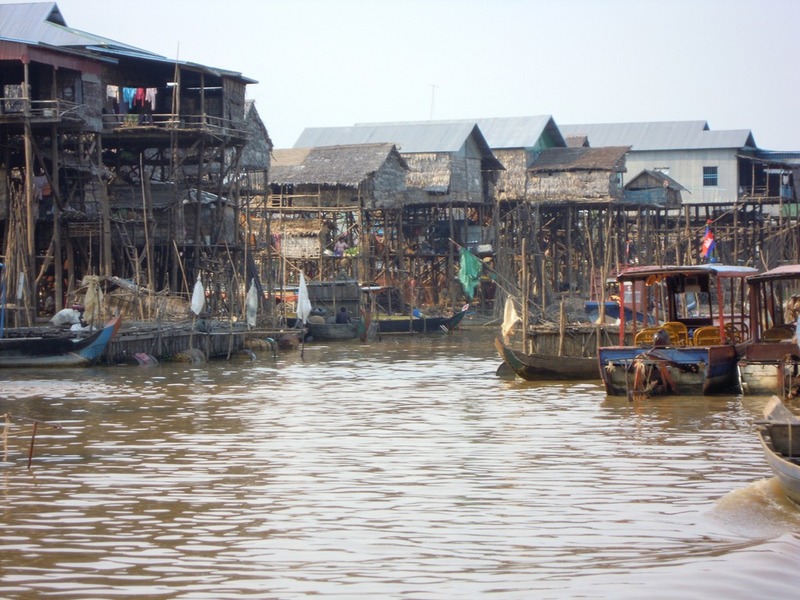 In early June, as the annual rainy season commences, the water level of the Mekong River rises substantially enough to divert part of its flow off its course to the South China Sea and redirect it into the Tonlé Sap River. 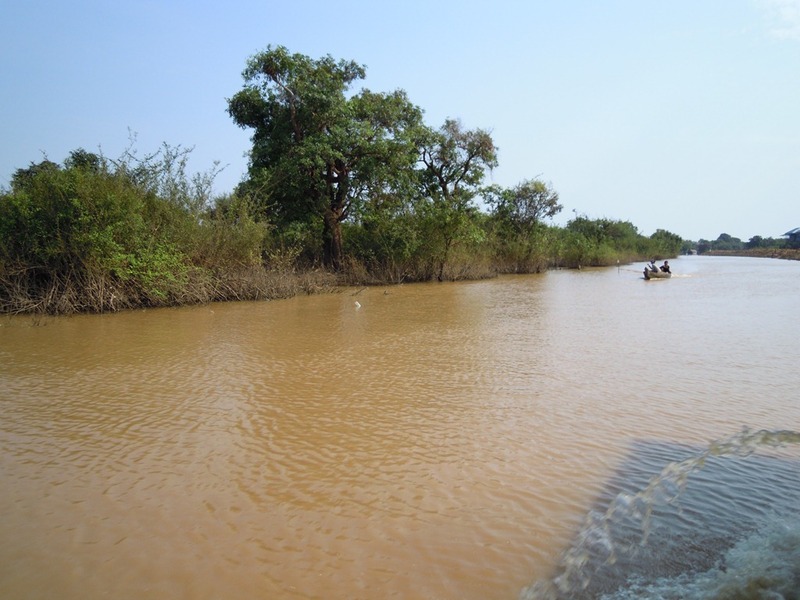 This forces the current of this 100-kilometer long river to reverse direction, beginning a process that by the end of October will see the area of the Tonlé Sap Lake grow from 2,500 square kilometers to as much as 12,000 square kilometers, its boundaries extend anywhere from 20 kilometers to as much as 50 kilometers inland and its depths increase from a mere two meters to as deep as ten. 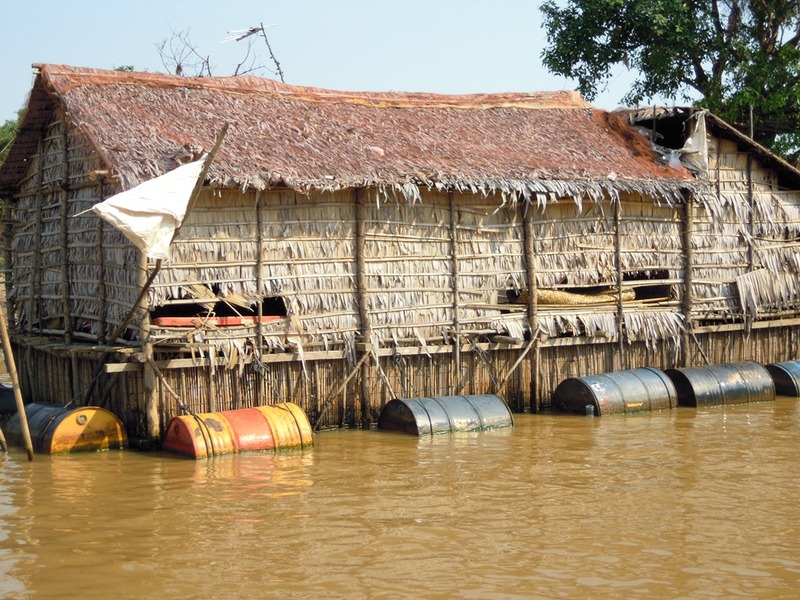 The Tonle Sap is one of the most fish-abundant lakes in the world and the silt deposits left behind by the annual floods have created fertile ground for agriculture. 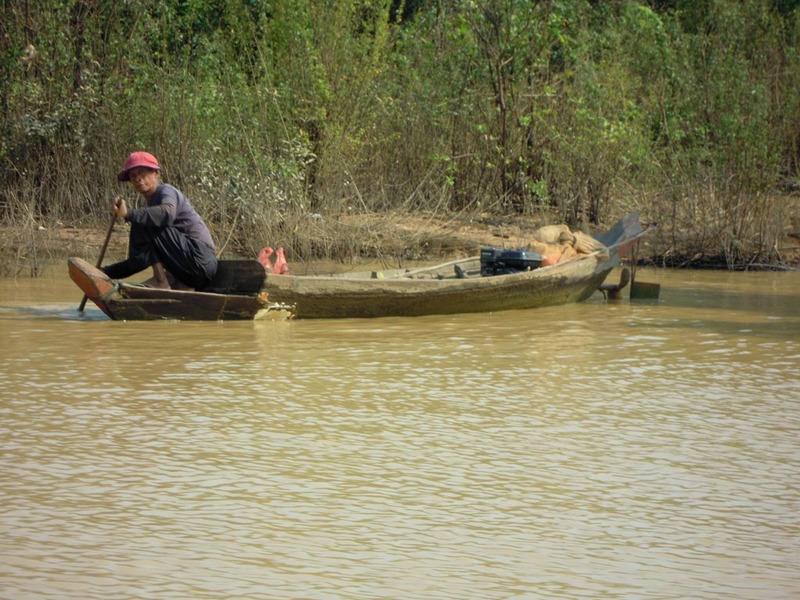 It’s no surprise that one of Asia’s greatest ancient civilizations developed near this lake and today much of Cambodia’s livelihood still depends on its output. 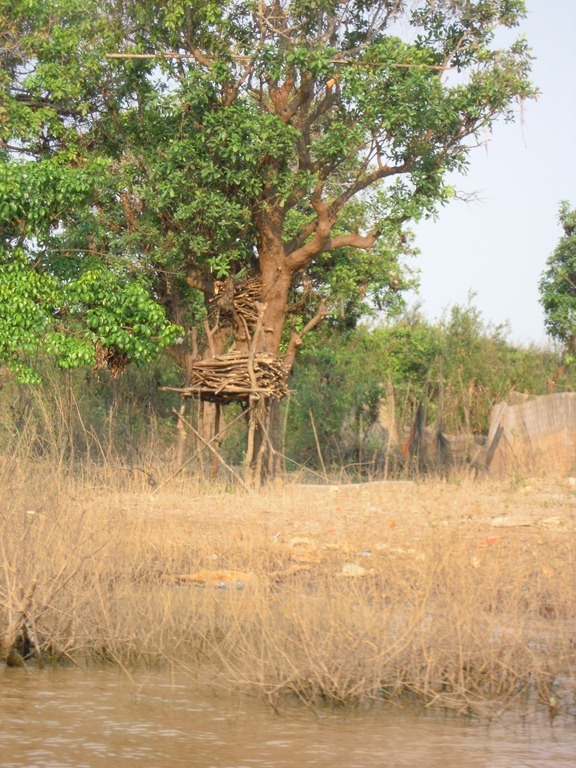 It is also an area under ecological attack, as populations grow, trees are cut for firewood, forests destroyed, etc. There are a number of organizations that are working on this problem. 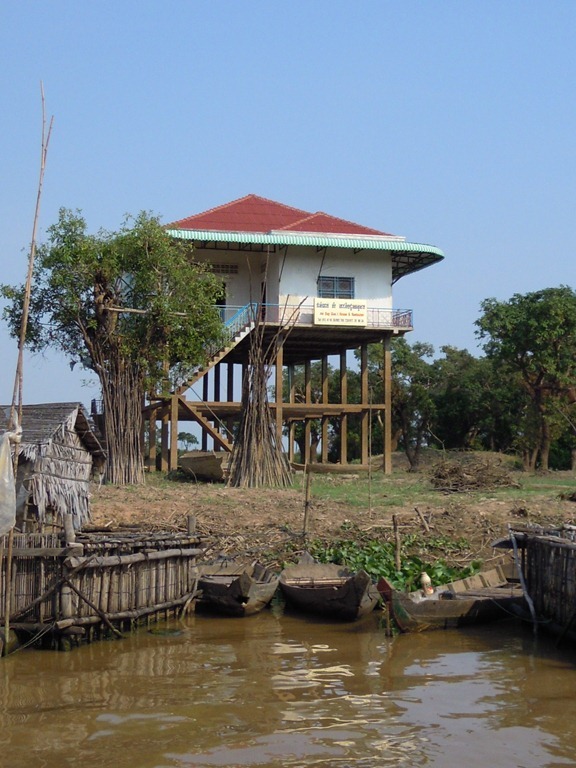 An important one is the Tonle Sap Biosphere Reserve, a UNESCO Biosphere Reserve project. Look at this web site for more information as to the great efforts being done. Boating back through the village. So many houses! It seem funny to see such a crowded neighborhood, way out here in the lake. If you look closely you will see, high off the ground in many trees, wood piles. 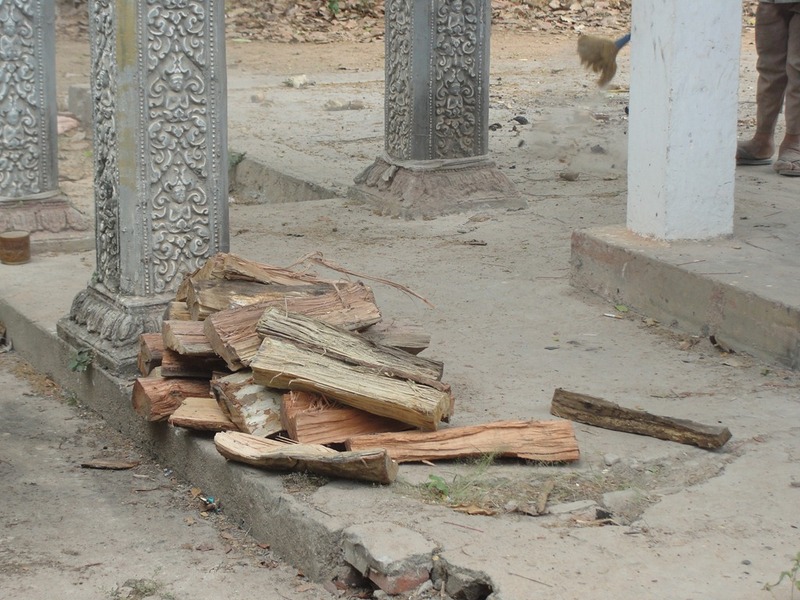 This is the wood that will carry them through the rainy season when the water is so high. 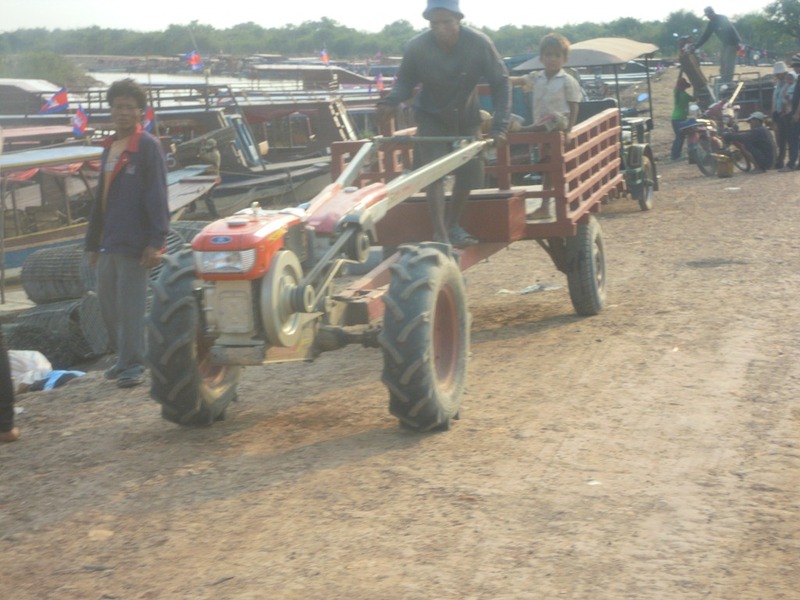 When we got off the boat I saw this small-scale tractor. This kind of tractor is common here, and seems a good adaptation, inexpensive (comparatively) and economical, probably using the same engine as in many of the motorbikes. 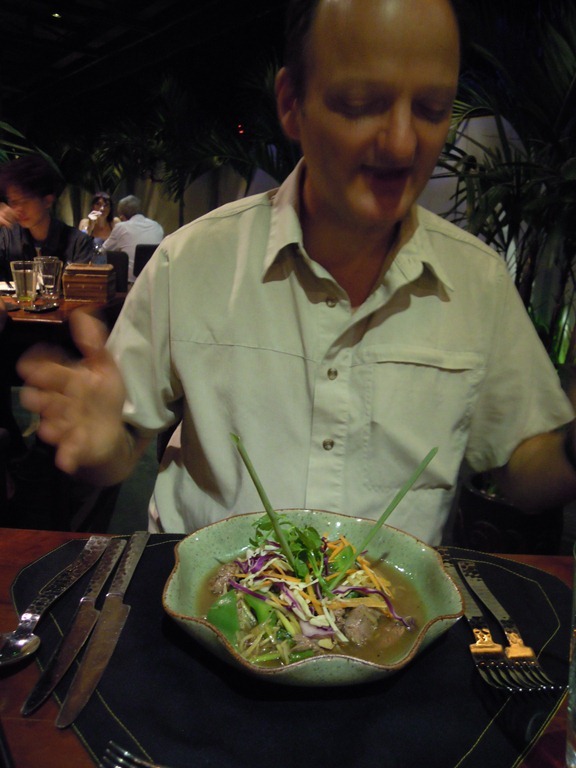 At the end of the trip on the last night in Siem Reap we went to a fancy place to eat. Here is the group. Some of them we have been with through Vietnam and Cambodia, 11 days. 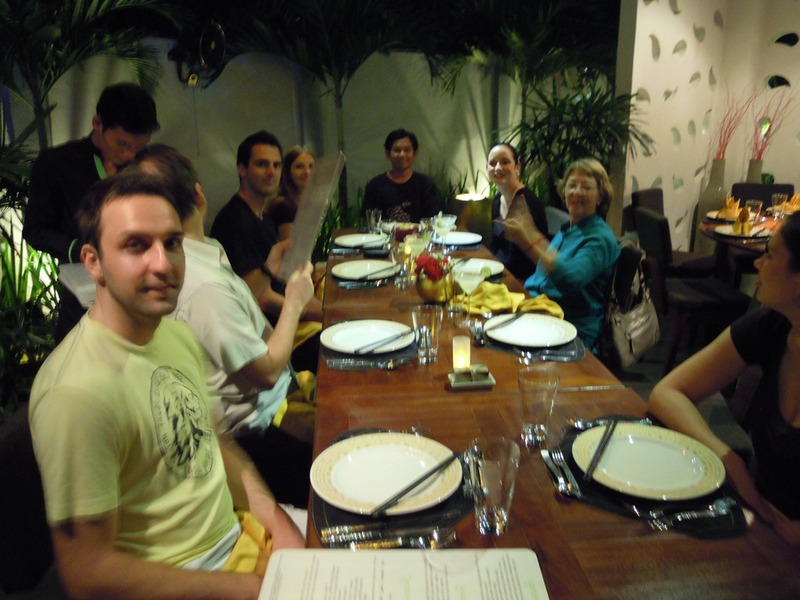 Rong, our Cambodian guide from Gecko Adventure Tours, is at the end of the table. Another beautifully prepared plate of food. 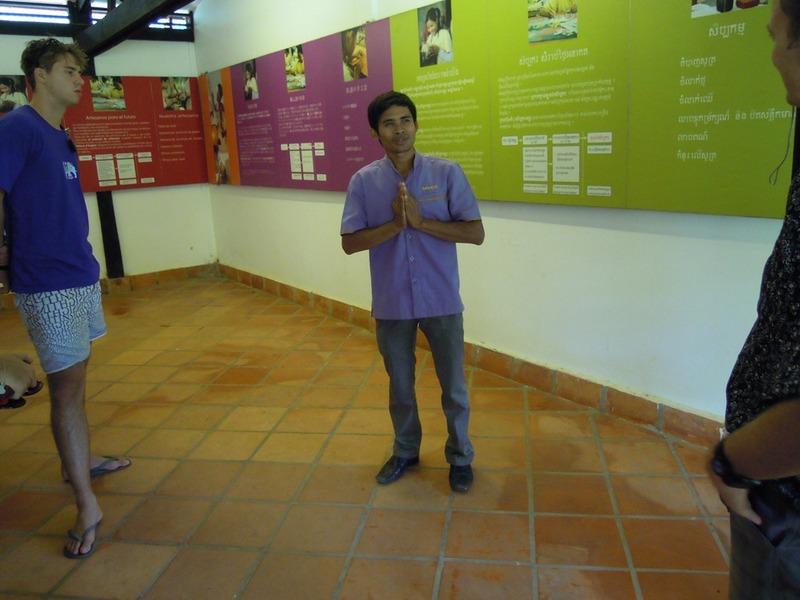 We have really enjoyed Cambodia. The people seem particularly warm. Somehow they seem to have moved past the terrible tragedy of the Khmer Rouge dictatorship and slaughter. 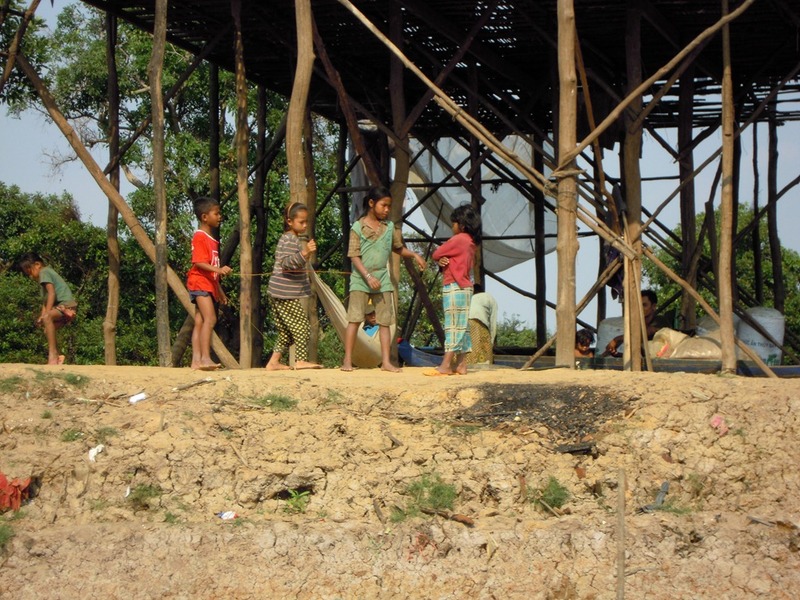 They are working on restoring their culture, and doing the best they can to live a good life and be happy. This part of the tour was definitely worthwhile. There are some other things to do that we did not, maybe worth considering if you are going to be here. 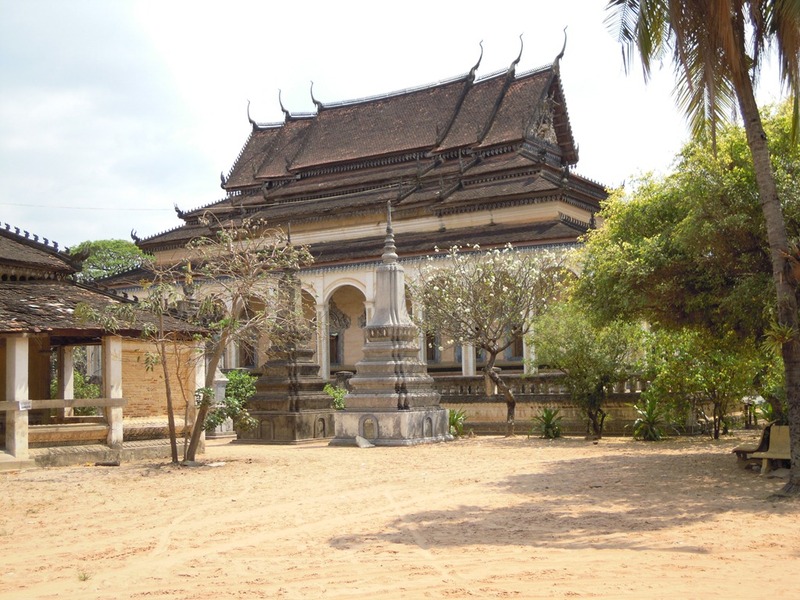 Battambang, the capitol of Cambodia before Angkor Wat. 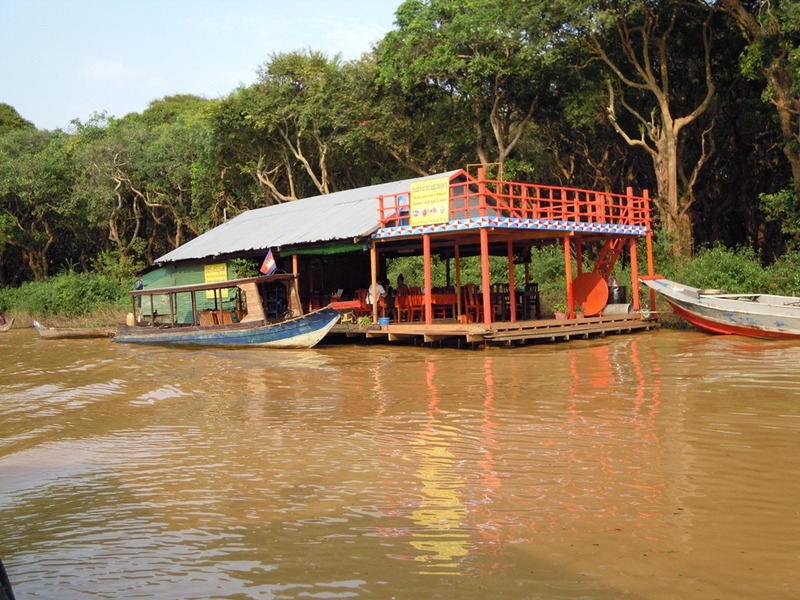 Some say this is a more authentic Cambodian experience. Killing Fields Memorial. 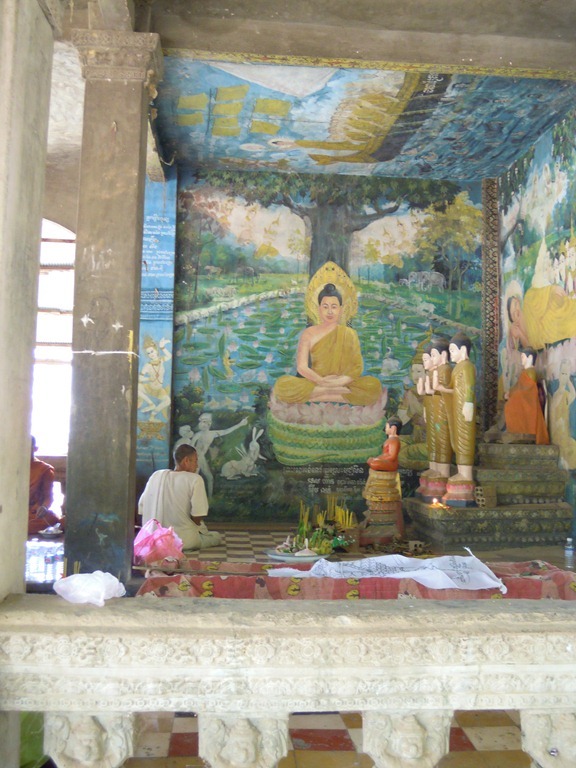 If you did not visit this in Phnom Penh, then do so here. 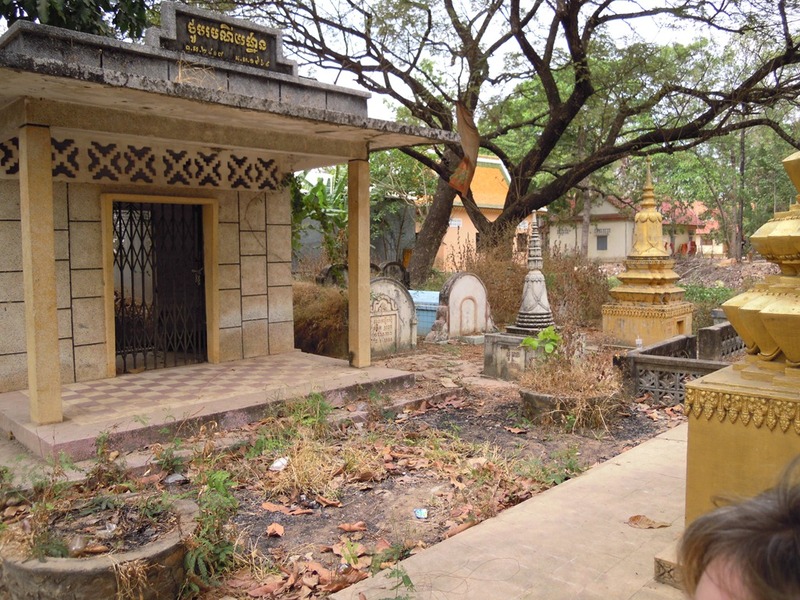 Though not pleasant, this shows a major story of Cambodia. 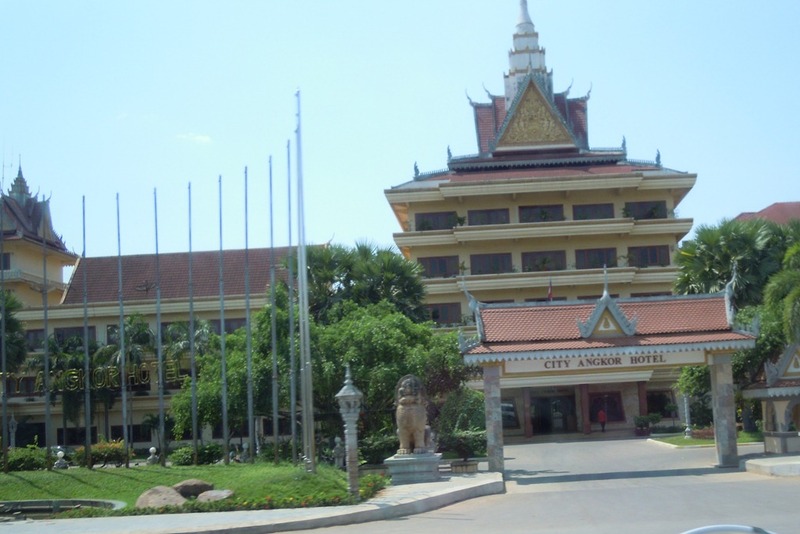 You cannot begin to understand Cambodia without knowing about this.